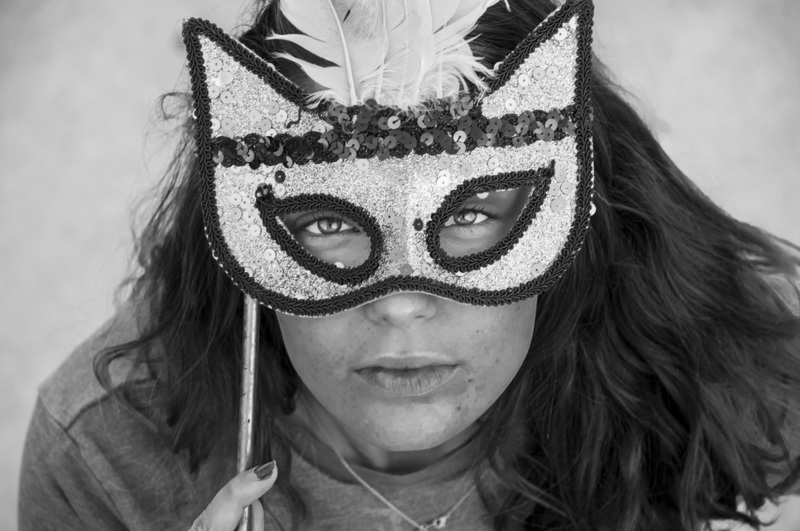 Please take some time to peruse these magnificent photos of my Digital Photo 1 students! I am very proud of the work that they did! 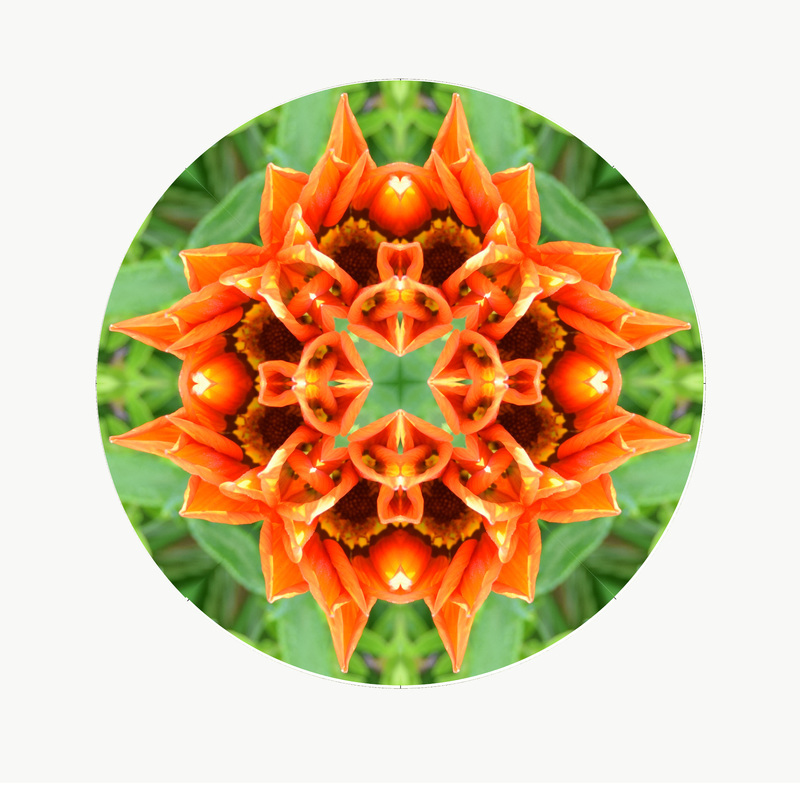 My picture is a mandala that was created by an orange flower. This was taken at the little garden outside the weight room. I titled it The Dragon because the shape the flowers form makes me see a dragon’s face. To create the mandala I made a 4x4 template in Photoshop. I then opened the image and by using the Magic Wand tool I copied the image into my template. You then duplicate the layer and rotate them until you’ve filled in each section. You want to also make sure that they are symmetrical in a way. I thought it was a successful picture because it was the first mandala I’ve ever made and I like how the orange really stood out. I believe that as an artist I’ve improved a lot and I’ve familiarized myself more around cameras. I would definitely recommend this class to anyone who enjoys the outdoors or is outgoing. My picture is a landscape photo that was taken in the duck pond. I came up with the title The Reflection Unknown because of how the water reflects like a mirror the unknown and it leaves it off as mysterious. This picture seems like a pond or a forest, because the water and the leaves reminded me of a pond, as for the trees it reminds me of a forests. I edited this photo in Photoshop and all I did was just brighten up the picture a little bit and contrasted up a little bit. I like this photo because of how tropical it looks to me with the green colors besides the reflection into the water. I also like how it looks like there is a small cave by the water. I wouldn’t describe myself as a professional photographer, but as long as I'm practicing getting the angles right with different positions, then in my humble opinion I’m becoming more successful. As I look at my photos before and after I think my pictures has gotten better not as professional but beautiful. My pictures are more clearer and clean in the way I like to capture them. I named my photograph Vibrant Nature because the colors of the tree leaves, grass and bushes are really bright and vibrant. 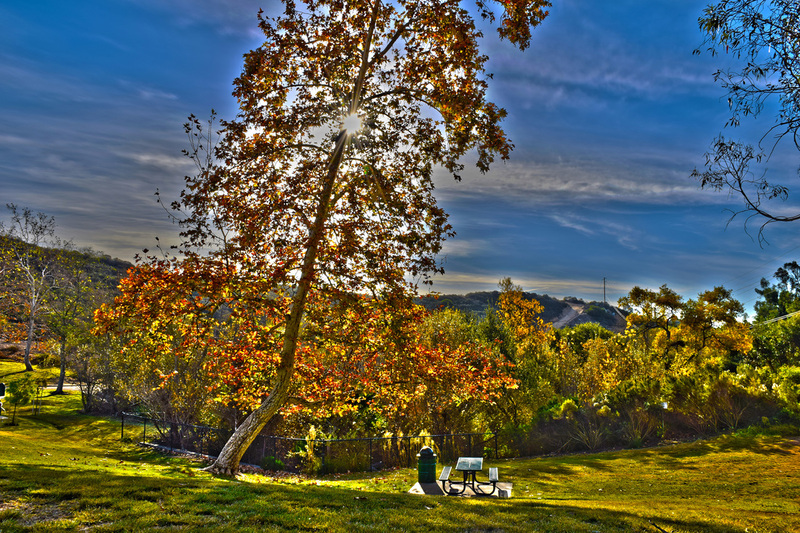 My picture is an HDR photograph of a tree near the entrance of the duck pond’s trails. I went to the edge of the street curb and aimed the camera at the sun while having it stay behind the tree. I then had to take a picture and change the exposure 5 times , which are -1.0, -.5, 0, .5, and 1.0. 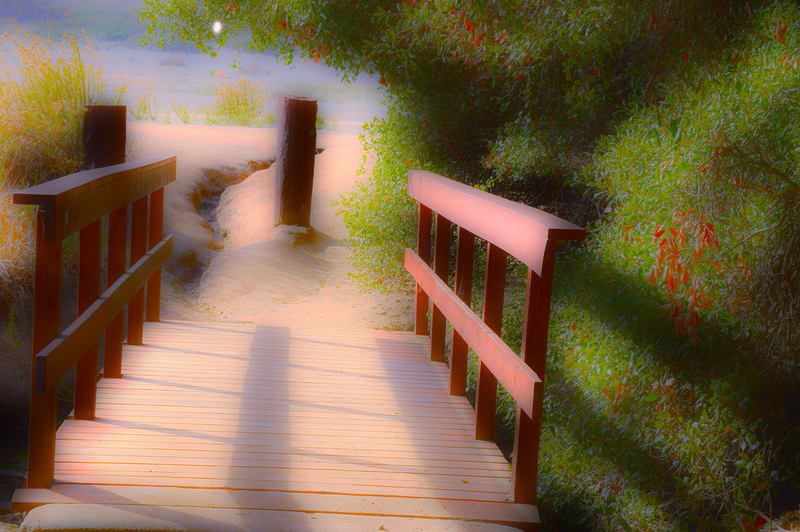 Once I had all 5 pictures, I opened them in Photoshop and I merged them together using “merge to HDR pro”. After they merged into one picture, I used the preset choice “more saturated” which created the bright contrast of the colors. I like this picture because the scenery looks extremely beautiful and nature makes me feel happy. This picture is successful because the HDR intensified the gorgeous colors. Also, it’s the compositional rule “Rule of Thirds”, so the tree is not directly in the center of the picture which allows the area surrounding it to be seen better. As an artist, I am willing to try new things because I enjoy photography, but I do like taking portraits and capturing nature. What I’ve learned this year is that there is a lot more involved in taking pictures than simply grabbing a camera and taking a picture. For example, lighting techniques, changing the exposure and changing the ISO. I’m looking forward to learning something new and creative. I chose to name this photograph Wildflowers because it reminded me of running through a field of wildflowers. 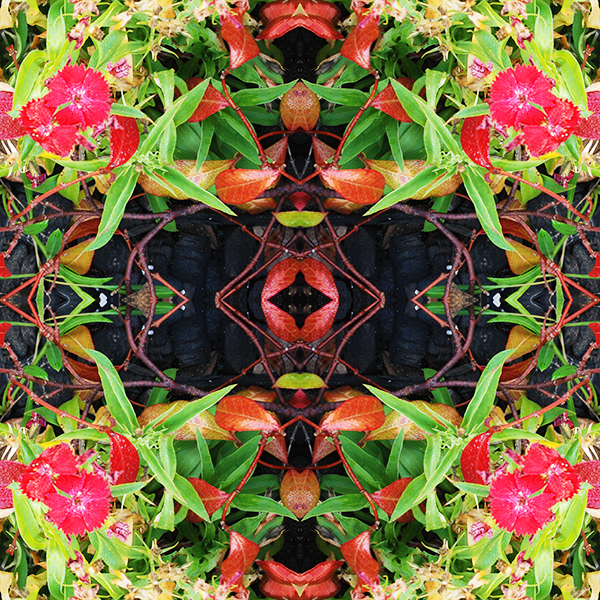 This is a picture of flowers that was made into a tessellation using Photoshop. To make this picture, I cropped the original photo and put it on a circular template. 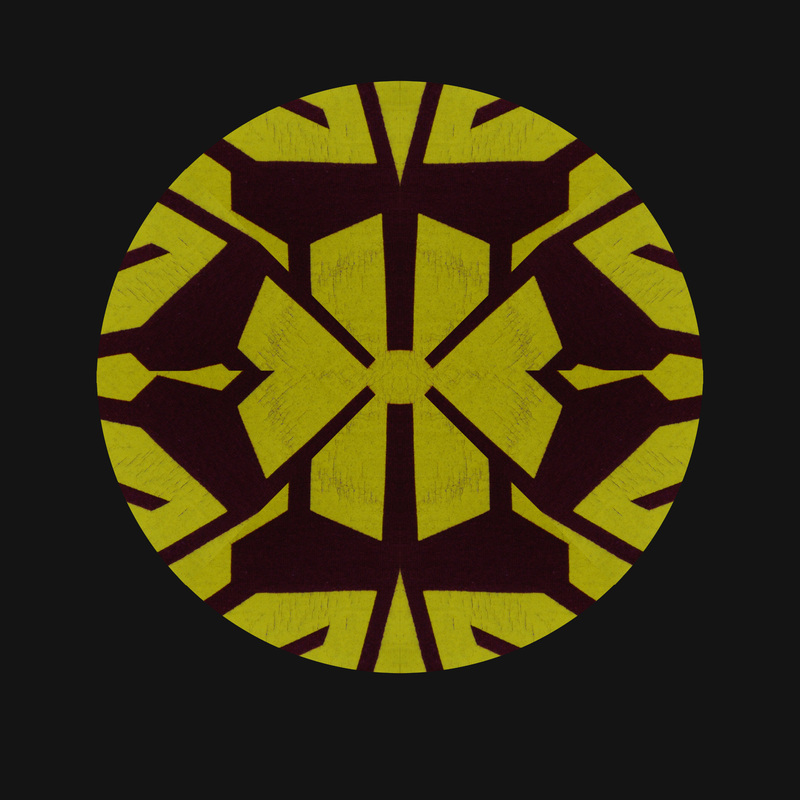 Then I flipped the cropped portion of it horizontally and vertically until a geometric pattern emerged. I like this photo because of the geometric pattern it made and how the brightness from the flowers grabs your attention. I would describe myself as an easygoing artist who loves nature and photography. So far this year I have learned how to use Photoshop and Lightroom along with how to capture specific ideas using my mind and a camera. I look forward to using my creative abilities and new skills to make a difference in the world in the future. 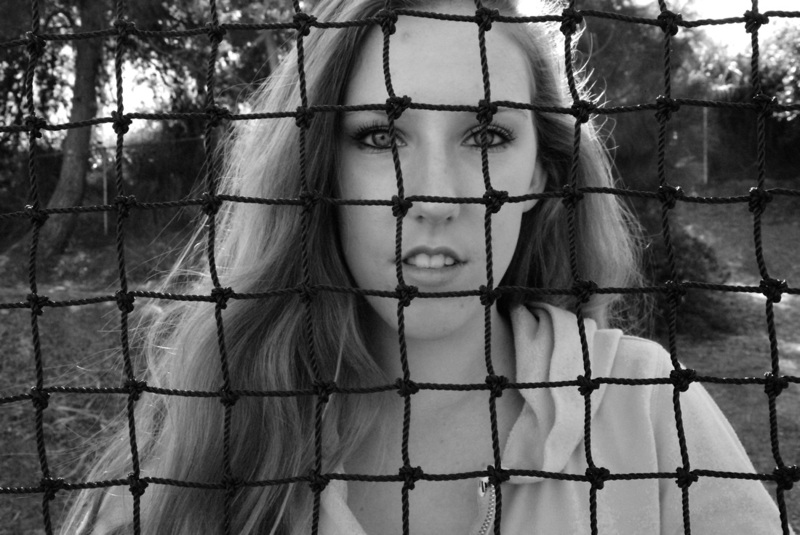 I have titled this photograph Locked Out, because this photograph symbolizes more than just a girl behind a chained fence. This photograph describes women all over the world, not just one, but any girl who struggles to be herself, by all the labels, and standards women have to be compared to. As a woman, we are “chained” behind a fence, because we are afraid to be who we are by the society we grew up in. I edited this photograph in Photoshop by changing the image to black and white. I like this photo because of the meaning behind it- not only is it unique, but it’s deeper than a simple photo. It might not be a successful piece to other people, but I have hope in this photograph and I hope that it can reach out to others, we can’t be chained in anymore, no more labels and standards we have to overcome. If I had to describe myself as an artist, I’d say I’m passionate, I put more than a model and camera into it. I have learned so much this year, not only more about the camera, but more about myself, and what interests me. I’m looking forward to opening doors in the future, learning more techniques about the camera, and learning more about myself. I have titled this photograph Enjoying The View because my sister is enjoying the sunset in this photo. 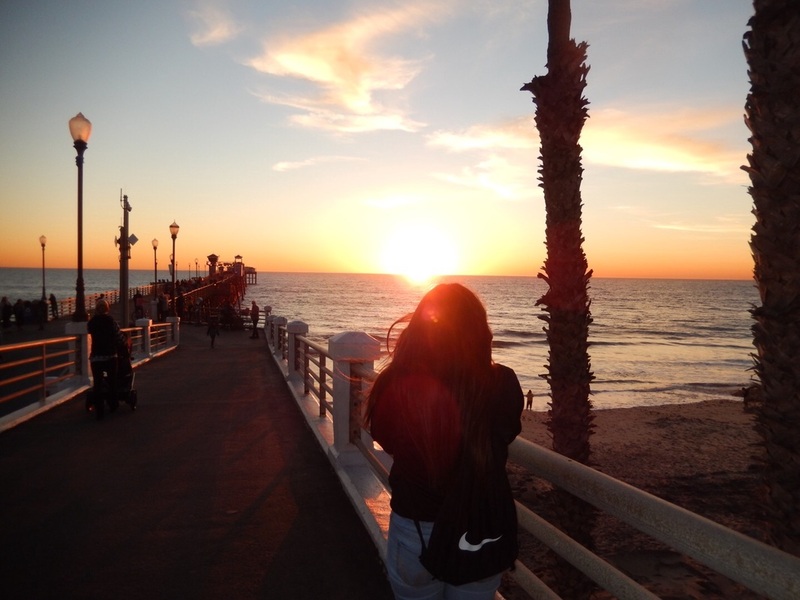 The picture is of the Oceanside pier and it’s my sister admiring the sunset. I used Photoshop to adjust the vibrance and some tones in the photo. I like this picture because I had always written on my bucket list to take my sister to sunset market, since she had never been there before. I think what made this photo successful is that my sister was unknowingly in my photo and she was just enjoying and embracing the wonders of the world. I would describe myself as a in the moment photographer. So far this year I have learned to edit photos better, take photos of better content, mandalas, and I learned more about landscape photography. I’m looking forward to learning more about special effects and converting simple photographs into really complex and cool things. My picture was taken off a Nikon camera and I added a filter off of an app called “VSCO”. The location of the picture was at a small shop in Venice Beach a month ago. I extremely enjoy taking pictures wherever I go and mainly focus on the backgrounds and weather. I drive around the cities and look for murals or buildings. My pictures describe who I am as a outgoing girl. 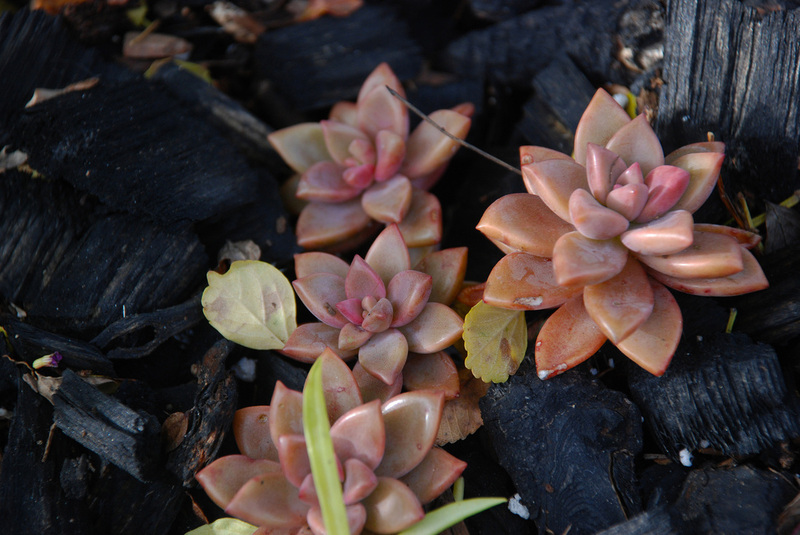 I chose Rancho’s Secret Succulents as my title because they were located at RBVHS little garden behind some classrooms. 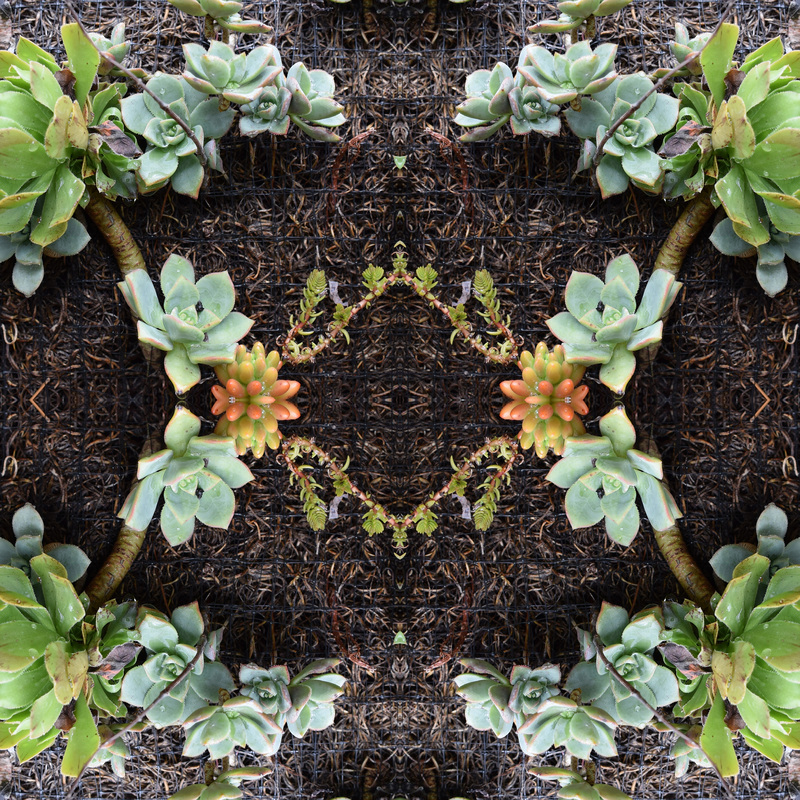 My picture is a tessellation of a cropped photo of several succulents. I created this tessellation in Photoshop. 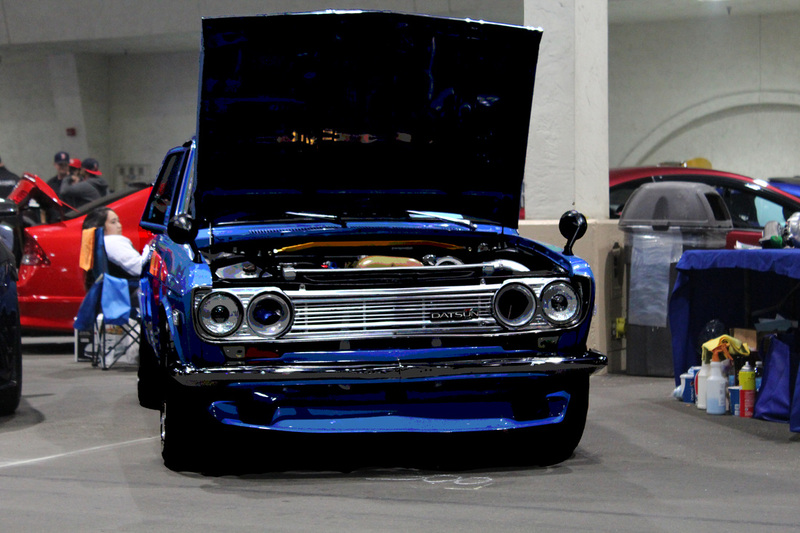 I like it because the photo is symmetrical and it was successfully created. I would say I am slowly discovering my artistic side. This year I learned how to use Photoshop correctly and I look forward to using Lightroom more often. I titled this picture Accomplishment because graduating from high school is a huge accomplishment. My picture is a photograph of a person graduating and wearing his cap and gown. To make this picture I took it from a worm’s eye view to make sure that the whole person came out right in the center and then just adjusted the brightness in Photoshop. I like his picture because I’m graduating this year and it’s a good thing to know that I’m going to be wearing my own cap and gown soon. I have grown as an artist because I have learned a lot about the different modes that I need to have my camera on to be able to take a nice and focused picture. I titled this piece Into the Green because of how green it looks and that it looks like a weird bush. 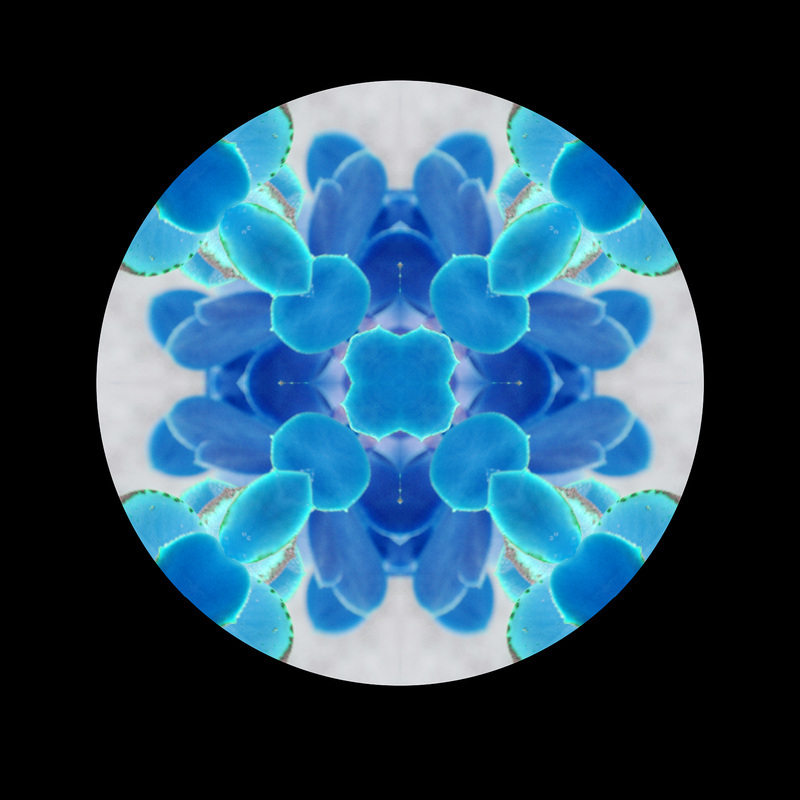 It is a picture of a plant outside and I rotated it to make it into a circle mandela. I used Photoshop to rotate it and enhance the image. I like it because it looks very original. I think it is a successful photograph because of how mesmerizing it looks. I think of my self as a weird artist. I want to do something different from everyone else and make it my own work. I learned many things this year from taking photos to editing them in Photoshop. I am looking forward to learning much more about photography in the future. My mandala is a photo of a shirt I put together. I called it Auto Ops because the original photo is a picture of an Auto bot symbol and in the middle of the tessellation you can see a symbol for a game called Black Ops 2. I haven’t done any crazy things to the photo in Photo shop besides making the mandala it’s all original. What I like about this photo is it brings the gamer symbol to life with the black ops two symbol hidden in the middle. I describe myself as an artist as new and not much creative but could make something out of nothing. I’m looking forward to learning new things in Photoshop. 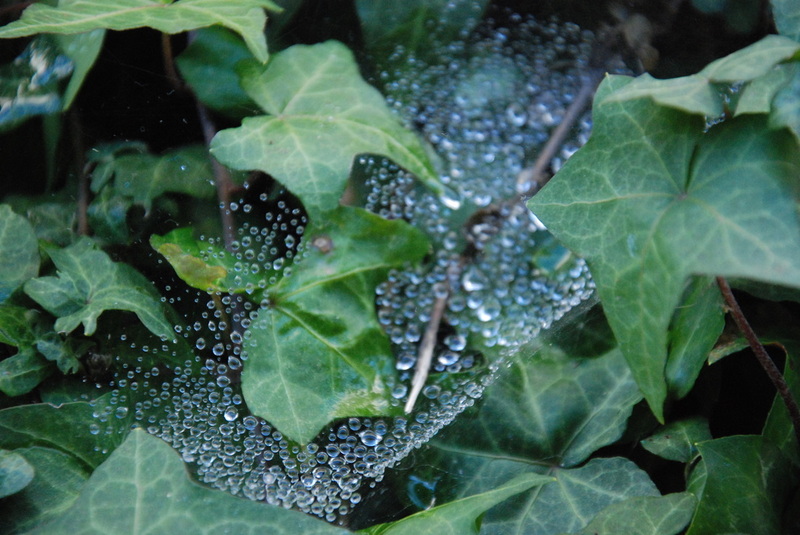 My picture is a macro photograph of a spider web with water droplets in it, taken by the RBV counseling office. I name it The Day After because it’s a different type of picture taken of rain a day after it has rained. I did not use any editing or Photoshop. The picture shown is what it was when I took it. What makes this photograph successful is that it really captures the detail in the droplets in the spider web and you can’t even see that it’s a spider web it looks as if the droplets are floating. I would describe myself as adventurous and enthusiastic as an artist. Through the past semester I have learned how to use Photoshop and the settings on the camera for certain settings (indoors and outdoors). I am looking forward to learning more in Photoshop and taking more successful photographs. I named this photograph Bullseye because from the center outward, it looks a bit like a bullseye. 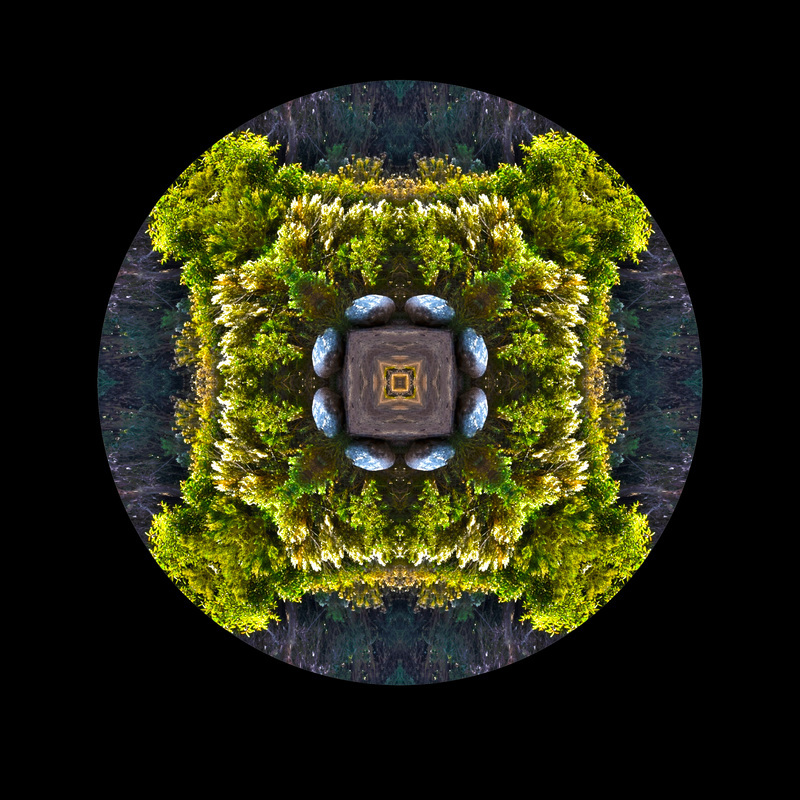 The picture is of a bush with a rock next to it that I turned into a circular mandala. I used photoshop and used a template to make the mandala, the photo itself has some HDR editing. I like the photo because it looks really cool and it is hard to tell what it is originally of if you were to see the original photo. It’s a successful photo because it came out as intended. I enjoyed taking photos and plan to take some that are much better. I look forward to learning new techniques to perfect my photographs. 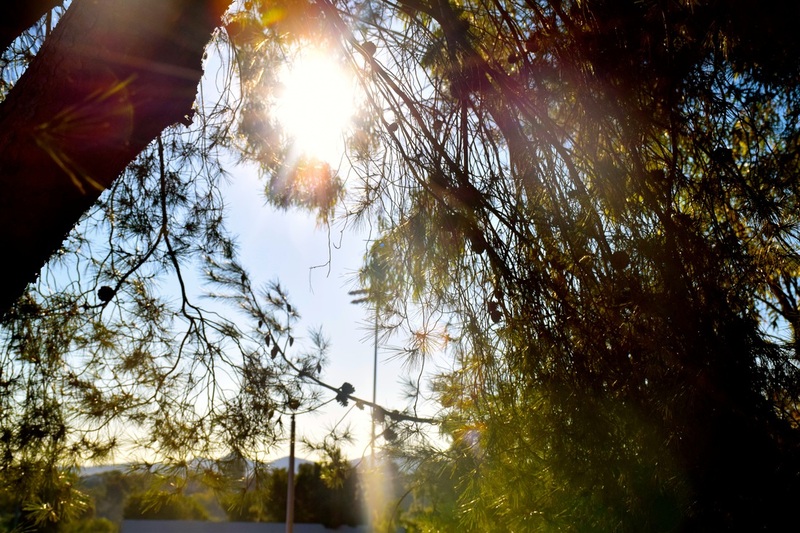 I titled my photograph The Tree of Hope because of how the bright background and the branches make the tree stand out and looking at this picture gives me great hope, expressing that the future will be bright which will give me hope. 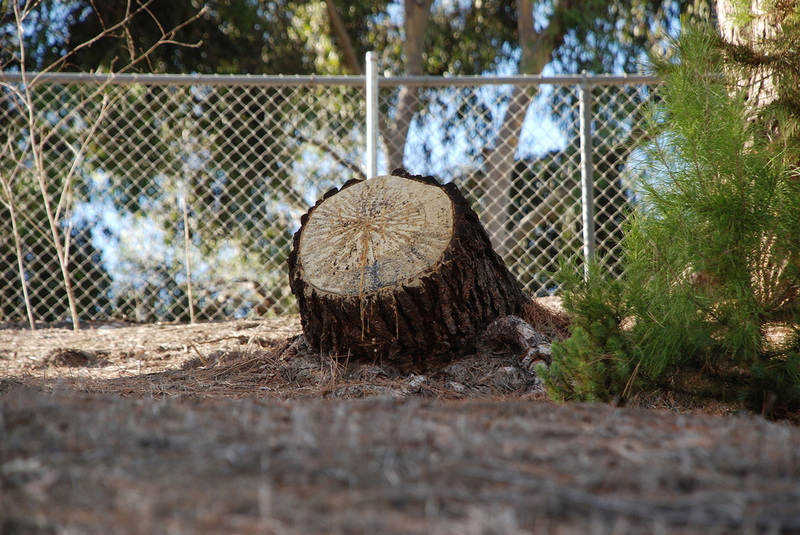 This picture is of a tree from when I was cheering on my friends at their race. All I did to make this photograph was by using my camera on my phone. I didn’t do anything special to it. After taking this picture and seeing how it ended up so beautiful, I knew from one look at it, it was the best picture I’ve ever taken. I love how vibrant it came out. It’s a successful photograph by how blissful it looks and how it lifts your spirits when you take a glance at it. I would describe myself as an artist who puts her emotions into the creations she makes. I’ve learned how to use different parts of a camera I haven’t before, such as the exposure, ISO, aperture, and so much more. I’m looking forward to gain more knowledge as time goes on because in the end, it was worth every minute of it. I gave my photo the title of WOW because of the obvious wow you see in the shot. I also call it WOW because that was my initial reaction to seeing the photo. 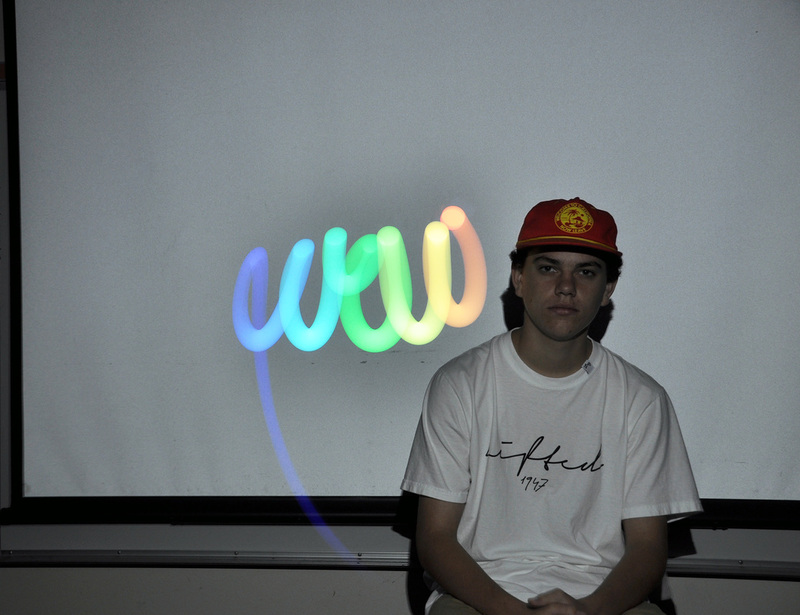 This is a picture of Jacob Bishop taken during our light painting project. When it comes to what I did to make this photo was that I simply used an app on my phone called “My Light Paint” to emit the light seen in the shot, next I slowed the shutter speed to one second so I would be able to catch the light trail emitted from my phone. My favorite part of this shot is that it required no post editing which I believe is the best way to create a photo. What I think makes this a successful photograph is the fact that it looks like an album cover and that everything is in focus considering I took this in complete darkness. If I were to describe myself as an artist I would say I am the awesomest artist around. ​I titled this photograph Bridge because of two things. One it’s a bridge and two because sometimes you don’t know what could be on the other side of a bridge. This is a picture of a bridge at the duck pond. What I did to make this picture is Photoshop. I like this picture because of the color of the bridge and the trees. I think this is a successful picture because of they way the color contrast just pops out the picture. The way I would describe myself is as decent. I describe myself as decent because I still have tons to learn about photography. What I learned so far is that with pictures you should express yourself and take your time on your photos. You should not rush them because if you don’t do the work it won’t come out the way you want them to. What I’m looking forward to is to taking more pictures and learning how to take different types of photos. This photo is called Simplicity because of it's true nature. 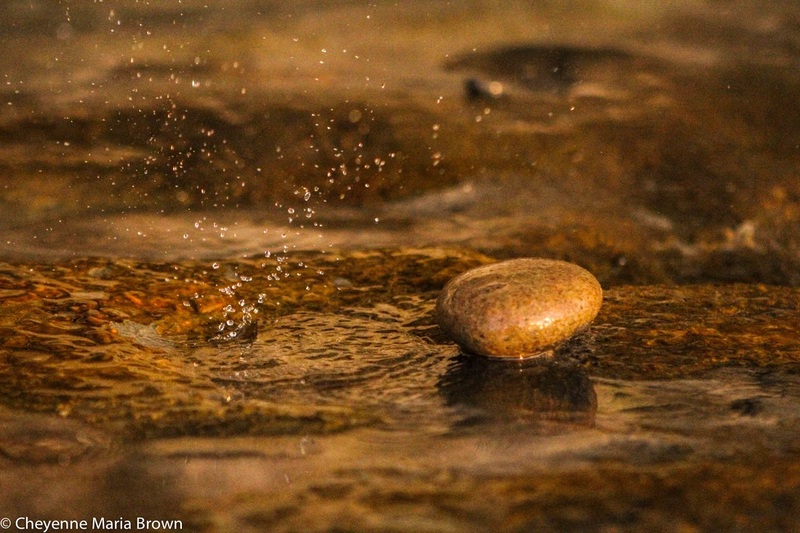 It is simply a picture of a water droplet and a rock. The two opposites work together and create a pleasant image that you wouldn’t expect. 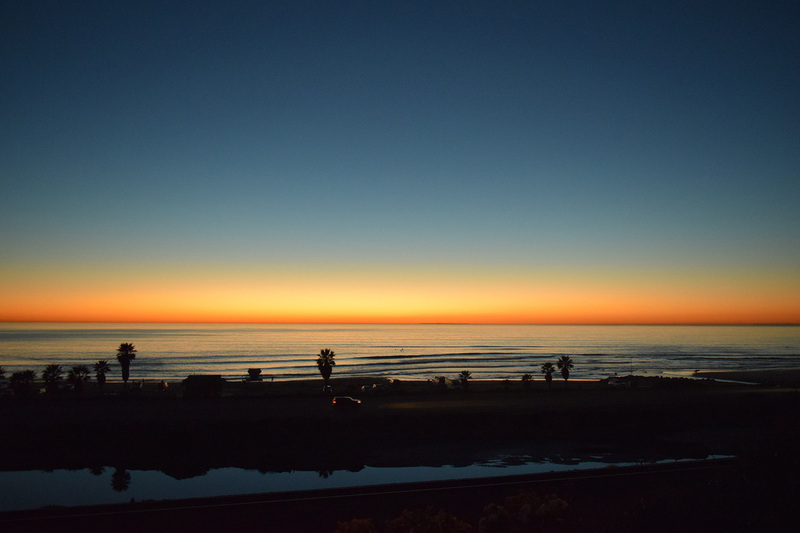 I took this picture at moonlight beach as the sun was starting to set. The rock wall behind it was lighting up and created the perfect background. I didn’t do anything drastic in photo shop. I warmed the photo, tinted it slightly to the pink side, increased the clarity, and brought the exposure down. I like this photo because it looks like something that could be wallpaper on a computer. It’s important to me because it’s a picture that focuses on the simple things in the life not the big picture. This is something I can relate to because that’s how I look at life a lot of the time. I have learned so much this year, nothing is as important though as the skills I have learned on making us use the manual setting. I look at myself as a very versatile with a passion for sports photography. In this class I am looking forward to learning more about all the things that Photoshop can do. My picture is a landscape photo taken at the duck pond. I titled it Simplicity because the picture gives a peaceful feel. I edited it in Adobe Photoshop to make the gritty, brownish filter. I like this photo because it perfectly represents what I enjoy taking pictures of, peaceful nature scenes, which makes it one of my most successful photos so far. I’ve always known one my passions is nature, which is clearly shown through my photographs. This year I have learned how to better capture nature and make the photo more of what I want to capture. I am looking forward to the opportunity to take more pictures of nature. I titled this photograph Pretty in Pink because of how much black there is in the photograph and then the pink is just the only thing standing out. This is a picture of flowers surrounding and planted in black woodchips. I didn’t do much to the photograph, I used Photoshop to make the colors pop out just a little bit. I like this photo because of the colors, how the black makes the flowers pop out, as well as the blurriness in the background and the little details I captured in this photograph. I think this photograph is successful because I used the rule of thirds and the colors are bold and dark, but also has the light colors like the pink on the flowers. Describing myself, as an artist, would be using black and white, but also using color, but making the picture a little dark, but still have that one color stand out. When exploring the vast halls and sidewalks at school, I noticed that it was a temperature between 45-48 degrees. Arya and I were freezing to the point that our hands were numb. But our hopes weren’t over until we managed to capture something worth the cold. 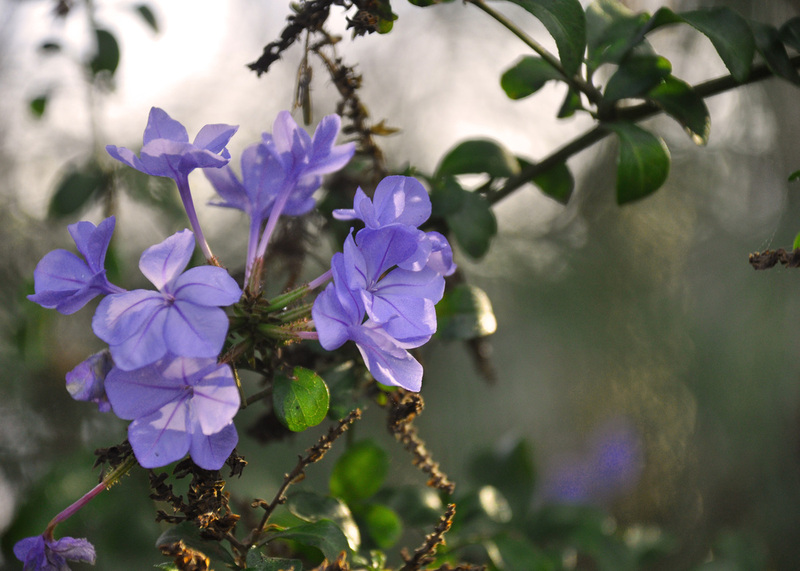 Soon, hidden from the bushes and branches, I notice these fully bloomed indigo flowers and decided to take a picture of them because it was standing out from the rest of the other withered plants. While taking a couple of shots, the sun rose in our direction. Soon, warmth surrounded us; it was as if we were engulfed in springtime as the colors in the environment gave more vibrance and hues. Finally after laughing of relief and praise, I caught this one picture that really caught what I was aiming for. I love how this picture looks. It’s as if it were spring during a sunrise, but in reality it was actually in winter’s cold days with minimum sunlight. But overall the main reason of why I love this piece is that Ayra and I went through a rough time seeking something to capture, but we toughen it out by telling goofy stories and singing songs that we love. I think this photo pictures that memory of us being goofballs and having fun, even in the not so great days. That’s why it makes it a successful photograph for me. I’m more of a expressionist artist, an artist who desires in telling stories about his/her pieces because I believe that everything you do has a significance that can either express or shape who you are. In the progress of this journey, I’ve learn that patience is the main key in taking a good photo but most importantly is having fun and be free because those vibes bring the best out of anything. I’m going to lean towards more fun and liberating adventures in photography that’ll help shape who I am. This picture is called the Swag-Illuminati because as you can see, the photo has both swag and the illuminati. Some would say, the photo is even ILLUMISWAGGY. It is a picture of a classmate waving a light around with the lights off. I took a photo with really slow shutter speed so the light could all be captured. 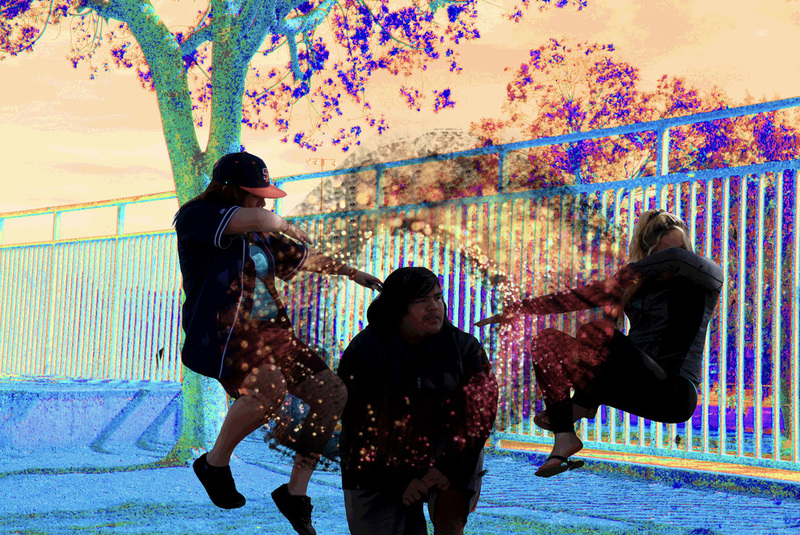 No extra editing was done because the photo is already swaggy. I like it because it looks pretty cool, not to mention I am a fellow piece of work that has swag. I think it's successful because I like it, and that's really all that matters. If I were to describe myself as an artist, I would have to say that I am swaggy and have tons of swag. I’ve learned that I enjoy classes like this and how to take HDR photos. I’m looking forward to learning anything useful to me. Thanks for reading the swaggy story. I have decided to enter my photograph Reeducation for the mid year gallery. 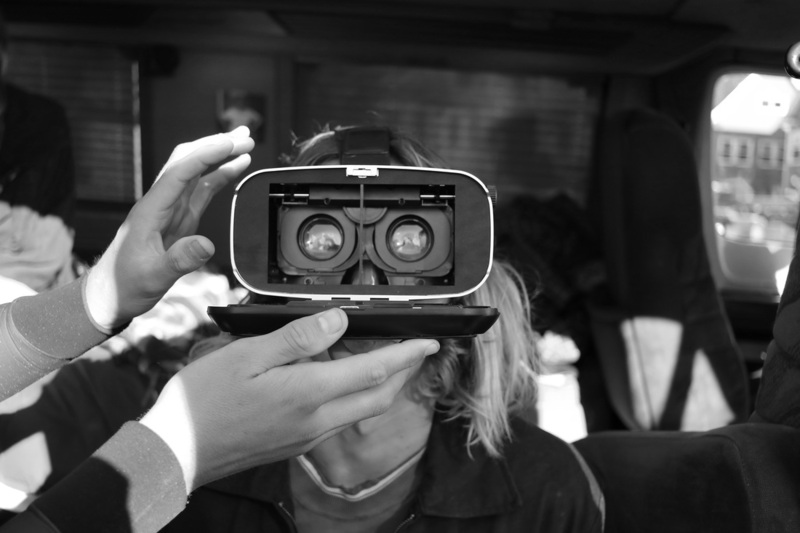 I named the photo Reeducation because the subject of the photo, my friend Alex, was wearing virtual reality goggles that belonged to someone who was there, and the photo, with the administering hands, makes it look as if the subject was being brainwashed with some strange machine strapped to his head. The picture brings me some joy, and I hope others will enjoy the strangeness of the photo as I have. As far as the development of the photograph, I took the photo with my Canon T6s DSLr, and I desaturated the photo in Photoshop to give it the 35mm appearance. As I’ve said, I like it because it looks strange, and it’s successful because I think that, there is little use in trying to put values and scores on photographs. As a photographer, I like to take pictures of people, and document things that are happening, and I hope to grow even more in these areas, as I plan to be a Combat Journalist in the future. 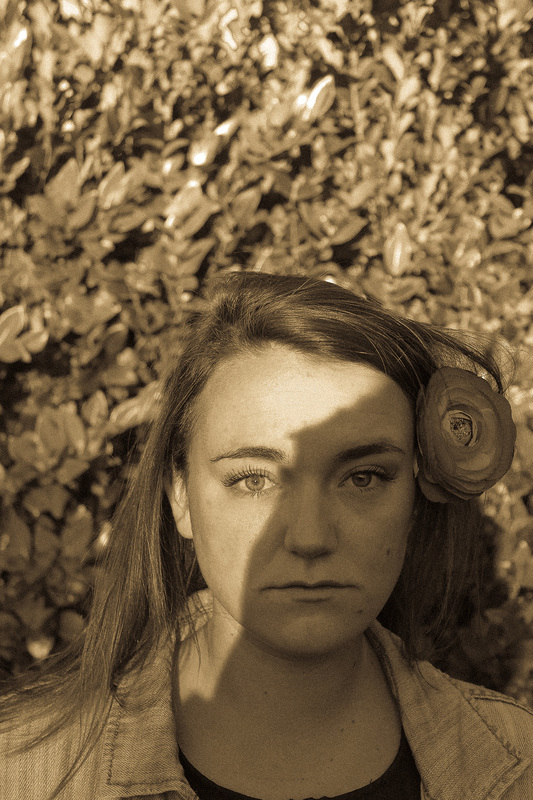 My picture is a portrait from my Robert Frank recreation assignment. I titled it Hold because my interpretation when I stare at this photograph is that she is holding onto something indescribable. The emotion within her eyes is says many contradicting, conflicting, complex, heavy words. There’s pain but there’s confidence. There’s boldness yet there’s meekness. I photographed my best friend Ivory because I know that she is comfortable and understands my direction. 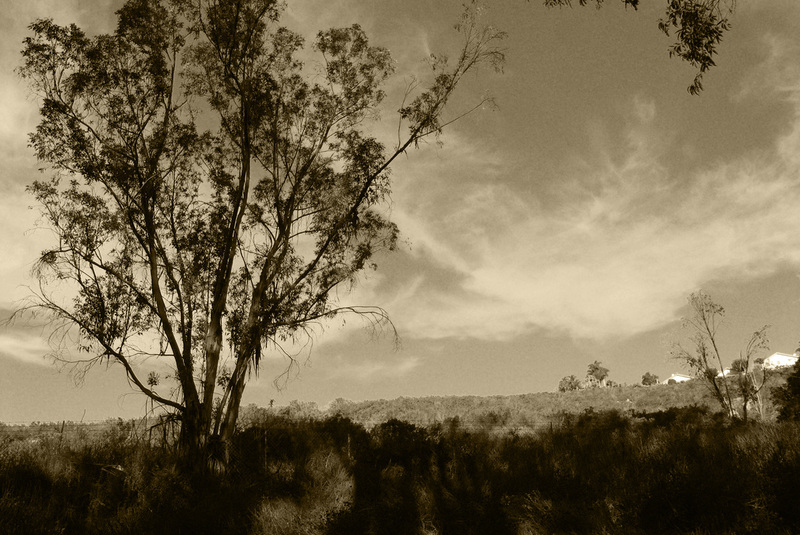 I took this photo at home in my front yard with my Canon Rebel T3, and used Photoshop to put a sepia filter and added grain to make it look as if it were taken on film. I like this photo because I like all the light elements, contrast, and depth that is in this photograph. I would describe myself as a moment seeker and capturer. This year I really learned about aperture setting and ISO. I’m looking forward to going on adventures and taking landscape photos. Bryan Del Rio, Class of 2016, Field Of Much Creativity. My picture is about a high school football field. The reason why I chose to name my piece Field of Much Creativity is because the football field is used to play a lot of different sports like soccer, football, lacrosse, field hockey etc. 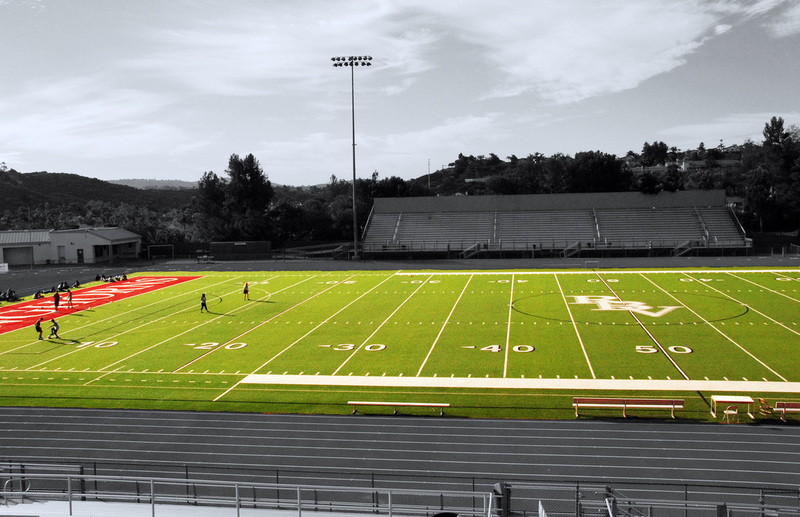 The picture is a football field in a hot warm Friday afternoon. The way that I took this photo is I set a tripod on top of the bleachers and took one photo. Then I went to Photoshop and desaturated all the colors and I grabbed the eraser tool and I erased the football field itself to tell the viewer on what I am talking about. I like it because the only thing that has color in my picture is the field, which I like to play on when I am doing a certain sport. It is a successful photograph because not a lot of people won't know how to do the color selection on how I did with the field in Photoshop, which I take it as a accomplishment. I will describe myself as a creative photographer. I learned so far this year is to tell a story by a picture also how to use slow shutter speed so I can do “light painting” and the main thing I learned this year so far was on how to do a circular mandala. I am looking forward toward to learn more about Photoshop and how to use it in different ways. 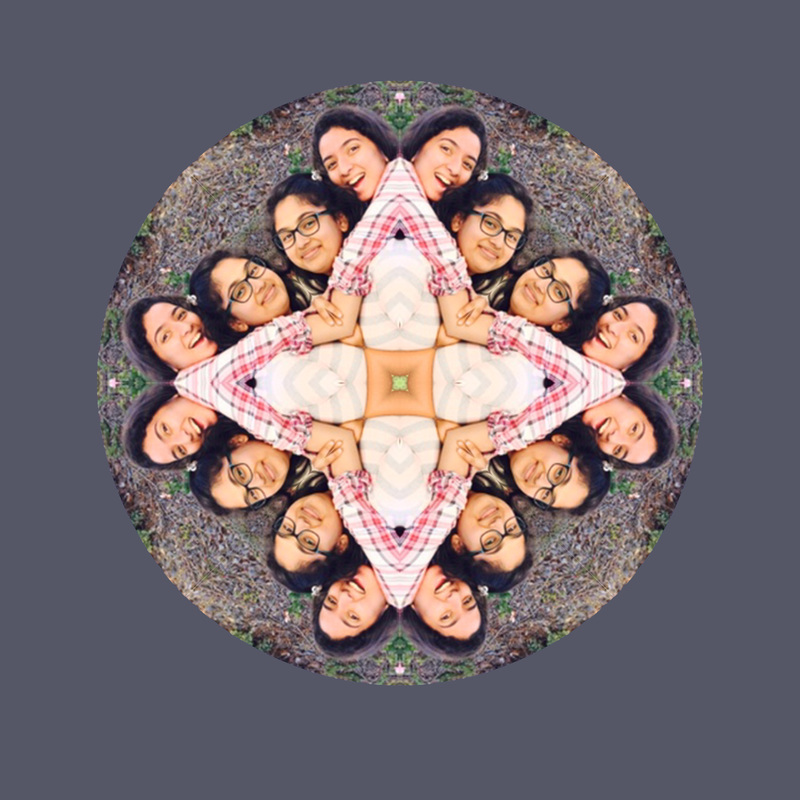 My picture is a Mandala of me and my sister. I titled it Sisters/ Cousins because this picture is of my cousin sister. 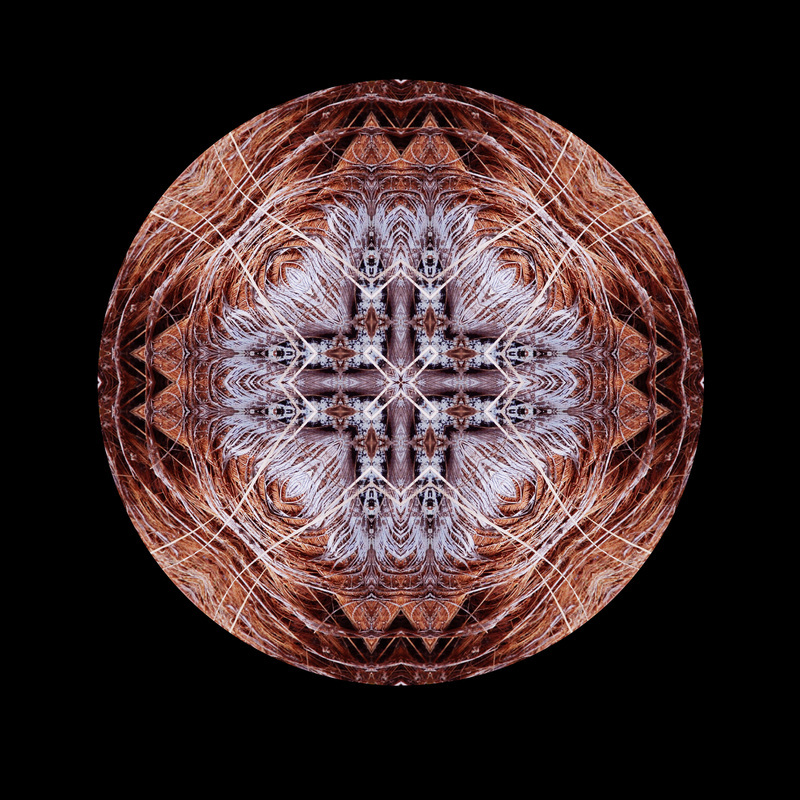 Using Photoshop I created this mandala. So the steps are as follows: First I used a tool named magic wand to select the part of the picture which I wanted to edit and copied it using Command +C and pasted it on the mandala template using command +V. Then, made a duplicate layer of it and flipped horizontal and merged layers 1 and 2 together and did the same. And at the end duplicate layer and flip vertical and there you go. I really like this picture because this is the only picture I have with her that is not a selfie and this reminds me of a lot of memories that we made. I was horrible at the beginning of the year but as months passed I am progressing and making memorable experiences and learning that I should not hurry while taking pictures and most important the image doesn’t always have to be in the center. It could also be in the three quadrants of an image. This is just a small step towards photography and I am looking forward to learning a lot in the coming years. 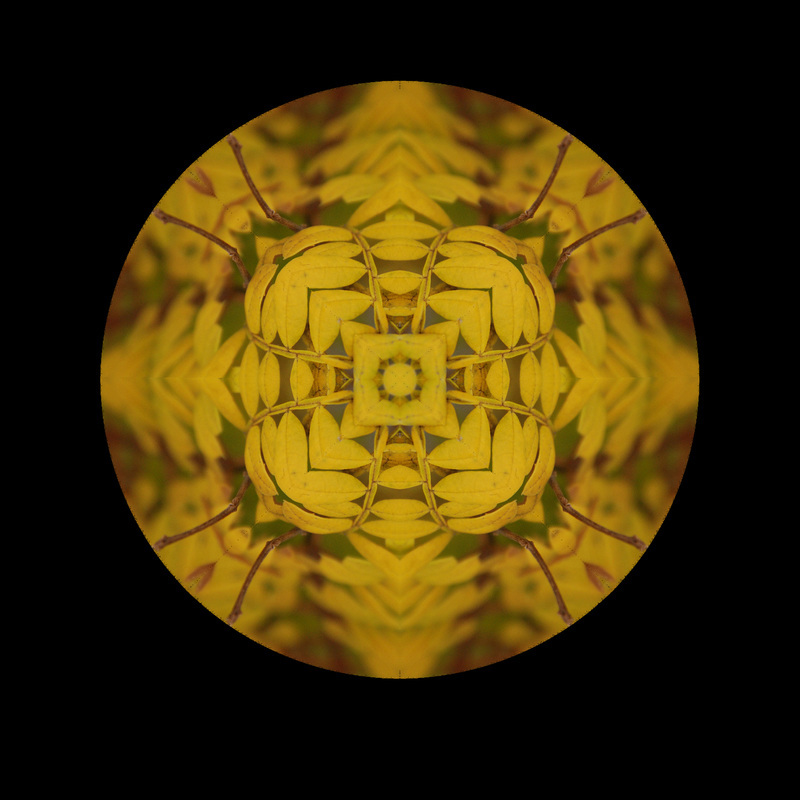 This photograph is a Mandala of yellow leaves. I titled it 3D Leaves because the leaves have been captured in a way and photo shopped in a way that the foreground creates a main focus and the background is all blurry. This picture is of yellow leaves that were almost going to die or be blown away by the wind, which diverted my mind to take that perfect shot. 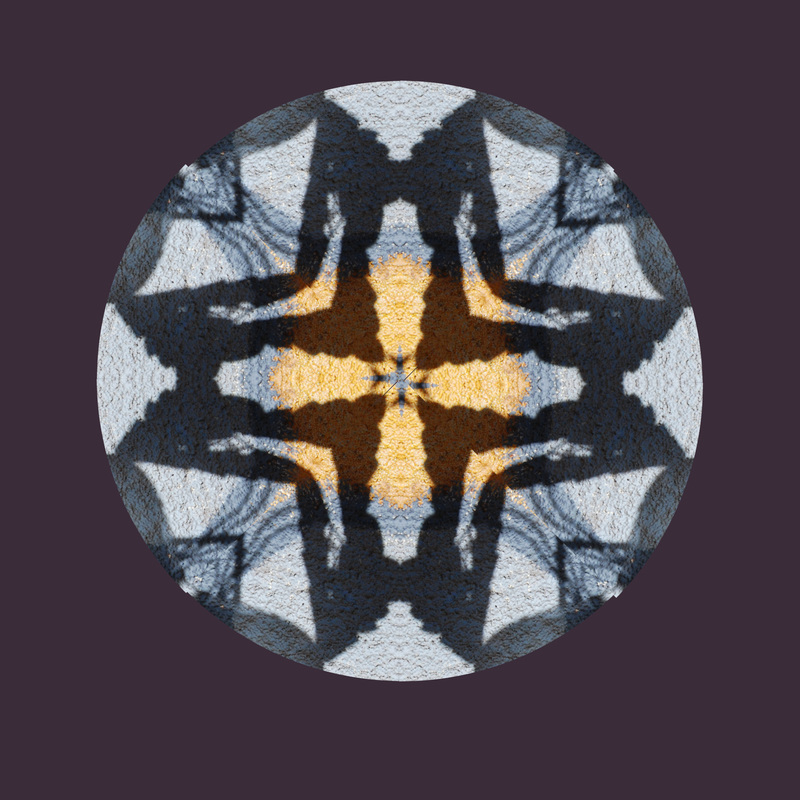 I used the mandala template to first take a pie piece and copy paste the picture in a pie and then I duplicate that layer and transform it both vertically and horizontally. I very much like the best photo because the design it makes and the pop out effect makes. I think it is a successful photo because of the way it is, naturally mind blowing. Visualizing the picture before even taking it would describe me an artist. 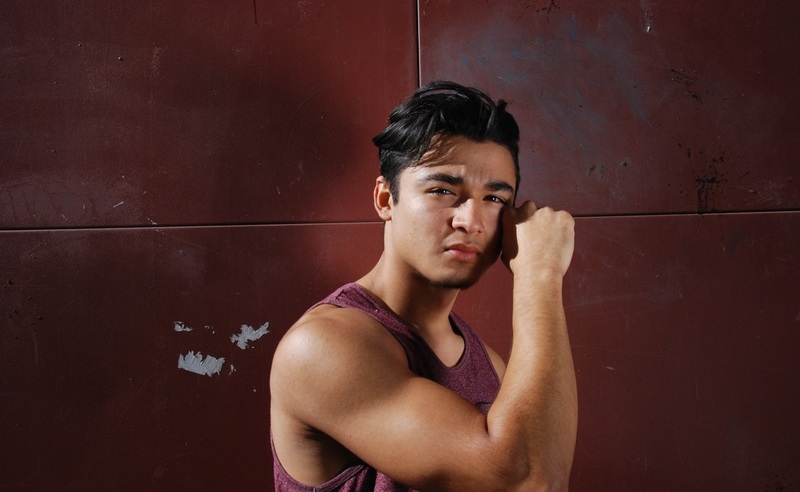 ​Jesus Diaz, Class of 2016, What’s Over There? I titled my photo What’s Over There? for one simple reason. When we were at the pier, right before my niece ran over to the rail she mumbled to me, while pointing “aya”, which is Spanish for over there. 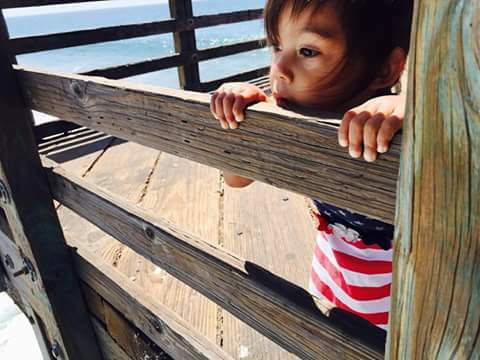 The photo is of my niece on the Oceanside Pier on a windy day. I took this picture with my cell photo that I had bought that same week, which had pretty decent megapixels. I like this photo because I could look at it and go back to that very day and list specific events. The other reason why I like it is because the wind was blowing her hair into her face and she was just looking out into the ocean looking at all the surfers do their thing. I think this is a successful photograph because she wasn’t posing or expecting to get her picture taken, she was too amazed with the water, surfers, and the boats. I titled my piece Shore Break because I was on the beach taking pictures of the shore break as it crashed over me. This is a picture of a wave that was breaking on the sand. In order to get this picture I had to run into the right place of the wave and basically throw myself into the wave to capture the photo. I just edited some of the exposure and contrast in the photo to bring out some of the color in the photo. I like this photo because it is so unique to my interests and there aren’t very many other students who had the opportunity to take this type of pictures. I think that this photo is successful because I was able to take the picture at the perfect moment before the wave crashed onto the sand. This year I have grown tremendously as an artist as I have gotten more creative with my photos and I have tried a lot of new techniques in order to capture the perfect photo. I am looking forward to learning new things in Photoshop so that I can enhance my pictures even more. I titled my photograph Landscape of Beauty because the view of the trees, water, and leaves is beautiful. The color in this photo has a dark and bright texture. What I did to make this photo pop out is, move the brightness almost fully down and made the picture HDR so it can pop out and makes you focus on the picture. I also of course used photo shop and this is what made the picture pretty and colorful. I enjoy this photo because I myself cannot believe I edited that well and I love how the color looks. I find this photo successful because the trees, plants, water, and leaves make the picture look as in I am there and it is peaceful. I describe myself as an artist because I have learned how to properly edit, change the ISO, and use photography equipment properly. I have learned that it does not take a “professional” photographer to be good at photography. Anyone can be one. What I am looking forward to learning this year is how to edit more beautiful pictures and to get better at photograph. I named my photograph Byrd after a hair company and it's not the usual way of saying bird. The picture is of a bird and shown as a Tessellation. I used Photoshop to make an 8x8 template and cropped the image to be 1x1 in size. 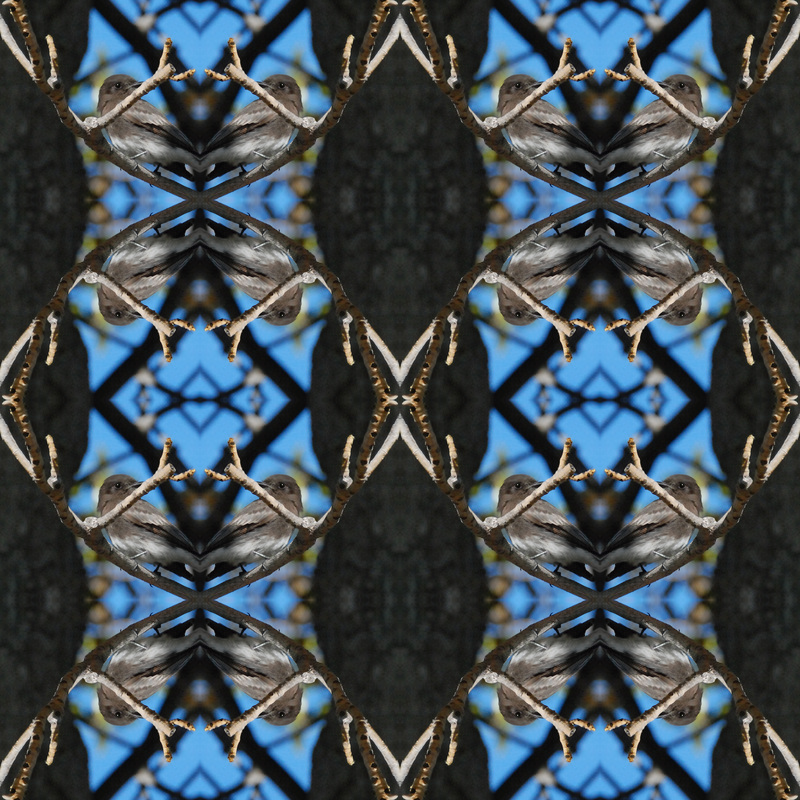 Then I used the 1x1 image and flipped it horizontally and vertically to make the tessellation. The reason I like the photo is because I was able to capture it when going back to class after shooting an assignment. The photo wasn’t planned or staged and it wasn’t what we were shooting at the time; it just happened. I can’t identify my artist style, because I’m still figuring out how I like to take photos and what subjects to shoot. In this past year I've learned how to effectively use the exposure triangle and how to incorporate the elements of art and principles of design. I’m looking forward to learning how to take photos, save, and edit photographs of my own personal time and life. I used the title The Lens of a Tree to name my photo because I took the HDR photograph using the trunk of the tree to frame the trees leaves. To make this photo I took five different photos, all with different exposure compensations, of the same image using a tripod. 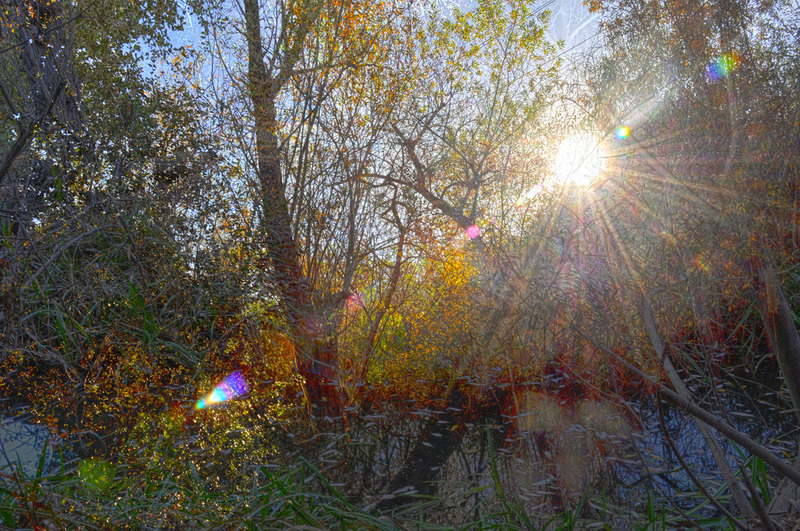 I then merged the five photos together using the HDR program in Photoshop. I like this photograph because everything in the photograph is blurred except the leaves. 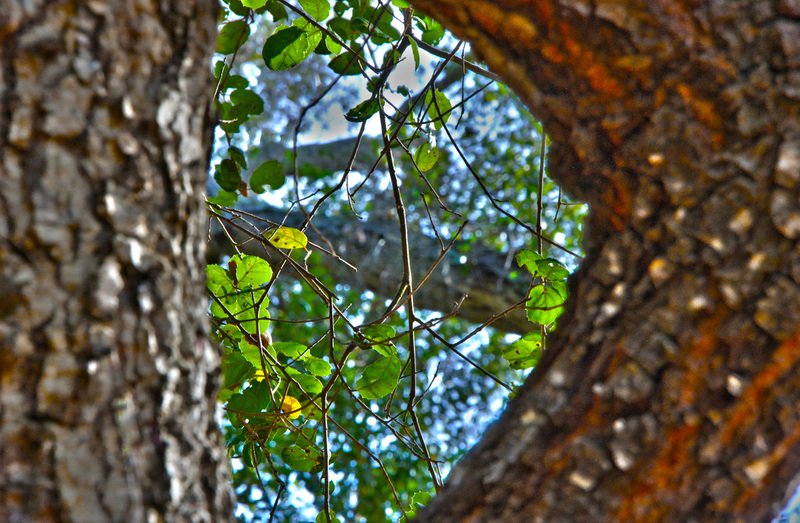 The HDR brings out the vibrancy of the green in the leaves and the tree trunk creates a nice frame for the image. As an artist I am curious about nature. I like taking pictures of plants and animals rather than buildings. I have learned many things this year, but my favorite example is becoming more comfortable with Photoshop by playing with it everyday. I am most looking forward to determining what settings to set the camera to based on outside conditions without the help of Mrs. Moncure. 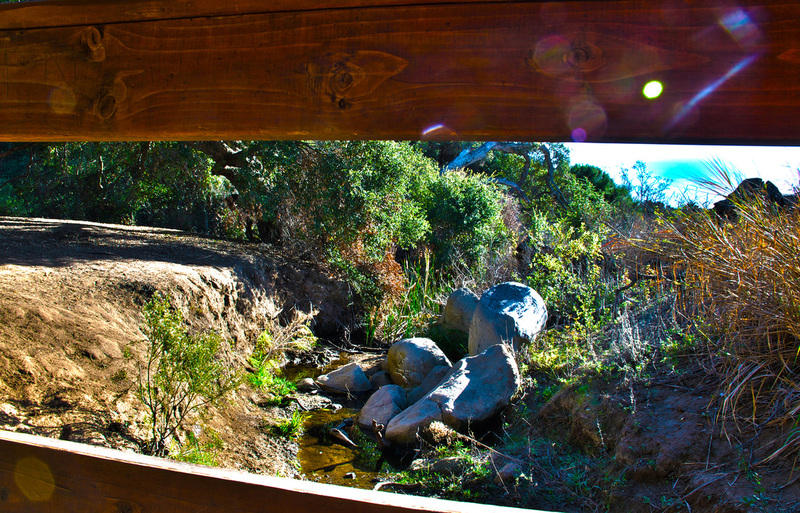 My photograph is an HDR photograph at a bridge within the duck pond. I’ve titled it A Better View because you’re getting a better view of this certain scene. Also, from the help of HDR (High Dynamic Range), it looks better than how our eyes would look at this already beautiful scene. What I did to create this photograph was to set a camera on a tripod and take multiple photos of the same subject. However, I took different exposures ranging from -1.0 to +1.0. 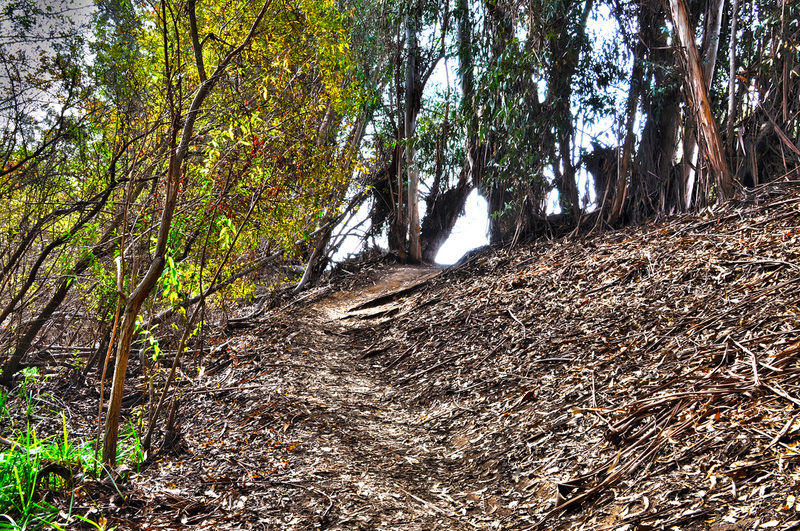 After I’ve completed these steps, I opened the 5 photos in Photoshop as HDR. Once I’ve done that, I played with the brightness and contrast until I was pleased with the photo. Throughout the year, I’ve progressed as an artist. My photographs are a lot clearer and in focus thus portray what I’m trying to show. I titled my photo HDR Sunset because HDR makes the photograph have more realistic features. 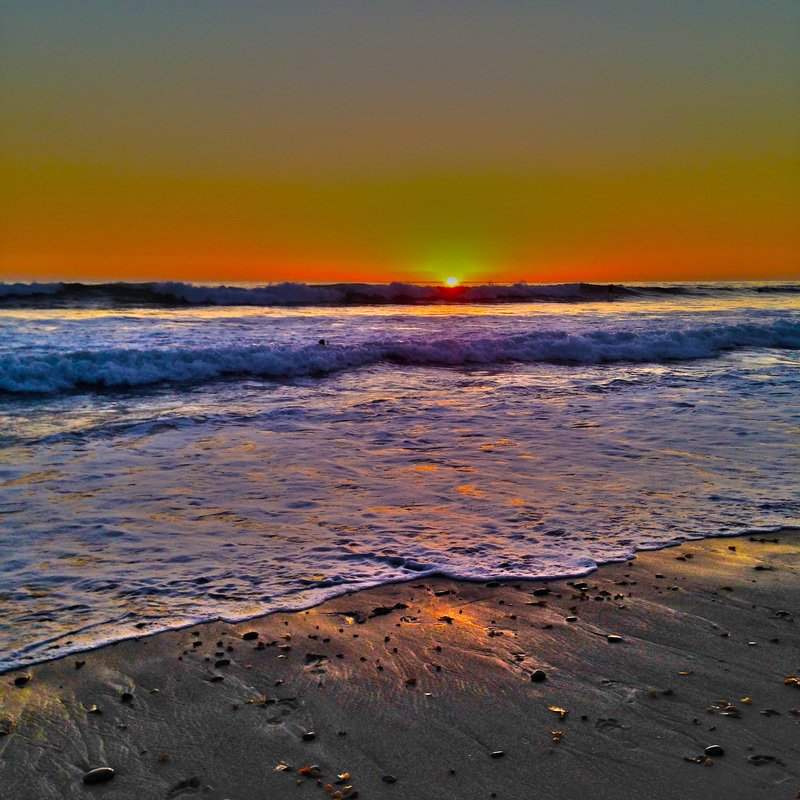 My photograph was taken at the beach of Carlsbad, California. I took my picture on my cell phone and edited it onto Photoshop. 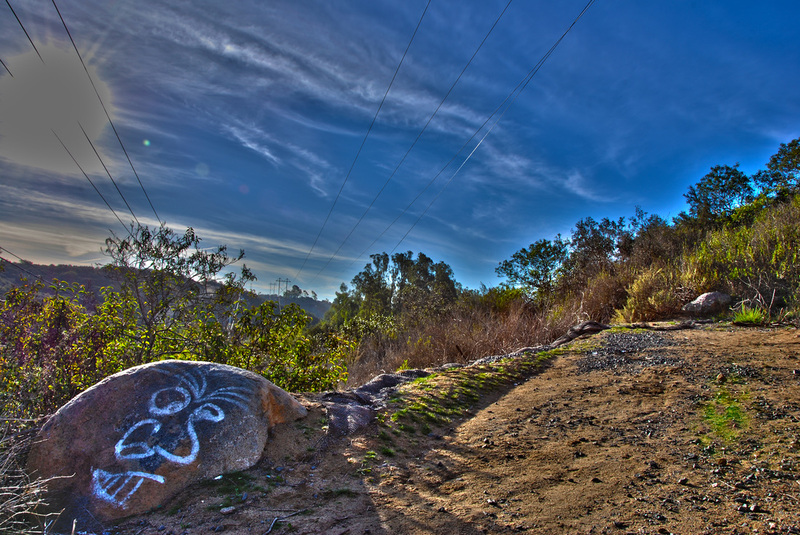 I edited my photograph into HDR. HDR is a sequence of photographs in the exposure of dark to light that is a series of 5 different exposures. I like this picture because it has vibrant colors and the texture seems realistic. This photograph is successful because I was able to learn how HDR works. A way I describe myself as an artist is going out and taking adventurous photographs. So far I have been learning a lot on how to work with Photoshop and learning the features of the camera. I am looking forward to learning on how to achieve and become better as an artist. 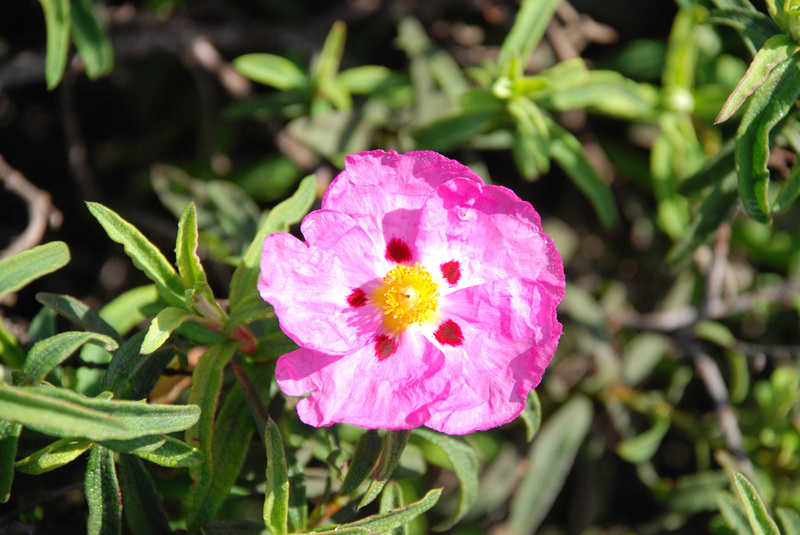 The reason why I titled my photograph Wild Flower is because it looks like a purple wild flower. The picture is of a flower but it isn’t a flower and the color is also purple. What I did to make this photo was I made it in Photoshop and I had to do the tessellation. Then I had to a make a template to create this photo. I like it because it looks like a very odd color that you don’t see. I think it a successful photograph is because it looks like a mirror. How I describe myself to be an artist is that I still need to learn a lot from the things that I have to learn. The things that I learned so far this year is that I learned how to use Photoshop and Lightroom. The things I am looking forward this year is learning how to create more beautiful photos. 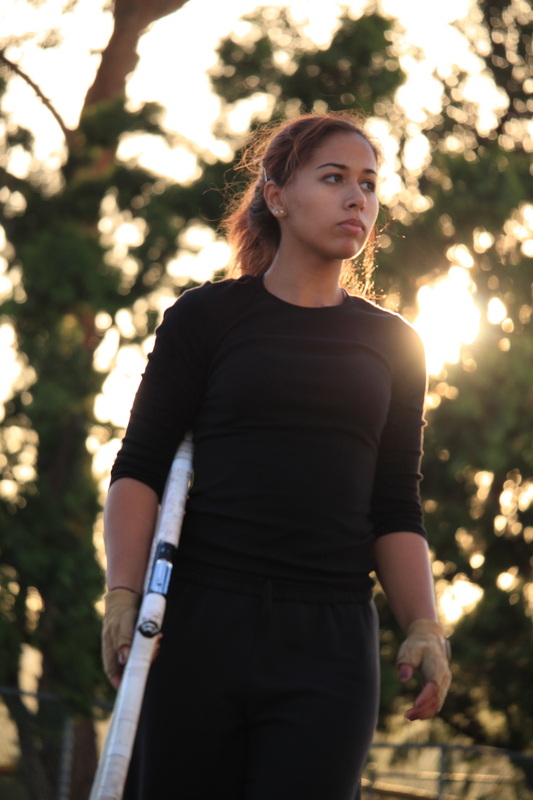 My picture is one of a senior guardian named Amber Wroten during one of their practices. The reasoning for this piece being called “A Sight for Inspiration” is for the fact that in band and color guard time passes. Time goes by so quickly and every count that we dance or play to, many don’t realize is the last time that will ever be done. This can become so fast that as a lower classmen don’t even see it happen and get the chance to build all that they want. What is it that they want you might be asking, they are all so attracted to this program for it’s family. All of these amazing young men and women that I get to not only take part in myself as a French horn but also document with my DLSR. Every practice and performance I get to see and show every memory that they can remember having. One of the ones that I love to show the most it’s the moments that all of the younger kids look up to; being able to brag about them being apart of what they make and getting to fill in the shoes, while sounding bad or tough, fills them with hope and dedication to be the same kind of model for those below them! And then you get a circle of life that brings hard working kids all working for the same reason of performing their art. I don’t enjoy all the time being told “your piece is amazing!” but I find that all artists have this to some degree; however what I do love to see is the band and color guard being so emotionally charged that they don’t know what to say. Hearing the kids all ask for them, post them on social media, or their parents put them up in their houses is what makes me feel so fulfilled as to the fact that it meant that much to them. My title for my photograph is called The Path To Success because the lighting in the halls is the more to success to your future. 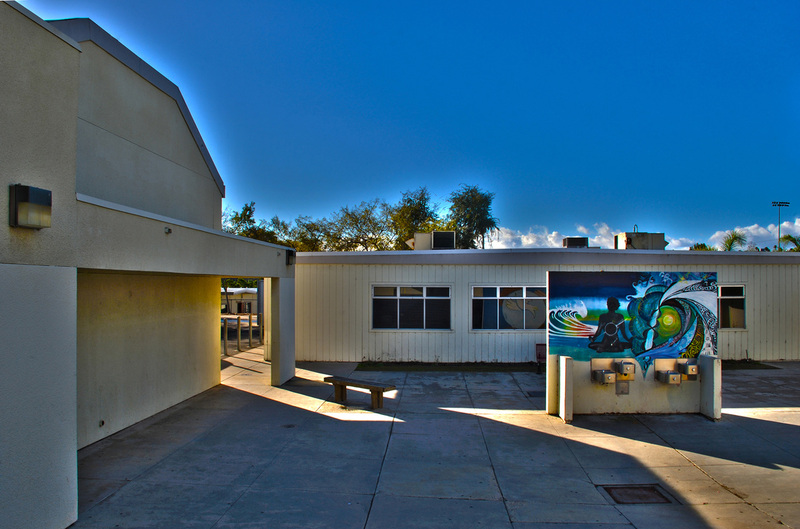 My photograph is of the 700 hundred wing of RBVHS. 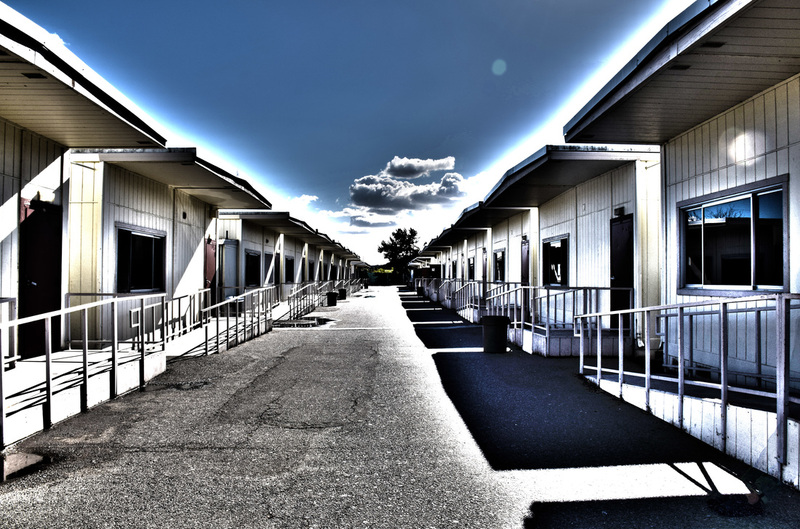 What I did to make this picture was I used Lightroom to make the rooms a little bright and the sky a little dark. I also used a tripod to make the camera steady so I can take a nice picture of the halls. I really like it because these rooms right here will show you the path to education and to success and for you to walk during graduation with your friends and make your family proud. I would describe myself as not necessarily a good artist but one who tries really hard to become a good artist. What I have learned so far is how to use Photoshop and Lightroom which were pretty hard to learn to use. The thing I am forward to learning this year is to edit more pictures. My picture is a tessellation of a flower surrounded by branches that I took in the schools garden. I titled it The Love Garden because it looks like a romantic and peaceful picture with the red flowers that pop out in the photo. I used Photoshop to make this photo and a four inch template that I made in Photoshop and then I cropped a part of the original photo to four inches. The thing I liked about this photo is that it's very unique from all the other photos I have created. I would describe myself as a creative and fun photographer. This year I have learned many things including how to use Lightroom and make my photos clearer and look better. I believe that I’ve become a much better photographer than before I took this class. I am still looking forward to learning many new things this year. I have titled my photograph The Beauty Of Harmony because the harmony is simply beautiful. This is a picture of Venice Beach. All I did on Photoshop was adjust the brightness/contrast and shadows/highlights. I really like this photograph because I just love the beach and the light orange of the sun really makes the dark blue ocean really pop and the photograph itself look very vibrant and it just looks beautiful. I think it’s a successful photograph because every color in that photograph really compliment each other. I think that I'm a very unique artist and very original. I like my photographs to be the way I think it’ll look good. I really learned a lot in class and I’m looking forward to learning so much more. I titled this photo Eye of the Birds because it is in the perspective of Birdseye or a photo taken high up. I made it in Adobe Photoshop by combining five pictures together to create this HDR photo (two under exposed pictures, two overexposed picture and one taken at a normal exposure setting). I like this photo because it is very vibrant and uses the compositional rules of photography, leading lines and rule of thirds. As an artist, I would primarily say I favor landscape photography mostly because I like to capture the beauty of nature. The most valuable things I learned this year would be the compositional rules of photography and I look forward to learning about merging photos in Photoshop to create a moving effect of an object or person. The reason why I named my photograph Waking Up is because I thought of waking up on a sunny morning and seeing the beautiful blue sky out of my window. This photograph is of a water fountain area here at school. I chose to emphasis and showcase the art of this wall, so I edited this photograph in Adobe Photoshop, changed the exposure and the contrast and also got rid of any dust in the sky. I like how it shows a rim of sunlight around the buildings and the clouds showing through the back of the center building. I think it's a successful photograph because I really tried and was careful of removing any dust that was in the photo whichwas originally from the camera, and just the sharp blue color of the sky really stood out to me. I would describe myself as a learner because no one is perfect but my knowing towards photography has grown. I have learned more about the functions in a camera and what they do and have a larger understanding of Photoshop Lightroom. I titled my photography Curiosity Is In Us All because I know that curiosity is indeed in us all. As human beings, you can say it’s a basic need to have this. This photograph is a picture of my partner Cheyenne. To create this photo, I took it with all the exposures and merged them together in Photoshop using HDR. I really like it, that’s why I choose it. I know it’s a successful photograph because it looks like it could be advertised on television or something. I would describe myself as an emotional artist. I have learned numerous things this year, including how to edit photos in Photoshop. I am looking forward towards more photography projects this year. My picture is a tessellation of a plant at school. I titled it 4 Eyes because the way the photo is made, makes the photo look like it's 4 eyes put together of a plant. 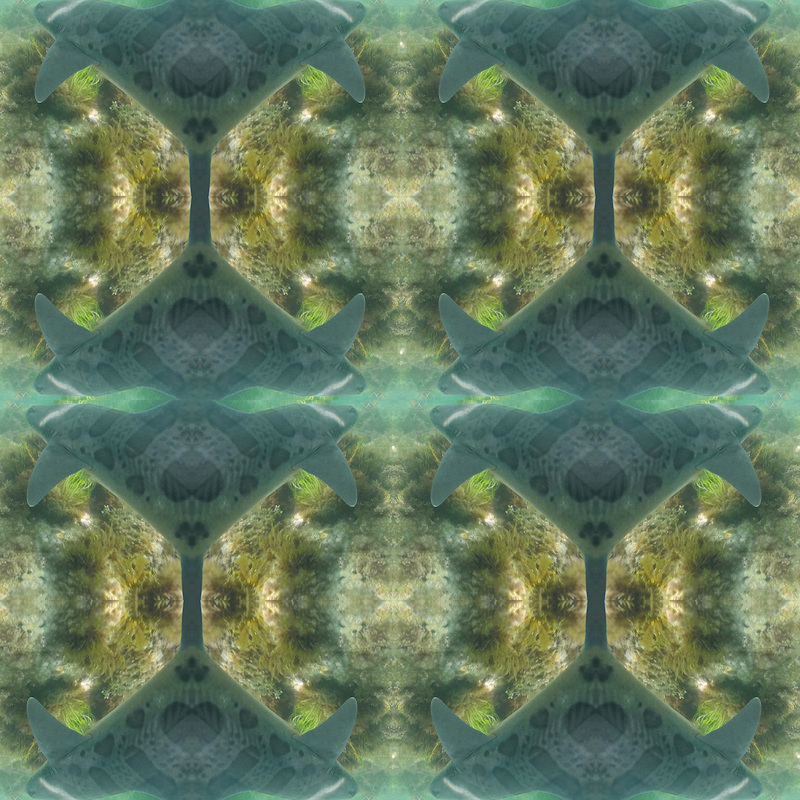 To make this photo i made a tessellation template and used Photoshop to cut down a photo to a certain size to fit into the four squares of the template. Once I fit the photos into all the sizes, I started messing with the colors and made it a black and white color. I got an idea for this photo because of one of the photos hung up in our classroom and I wanted to make my own version of this photo. I believe this photo is one of my best edits. It really made me happy how it turned out. The only difference I would attempt to do with this photo is try to make it an HDR photo next time. I am proud of the way my photos are turning out and how good my artistic work is getting better than how it started. I really enjoy this class and it’s helping me out so much as an artist and I am really glad I took it. I titled this picture Grasping Time because this pictures reflects how time goes by in an instant. 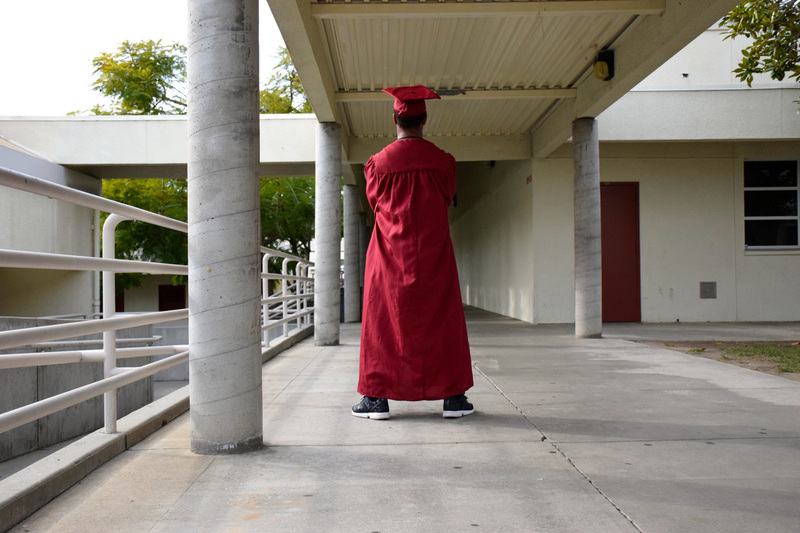 It is seen as a student reflecting on the past four years of high school and coming to the realization that its time to move on to the next chapter of their life. 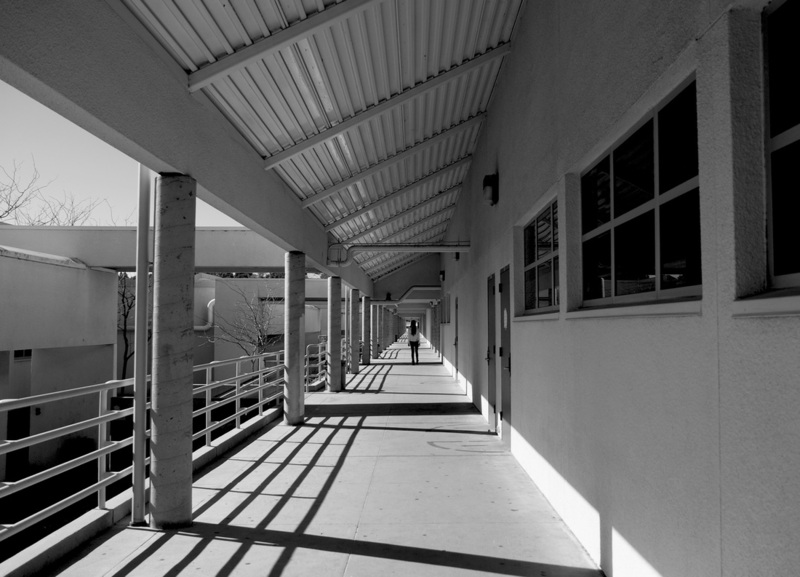 This picture shows a student walking down an empty school trying to relive all of their greatest memories and replay moments in their head as they walk down the hallway for the last time. I edited this photograph in Photoshop to make it black and white. I then also raised the exposure and brightened it up a little. I like this picture because of all of the shadows and highlights in it. They add another dimension to the photograph that really makes it more interesting. I wouldn’t describe myself as an artist I just enjoy experimenting with different angles and lighting. I’m looking forward to learning any thing I can about photography, basically anything that will educate me more and improve my skills. I titled my piece Tyree Sample because that is the name of my model. This photo was for our Portraits Project. I didn't do anything to edit this photo, It's exactly how it came out on the camera. I like this photo because I love portraits. 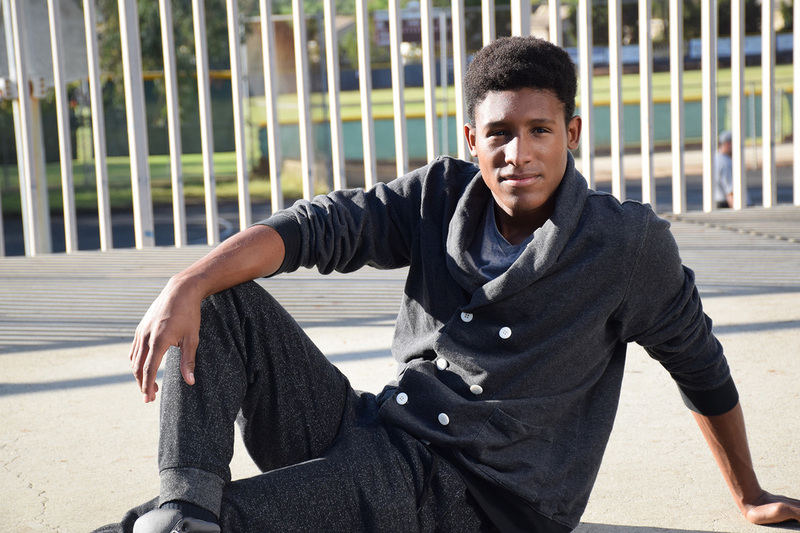 They are my absolute favorite type of photography and Tyree was the perfect model. If I were to describe myself as a photographer I'd say I'm a passionate photographer. I strive to make my photos the best they can be. I learned a lot about how to do things in Abobe Photoshop so far which I've enjoyed and I'm excited to learn even more about the program. My picture is a flower that I took in the garden by the weightroom. I named it the title that I give is because it was the only one of it’s kind there. The picture is a flower that was there in the garden flower with other flowers there but there was the only one that was a live. I changed the brightness and the contract to bring the flower out more so it can stand out. I took it with the camera that we had in class and that I zoomed into to get a close up to get the picture nice. I like the picture because I like taking picture of all kind of flower that I see when I can or when I have a camera with me. I think this picture was a success because I use the way that I could get a close up with the flower to get the picture to get without mistakes. I would describe myself as an artist is that I take random pictures to see what it look like if it good or bad pictures. I learned many things about cameras and Photoshop to fix my pictures. I’m looking forward to taking different kind of pictures that I have not taken yet. I titled my picture The Green Forest because the first thing that popped out to me was that green being the main color and the first color I notice when I look at this. My picture is one taken at the Duck Pond of trees and the ground and a log in the middle. I didn’t do much editing to the picture because I thought it came out naturally nice looking already. The only editing I used was a few basic touch ups such as increasing the exposure and contrast and sharpening the picture so it wasn’t as blurry. The reason I like this picture is because I feel like it captured a lot of the photography elements in one picture. I originally took it to be a rule of thirds composition and to have the big tree be the main subject but I noticed afterwards the log could be leading line and it could be framing as well with the two trees framing the log. I would describe myself as a simple artist. Each photograph I take I don’t like to edit and alter a lot because I like my photos to be real and showcase how it originally came out even if it isn’t the best. So far I’ve learned how to edit and the different styles of photography and I’m looking forward to learning how to make my photographs better each and everyday. 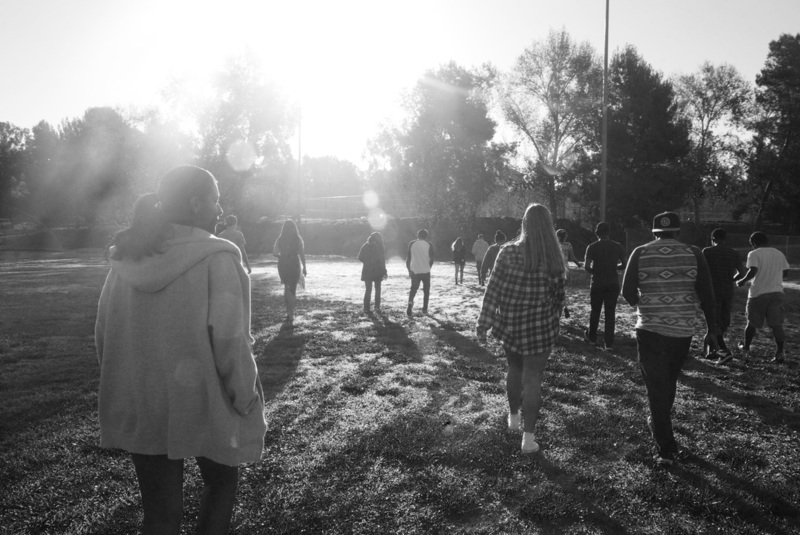 My picture is a simple black and white photo of a class on their way to the duck pond. I titled this photo As We Walk because in certain situations like this one, where there are some conversations with other people, but then there are those silent intervals. In these silent intervals, as you see in the photo, people look around and just think to themselves and only to themselves, know one knows who, what , when, or why they were have such thoughts, but that is lost in the privacy of their mind. To make this photo I simple used the desaturation tool in Photoshop to create the black and white setting. I like this photo because in the moment of taking the picture everything was in absolute silence, the only thing to be heard was the breeze going on by. As an artist I see my self as someone you takes a third-person approach on pictures to see the overall picture, but occasionally I tend to get a nice close-up. I am slowly progressing, but getting better everyday, I look forward to getting even better. I titled my photograph “Laguna Beach” because that is where I took the picture. 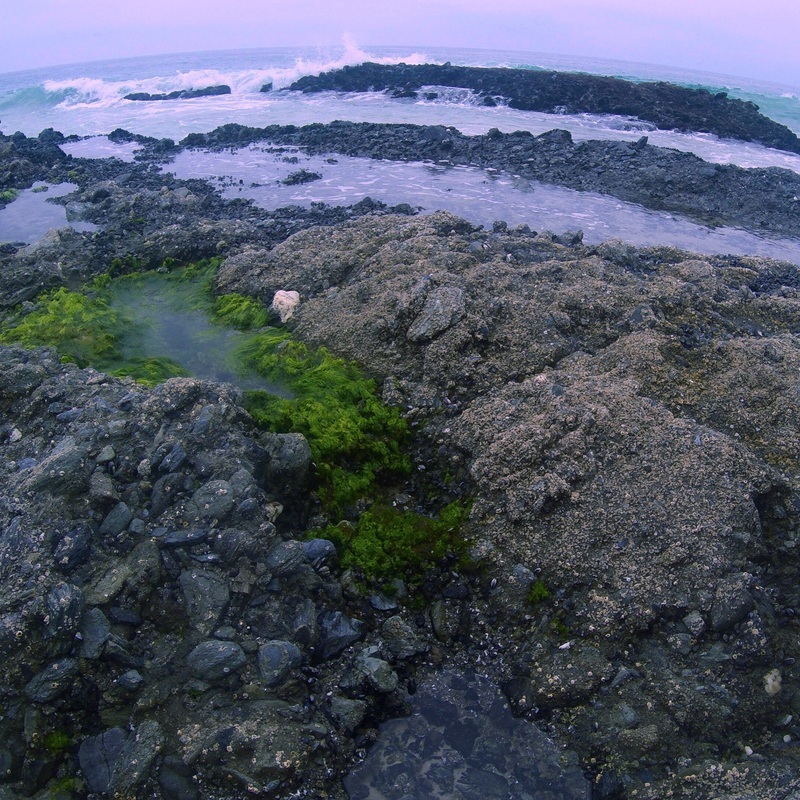 This is a photograph of tide pools formed by a rock in the ocean. I was able to capture this image by swimming out to these rocks, which were very slippery and would cut your feet, and taking it with a GoPro. I like GoPros because it adds a fish eye effect to the photograph. I edited it on Instagram, just fixing the brightness and contrast of the image, and I added a pink tint to it but with a light opacity. I like this photograph because this is one of my favorite beaches, 1000 Steps Beach; the colors are very vibrant for such a cloudy day, and it is very good quality. I would describe myself as a beach photographer. I love taking pictures of the beach and all the different colors of the ocean and the sky and it is my favorite place to be. So far this year I have learned how to capture pictures at the right angle, if I’m moving or not on how fast the shutter speed should be, and to adjust the ISO. I’m looking forward to using Photoshop and doing layer masks. Wow does this photo have history. To begin with this was the first photo project that we did in this class, which by itself makes it meaningful. Secondly this photo was completely by chance and luck. Here’s the thing about this photo; it is so perfectly framed. From where the bubble placement is to where her lips and nose are to even where the hand is. There is just something about this photo that makes it so calm looking at it. The other beautiful part about it is the fact that this is straight out of the camera. I didn’t edit this in Lightroom or Photoshop. Which makes it even that much better. This photo is also so special because of just how hard this was since the bubbles kept on popping before I could get the photo. 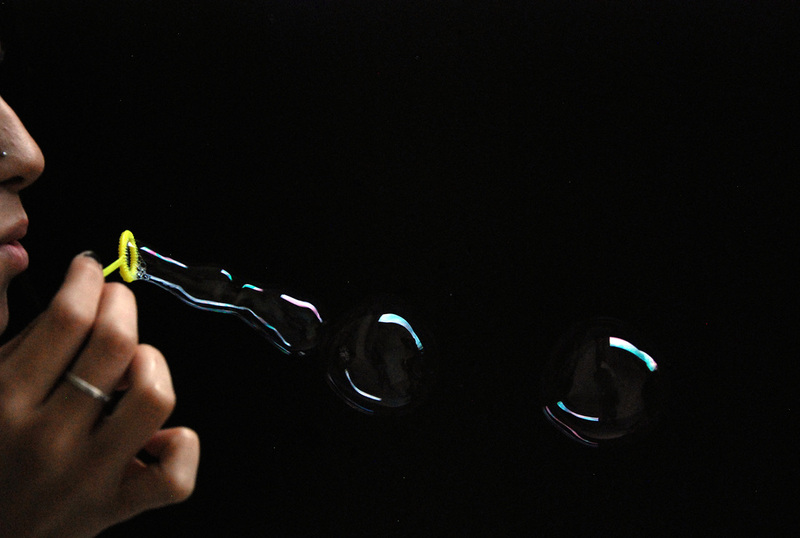 Or simply that the bubbles always end up coming out blurry or not with the full black background. This photo is just so special to me. The best photographs are ones that are taken at the perfect moment. As I was taking this photo of my friend, Cassie, I remember our other friends constantly making her laugh behind me. She kept on laughing at our friends’ hilarity, so I thought it would be best to just take the picture. The fact that I managed to capture Cassie’s emotions during the moment is what inspired me to entitle this photograph Happiness is Key because it is the truth. By using Lightroom, I thought that a black-and-white effect would work well for the photograph, imitating one of my favorite photographers, Yousuf Karsh. I simply darkened the background and the shadows in order to add emphasis to Cassie herself, and even increased the clarity. I love the portrait of Cassie because just by looking at it, it makes me feel happy as well. In my opinion, I believe that Cassie’s genuine happiness is what makes this photograph successful. As an artist, I would describe myself as someone who is doing the best she can with what she has. Some of the things I’ve learned so far this year is that lighting influences how we can interpret a photo and that, sometimes, capturing the subject’s real emotions can help us photographers when it comes to showing the subject’s personality and appearance. I look forward to enhancing my photography and editing skills in the future. I titled this photograph Lonesome because Frank looks really depressed and Jade is looking all loving at Sean and Sean is just on his phone not paying attention to the love and affection Jade is giving him. 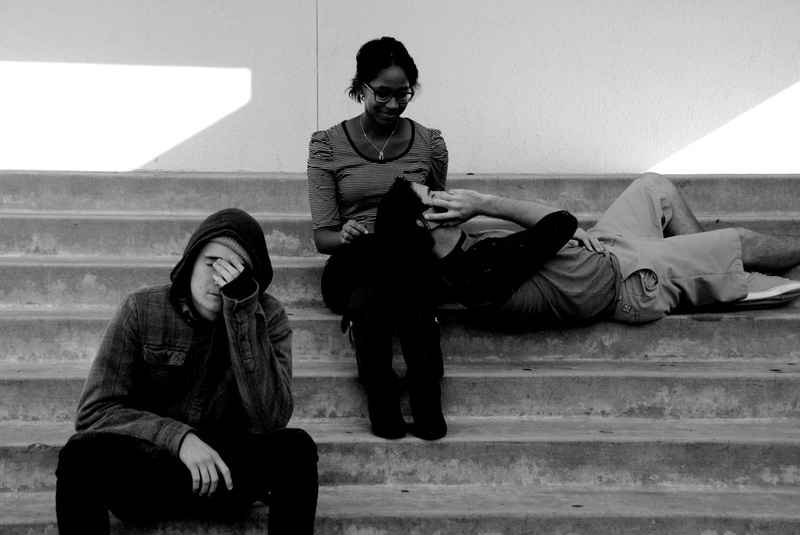 It’s a picture of Frank sitting on the lower step feeling really down, Jade and Sean are a couple in this photo and Jade is in love but Sean is just on the phone not paying much attention. I took it with the Nikon camera and I used a black and white filter to make it have more depth into it. I really love this photo and this is actually one of my favorites so far. I learned a lot about angles and trying to find the deeper meaning in photographs that they are not just a pretty picture but there’s meaning behind every photograph. I think my photos have become more clearer and easier to interpret. My picture is an mentor photography of my mentor Manuel Alvarez Bravo and this picture I tried it to make it into one of his similar photos because he really expressed his photography with the black and white and in his photography, women appeared more than guys. I titled this picture “Under The Umbrella” because the two girls are holding their umbrellas within the setting of the stairs, rails, and streets. 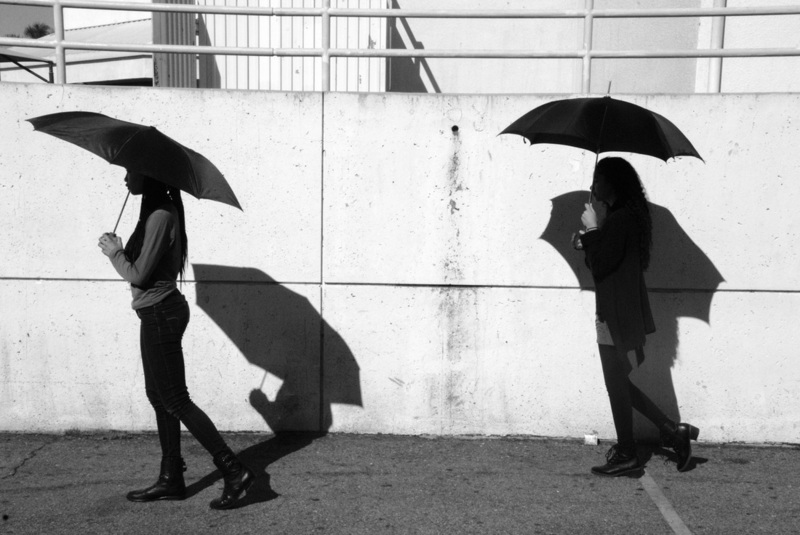 To make this picture I had two umbrellas and asked the girls to pose similarly to express Manuel’s photography. I used lightroom to make the picture black and white because all of his pictures are black and white. After I changed my lightings and the brightness it looked more like Manuel’s photos. My artistry has gotten better as the year has progressed, my pictures can tell and express what its trying to explain, therefore the pictures came out just as I wanted, came out clean and clear and was able to explain what I was trying to express. 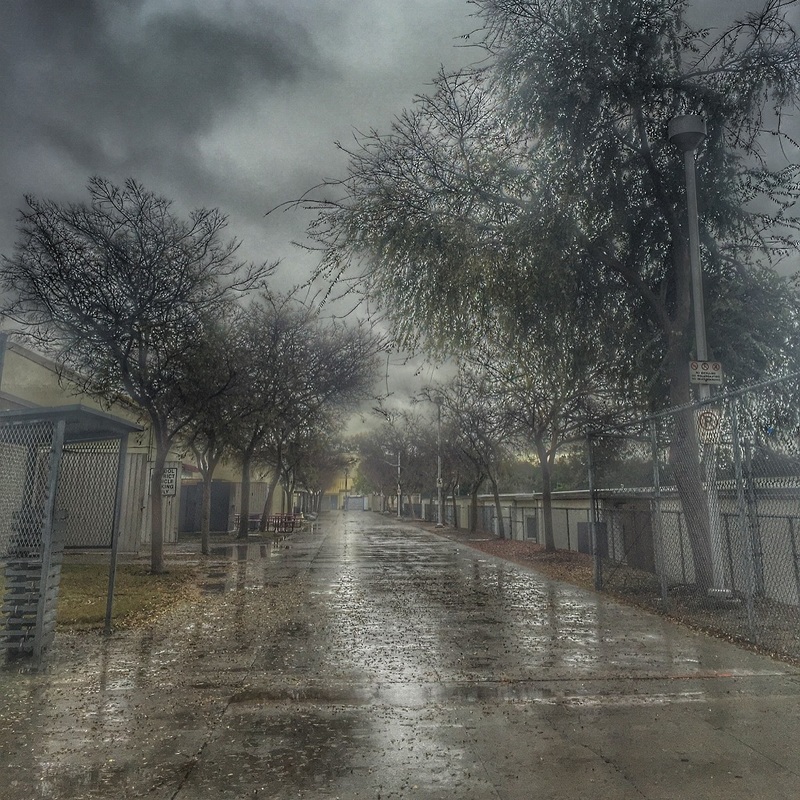 This photograph deserves to be called Rainy Day at Rancho because it shows how clear and crisp the school looks when it rains. With a yellowy light in the distance, the light reflects the clouds and brings a warm hue to it. The light comes through the trees and you can feel how much the trees lost their leaves to the rain. The light reflects the ground and gives a shiny look to the path in our school. I made this by adding a HDR look and dropping the bright light giving it a more dramatic look, and bringing out the shadows in it. I used the SnapSeed app on my phone because I feel it gives a quick great look to photos. It reminds me of the snow and as soon as you walk through the hallways you feel like you're going to slide around. Or at least get water on your shoes. It gives a beautiful look to how cloudy and dreary the school can look. I like it because it makes Rancho look beautiful in the rain. 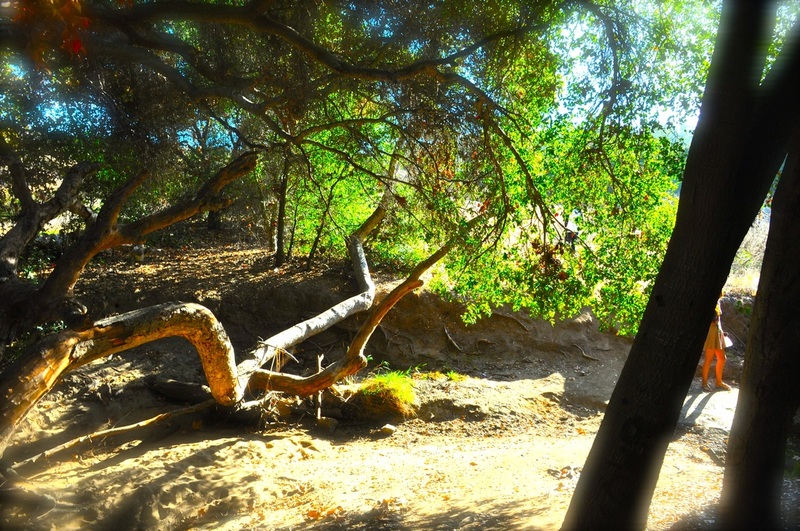 It uses HDR which is my favorite thing to do to nature photos. I believe this is a successful photo due to how much detail there is and the water is reflecting the clouds. 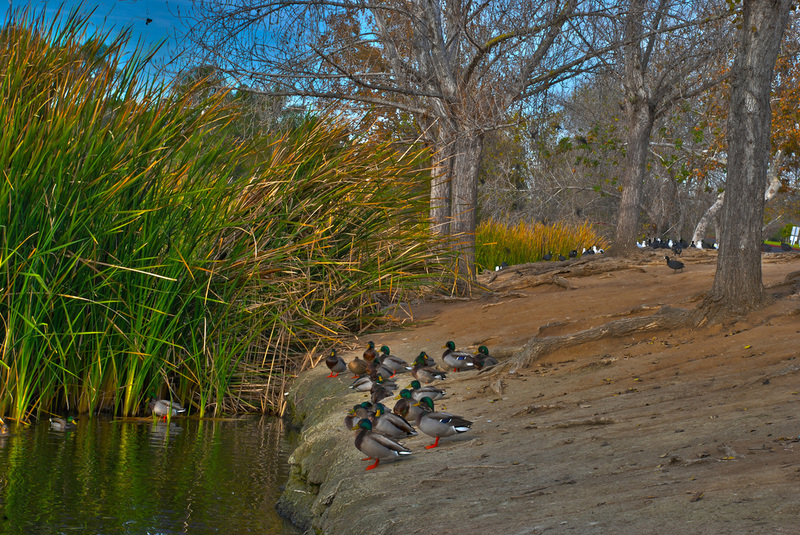 My picture is an HDR photograph of a group of ducks sitting along the edge of the pond. I titled it “A Day in the Park” because we had spent the day taking pictures at the duck pond and it just seemed fitting. In order to make the photo I took this photo in 5 different exposures, (-1.0; -0.5; 0.0; .05; 1.0). After taking the photo I opened the photos as HDR in Photoshop and adjusted the saturation and brightness until I produced the photo. As an artist I am constantly learning and growing through the lessons and experiences I have encountered. I have titled this photograph Parallel Universe because it’s definitely not a world that we experience in our every day lives, well maybe if you’re an LSD or an acid junkie. Everything is completely different than how they are in reality. In this picture it shows a man and two “witches” transforming him into something that he is not. He wants to change his appearance so that he may experience, and have a different life than what he has now. I put this photo in Photoshop and put a layer mask and then changed the vibrance of the background photo so that it may have a multicolor mix. I also edited the two “witches” so that they have the appearance that they are floating, and last but not least I put some sparkles around the boy in the picture who wishes to change his appearance. I did this because it would add to the fact that the “witches” are putting a spell on him. I had changed the opacity of the sparkles so that they are partially transparent, but not completely. I like this picture because it shows a part of my strangely fun and creative side. I don’t usually give the impression that I am able to create things that are so different then my everyday appearance. So it sheds a bit of light on some of the creativity that I have. I am eager to learn new ways to edit photos, along with tricks to taking beautiful and intriguing photos. I would describe myself as a person who likes to change peoples’ point of view on serious topics, and everyday life. I love to show people above and beyond of what they think I am capable of, and what I think I’m capable of. 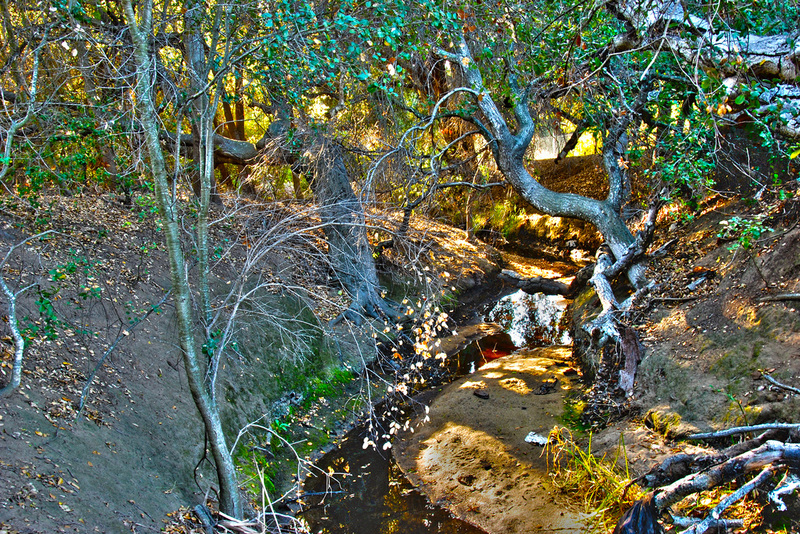 My picture is an HDR photo of a creek and shrubbery at the Duck Pond. I titled it “The Forest” because the setting of the photo reminds me of something that you would have to travel deep into a forest in order to find something that looks like this. To make this photo, I took this picture five different times with different exposures ranging from -1.0 to +1.0 in intervals of .5. After doing this, I opened the pictures as an HDR in Photoshop and changed the brightness and contrast to my liking. My photos have gotten a lot better over the semester and it is just going to get better as the second semester goes on. 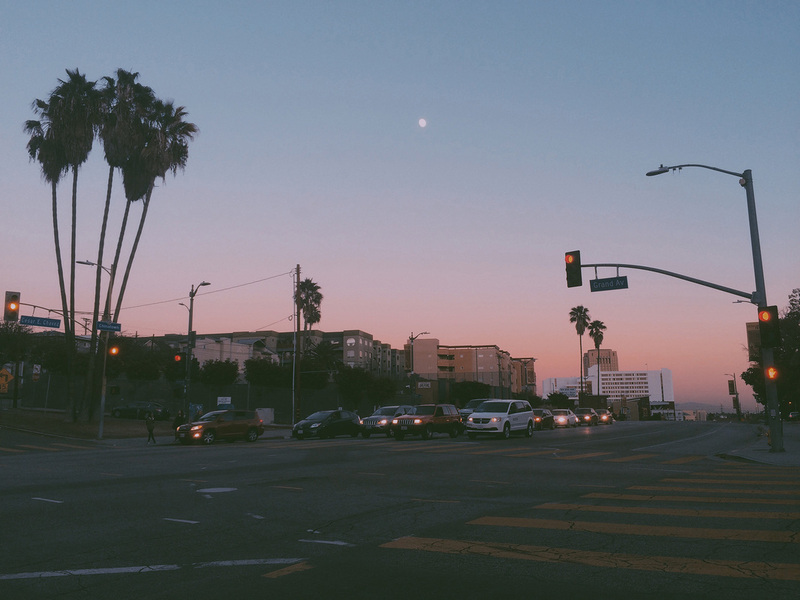 I titled my photograph L.A. Vibes because you can feel a certain vibe while looking at the photograph, as it is very mellow warm with some cool colors. The scenery of that evening turning into night slowly. I captured this photo in Los Angeles while walking across the street near China Town. I just used an app to edit it called Vsco Cam just to make the colors stand out more. I like this photograph because of the colors in the sky while the moon is up and the cars are still waiting for that green light. This makes it a successful photograph because I captured this when you can still see everything around since it was getting darker. I would describe myself as an artist going out and capturing a lot of landscape pictures just always trying to improve my skills. I am looking forward to learn new skills. 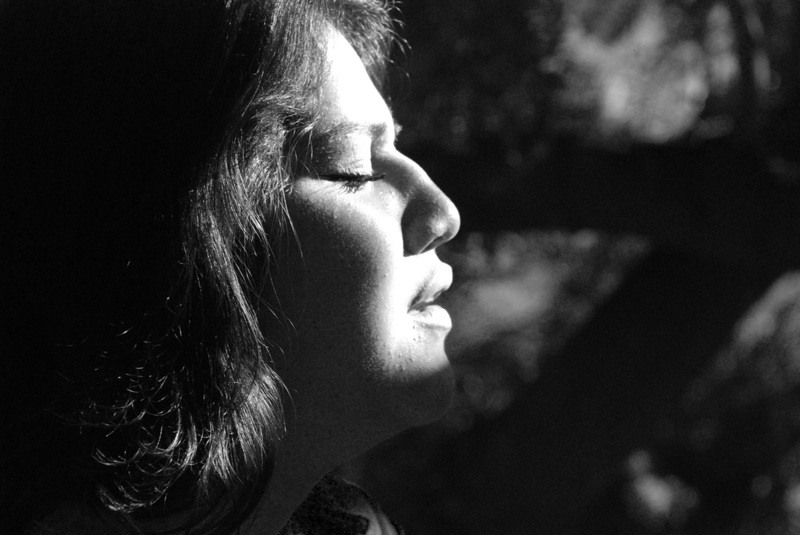 The title of this photograph represents the significance of the photo, which is the essence of relief. Overcoming a painful turning point in life has never been easy for anyone. During this type of experience, when one finally builds enough strength to move on it feels like if the light and warmth of the sun has touched your face again after a long period of darkness. This is what many people in the world yearn for, which is not getting their all problems solved but finding the strength to be at peace again. The photo is of one of my classmates looking towards the sun. I just made a few adjustments in Photoshop like turning the photo into black and white, brightening her face up and contrasting it a bit more so the sunlight on her face can be the main focus. I really liked how this photograph turned out because the light came out very natural as well as her facial expression. Its very soft and delicate and I think this is what makes this photograph successful. As an artist I think I like to focus on specific details of a scene and making them stand out. So far this year I have learned so many techniques of types of photographs like landscape compositions and how to use Photoshop; this year I am looking forward to learning about more styles of photography. I titled my photo Spider-Man On A Bench because it’s a picture of Spider-Man sitting on a bench. On Photoshop, I opened up the original image and duplicated a layer. I then desaturated the whole picture to make it black and white. Finally, I used the eraser tool on the figure of Spider-Man to bring back the color. I like this photograph because it’s very simple. 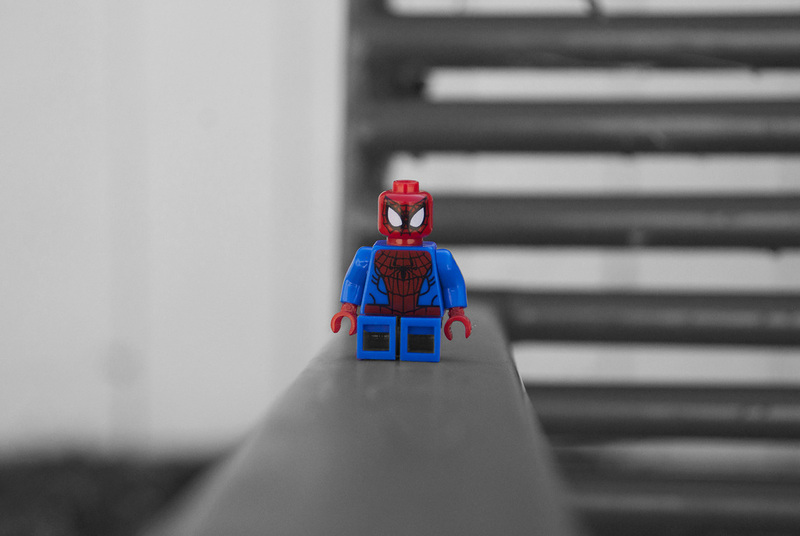 The image as a whole utilizes emphasis as the Lego figure of Spider-Man is the only subject in the picture that possesses color. As an artist, I would consider myself as someone who doesn’t overthink his tasks. I simply try to do what’s assigned to me without any extraneous or superfluous criteria. I’ve been able to accomplish this through what I have learned this year. This year, I have learned to put my finger on the shutter release until the image is focused and finally click on the shutter release when the image is finally focused. I look forward to learning more about Photoshop. My Picture is a tessellation of the top part of a palm tree. I titled it “vibrant” because I think the colors are very bright and just ties the photo together. To make the photo I used the template we were given and placed both in Photoshop. Then you have to change the image size to make sure it fits in the template, after placing it in the template with the move tool you duplicate the layer, then flip as needed. You continue this process until you fill all the boxes. I like this picture because of the way the plant is pointing in different directions and the colors it all works well together. I think it’s successful because it’s clear and pretty cool looking. As an artist I like colors to be nice and bright- I think it gives the photo a nice touch also enjoy taking lots of landscape photos. Using software that I’ve learned this year has given me the skill to make sure my photo come out as clear as possible, and I’m excited to learn new settings and small tips. 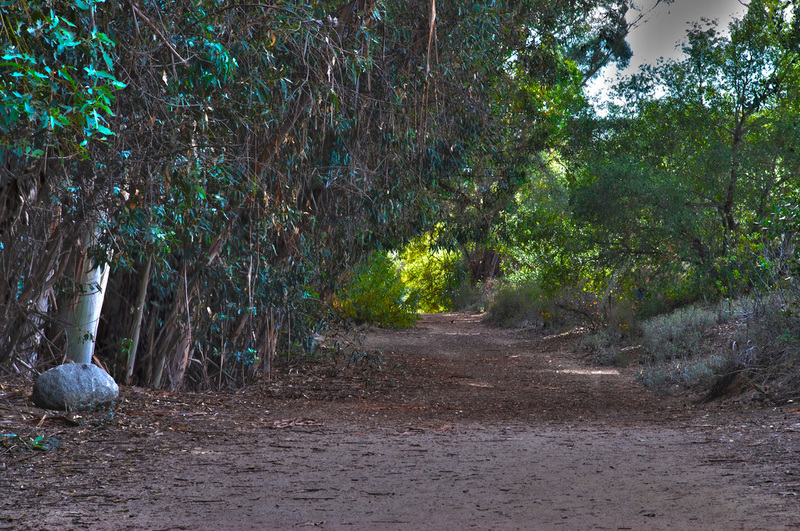 My picture is an HDR photograph of a trail in the duck pond. I titled it lost in nature because you are enjoying natures beauty, you get lost into it. To make the picture I took 5 of the same photos using a tripod with different exposures -1.0,-0.5,0.0,0.5, and 1.0. Than I put the 5 pictures into Photoshop and put into a HDR photo. 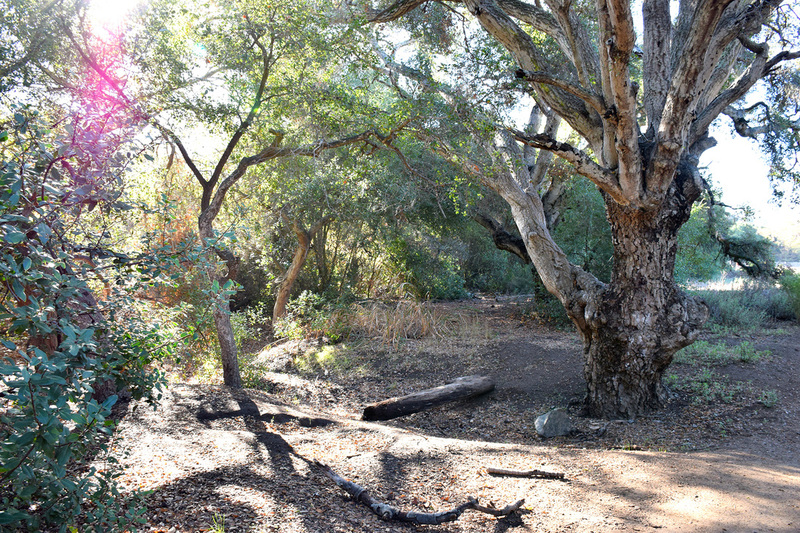 I like it because while walking on the trail I got lost in the beauty of nature and this photo captured that moment. I believe that this is a successful photograph because I feel that it captured everything about nature. I learned so many things as an artist like learning how to use photoshop, using HDR, making tessellations, and light painting. 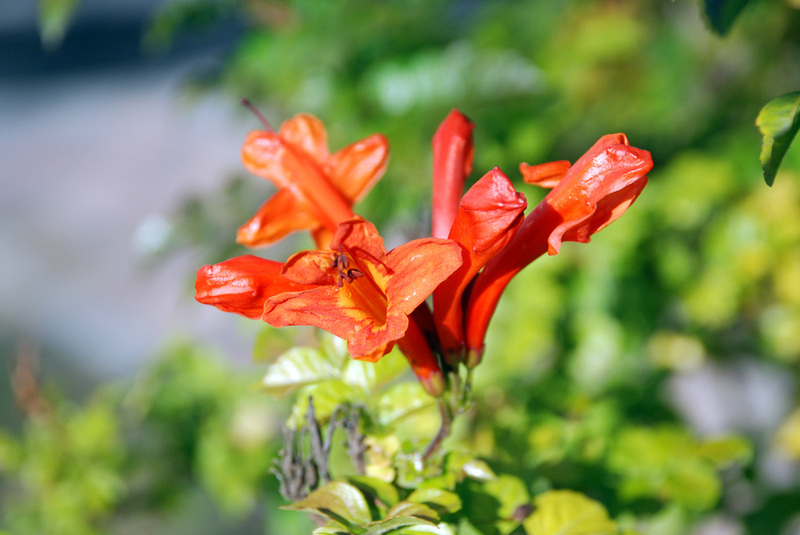 I took this picture near the weight room of a bright red and orange flower. I titled this picture “My Pretty Little Flower” because it was the only flower that captured my eye from all the other flowers. This flower was the only one that was fully-grown. To make this picture, I took the picture really close up to the flower and snapped the shot. I didn’t do anything on Photoshop because I thought it looks better with an original filter. I like this picture because it looks really clear and you can see the details of the flower. I think it’s successful because it's very clear and it has a bright color. I describe myself a creative photographer because I like to take pictures of random things out of place and making them into a great picture. I learned a lot about Photoshop and I really enjoy learning all the different tools about it. I like putting a lot of different details on the picture. I’m looking forward to learn more about Photoshop because I like putting pictures out of place and telling a small story about the photo. I titled my piece Destination because of the steps that it took to achieve it. When creating this picture I ran into challenges and obstacles that I learned from and overcame. 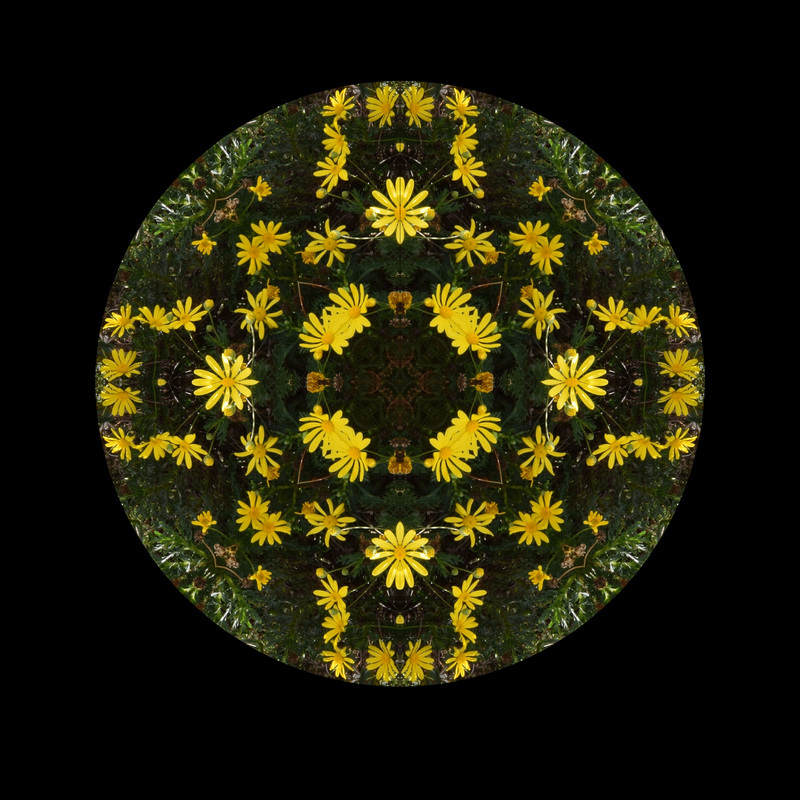 It is a picture of an HDR photograph that was taken at the Duckpond, turned into a circular mandala. I like the photograph because it is colorful and I think it's successful because it shows my progression as a student. As an artist I would describe myself as intriguing. 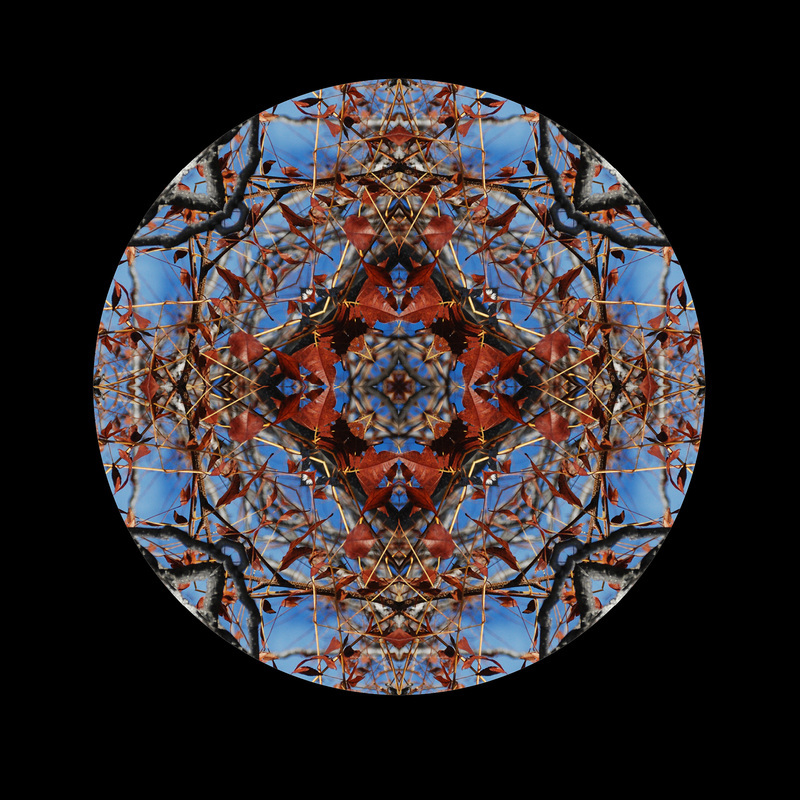 So far I have learned that my favorite things to create are the circular mandalas. I look forward to doing more of the photography projects this year such as the invisible man and levitation photographs. I titled my photograph Happy Halloween because everyone was having a great time during this time and they were happy. I masked the people in the foreground and blurred the background to get rid of the annoying background of other people. I like it because I think that was my favorite portrait photo I have ever took. It captures the essence of what our class is. It’s fun and a fantastically amazing experience. I titled this picture Dusty Road because it is a picture of a dusty road at the duck pond. To make the photo I put it in Lightroom and added some color and saturation to make it look more fruitful. 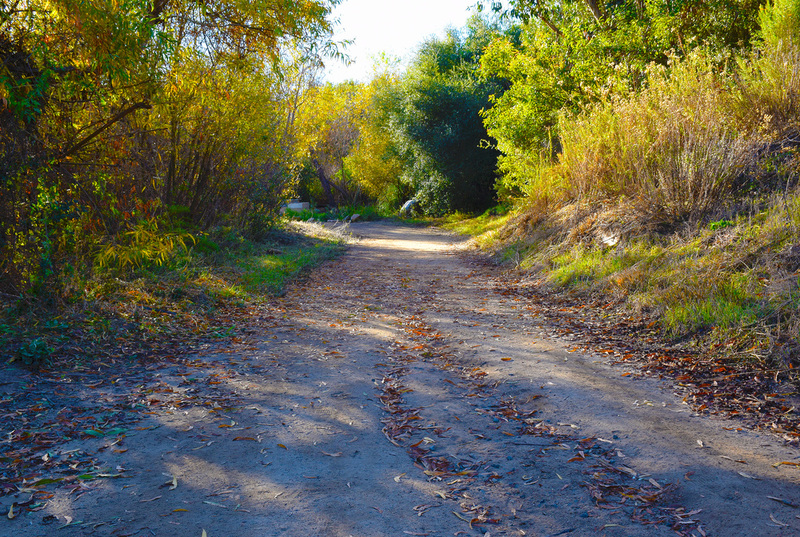 I like this photo because of the color it has- it makes me want to go into the picture and explore the trails. If I had to describe myself as an artist, I would most likely say that I am passionate about what I’m doing and I am always trying to find what it is I’m trying to express through the photo or art piece. Through this year I have learned a lot about the different photo programs and what they do to help bring out that perfect image you were looking for. I am definitely looking forward to going out more and taking photographs. This is a photograph I look from my car while at a stop in Pennsylvania. The original photograph consists of a full street view including three pedestrians walking across the street, mimicking the Beatle’s famous crosswalk album cover. 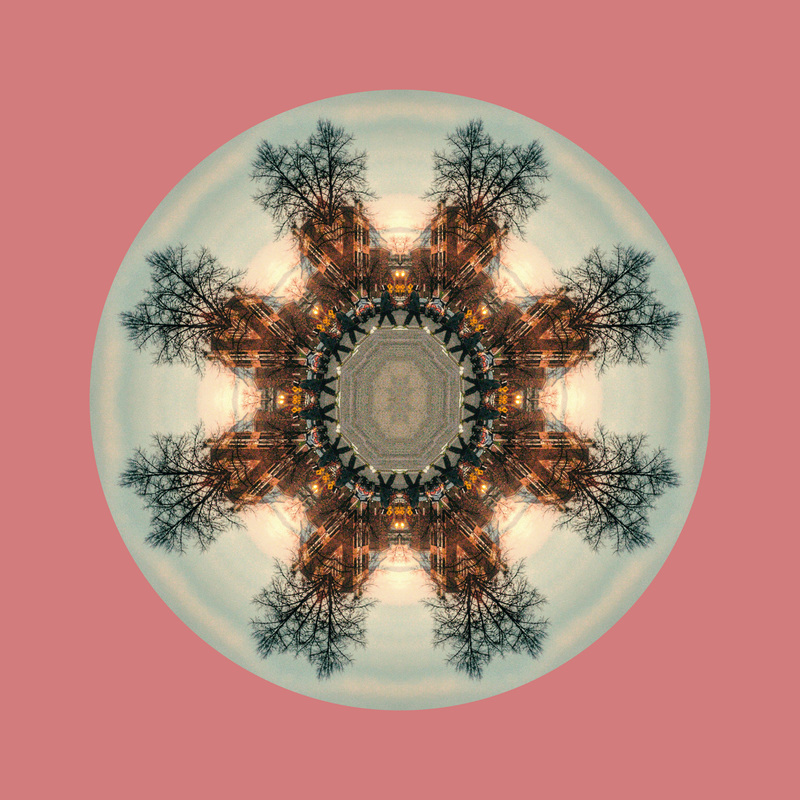 In order to convert the original average photo of a street view into this developed circular mandala, I used Photoshop to crop a certain section from the original photograph and paste the cropped section onto a circular mandala template. From there, I continuously duplicated that cropped section until the photograph resembled a circle. After completing the mandala itself, I changed the background to a salmon pink color in order to emphasize the subtle hues displayed on the mandala. I titled this photograph Around a Winter Wonderland because the man in the center of the photograph appears to be walking in a circle. Personally, this is my favorite photograph because of the complimentary hues carried throughout, as well as the snowflake-like structure formed by the mandala. As an artist, this photograph demonstrates my thoughtful character. I attempt to convert what may seem to be an ordinary setting into a meaningful and thought provoking photograph. My photography class this year has taught me just how intricate a photograph can be as well as the special relationship that must exist between photographer and camera in order to capture a successful photograph. As my final year in high school comes to a conclusion, I eagerly anticipate being able to create this relationship myself. My picture is a selective color photograph of my classmate Lexany peeking out from underneath a tree at the school football field. I titled this photograph Colorful Mother because Lexany is the representation of the mother of color in a world that is all black and white. She goes from place to place giving color back to the things that have lost their color. However, as she gives life it’s color back she ends up losing her own color; that is why she is black and white with only a bit of color left on her. It is also why most of the things around her are still black and white; she only has so much color to give. In order to make this photograph look the way it does I opened up Photoshop, dragged the photo onto Photoshop, duplicated the layer (photo), desaturated the new layer, clicked on the eraser tool and erased the areas where I wanted to show color again. I like this photograph because whenever I look at it I don’t immediately notice the color that is in it and end up searching the whole photograph to see if I can spot more color. I think that this is what makes it a successful photograph because the viewer will become curious in what else he/she can see in it. My photography has gotten better and I’m able to come up with more creative ideas for new photos, but I know that I still have a lot to learn. I can’t wait to learn more new things about photography. 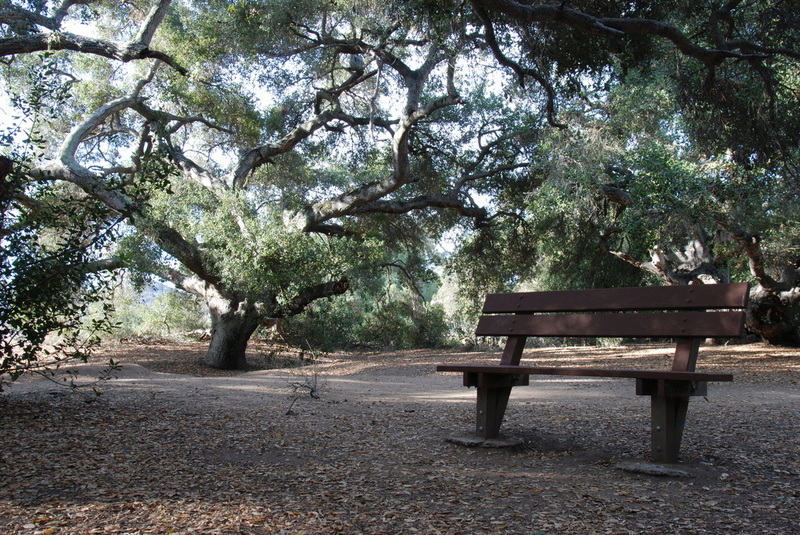 My photograph is an HDR photograph of a bench that is at the duck pond. I named it “The Forest” because the place where I took the photograph looks like it’s in the forest. I took the same picture 5 times with different exposures. I left the picture as it was. I like this picture because I liked how it came out and I liked my use of the Rule of Thirds. I think that I’ve become a better artist throughout the year because I’m able to take pictures how I want to. I titled the photograph Forever and Always because he’s looking at her in a very meaningful way, as if he never would leave her. They’re a power couple. The photo was inspired by a picture of Faith Evans and her husband Tom, and I decided to recreate it with my friends Jose and Carina. 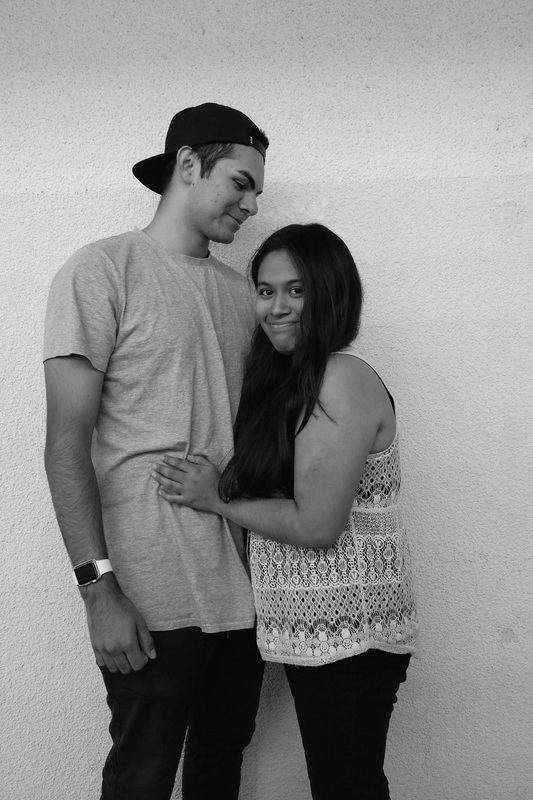 Jose holds the small of her back and looks at her meaningfully, and she’s just staring straight. I love this picture because it spoke to me. Also, I love the fact that the way Jose looked at Carina was in a warm and loving way. I think of myself just as a portrait photographer, I’m not a very creative person in general and I think this photograph describes what I would like to do when I’m older. I’m looking forward to doing more portraits. ​Brian Nateras, Class of 2016, The Black River Pond. 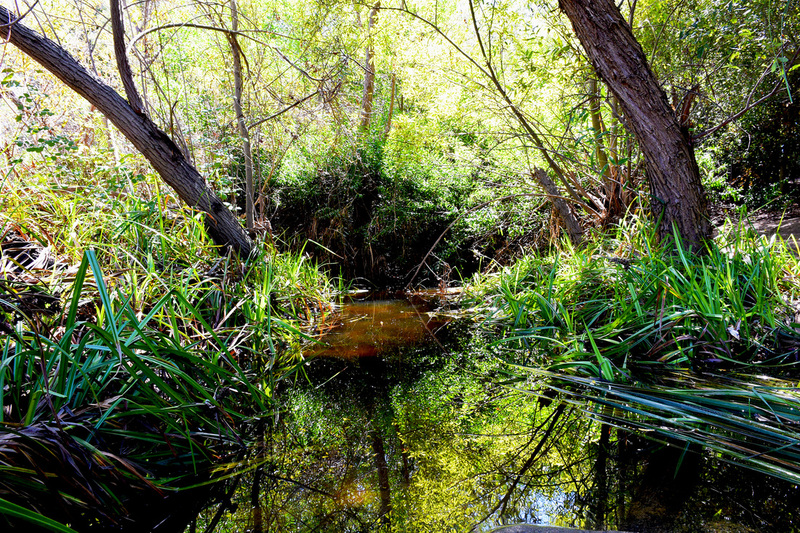 I titled this piece The Black River Pond because the water has a dark color in the pond shows color in photography. 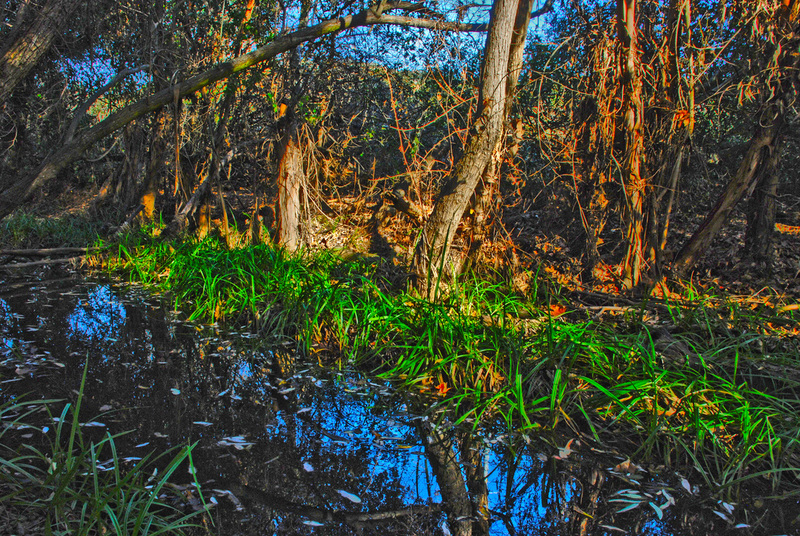 It’s a HDR photo in the duck pond that has lost the color of the trees, plants, and dirt. I make in Photoshop with different exposures like 1.0-, 1.0+, 2.0, 3.0, 4.0. I like because it shows that I put my mind to it and I think my photographs came out really great. I describe myself as a mellow guy that has learned from the best photographers. I have learned a lot from the class- there have been lots of fun projects. I look forward to learning more photography in class. I titled this photo Joy Ride because of the cars separated between a line. 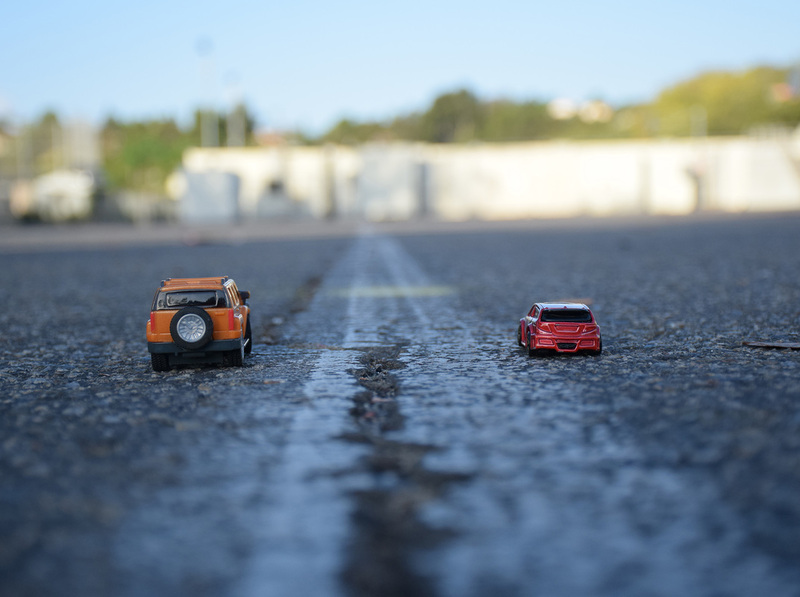 This photo has two toy cars on the “road’ and was taken for the toy project. This was taken at the basketball courts at our school. I used my body to take this, which means I had to get on my stomach to get the right shot. I did not use anything to correct or make this photo better. I like this photo because how it’s just focused on the cars and blurry in the background. It looks like something I would like and buy if it was sold anywhere. I would describe my self as a rookie still but I have grown tons since the beginning of the class. I learned how to edit, take photos correctly and other amazing things. I called my photograph Spinning Tree because I took the photo of tree branches and I just thought the colored leaves were beautiful and really stood out. 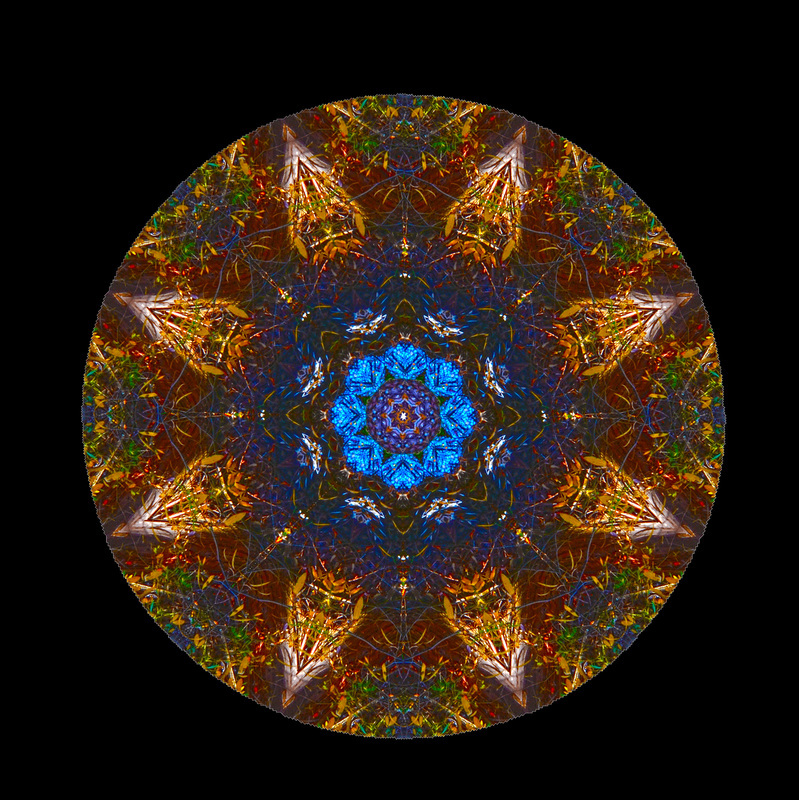 I played with the tools in Photoshop to create my beautiful mandala. I didn’t really edit it, I just added a black background to make it look complete. I like how the mandala came out because it just looks so beautiful and it pops out. I just really liked this photo because it looks very majestic and unique. It’s a successful photograph because it came out so great and I enjoyed making the mandala. Even though I was struggling to make it, it came out gorgeous. I would say I’m a very unique, energetic, free spirited artist. I feel like I learned so many things this year, like learning how to use Photoshop and Lightroom and how to create a website. I’m looking forwarded into learning more about Lightroom and Photoshop and how take professional portraits. I have titled this photo Inside the Whole because when I look at the picture I see a hole as if you’re looking through a microscope and inside that microscope is bunch of little cells as if they were from a person and those cells make a whole of a person. It is a picture of a green bright plant that I spotted outside of class while taking photographs. 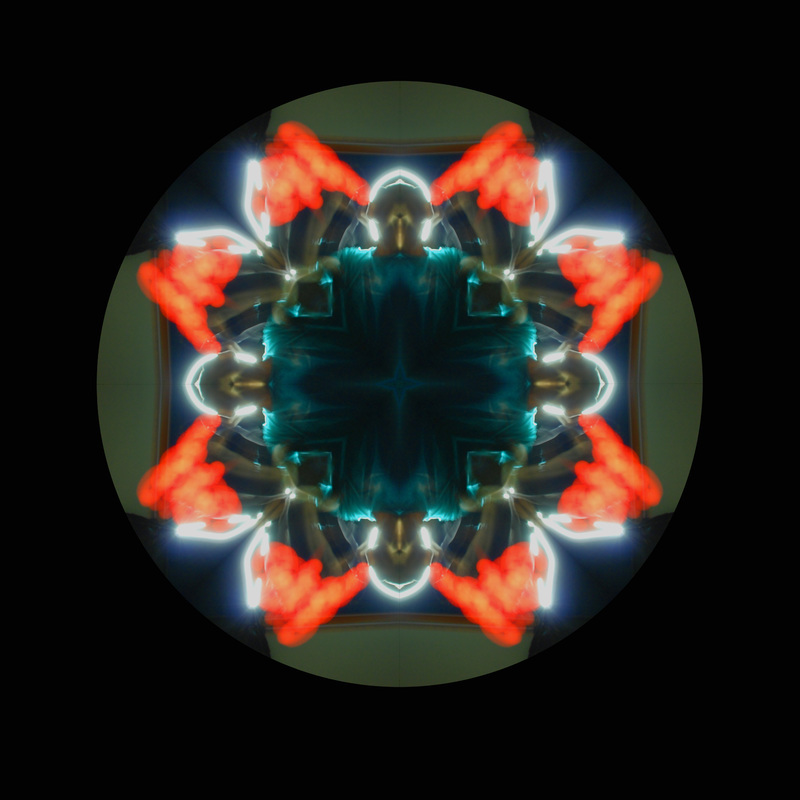 I had to crop it, adjust it and put it together in Adobe Photoshop then after aligning the whole circle together. I adjusted the hue and saturation to a light bluish color and got this result. 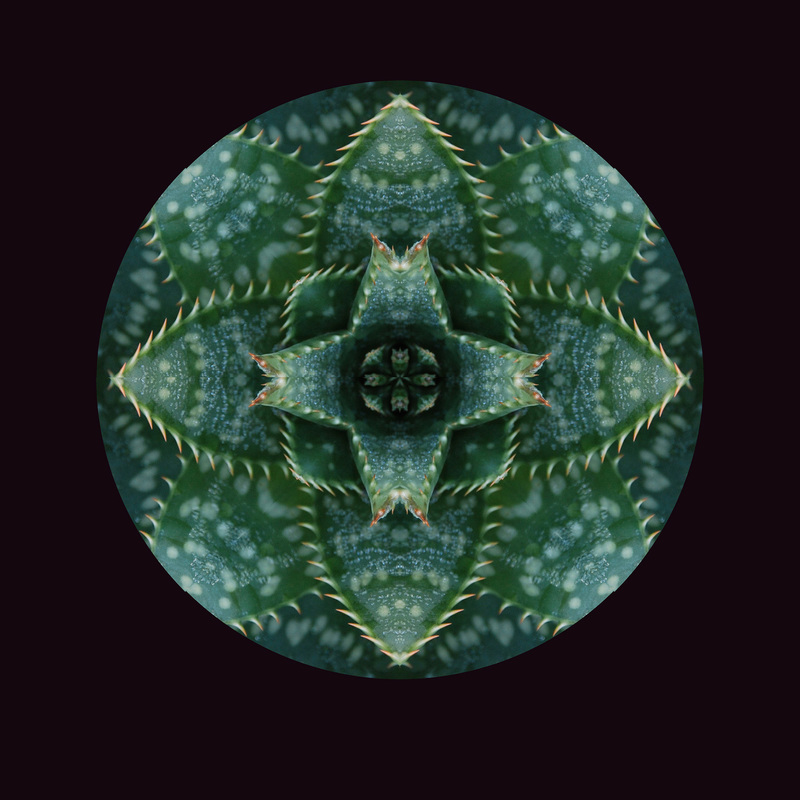 I like this photograph because it created an artistic image of just one plant and to do a circular mandala is pretty hard work but we found a way to master it and got this final image as a result. As an artist I would describe myself as a calm and on task photographer because in order to capture photographs that you want, you need patience and an eye out for your surroundings. I am looking forward to learn more techniques in photography and ways to improve my photographs and make them into photographs that will represent me as an artist. This is a photograph I took at the duck pond. I named my photograph A Gloomy Day because when you look at this image you get a feel of sadness. 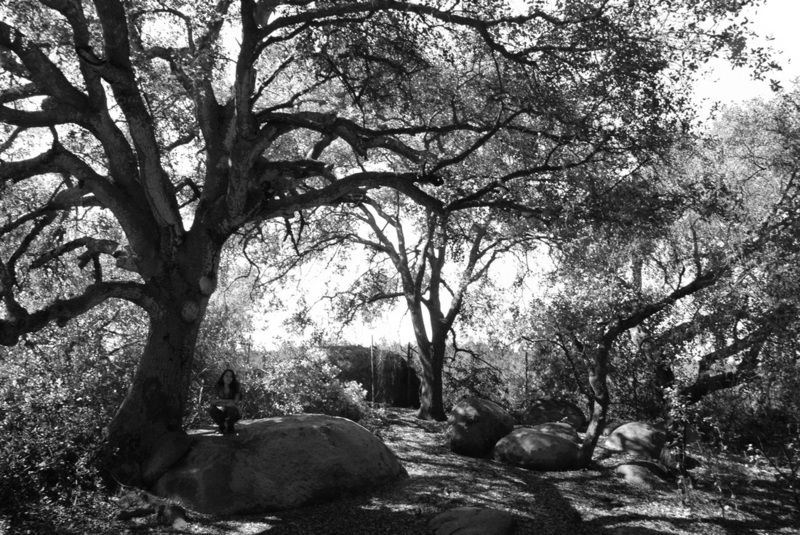 This is a picture of a tree and my partner sitting on top of a boulder. I used Rule of Thirds to take this and then I simply edited it black and white in Photoshop. I like this picture because the trees, the color, and the lonely girl contribute to the title. Something I am most proud of is that I have become more creative as the year goes by. I feel like I’ve gotten better at using Photoshop and my pictures are clearer and in focus. 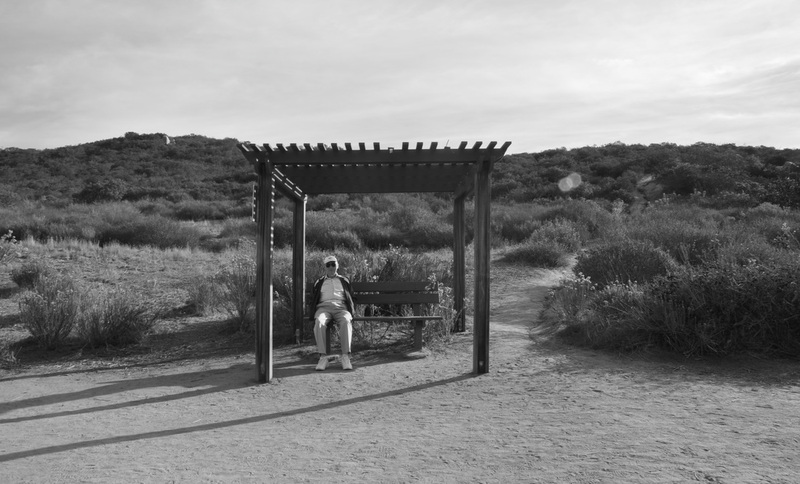 I titled my photograph The Sitting Man because Gerardo is sitting in the photograph with a stern facial expression. This photograph is a picture of a Gerardo sitting throughout multiple areas in the same aisle of the stadium’s seats. I made this photograph by standing in one specific spot while Gerardo sat in the same aisle of seats and continuously moved over to the left every four shots. After the pictures were taken I uploaded the images to the computer and then uploaded them to photo shop. In Photoshop I selected choose file> automate> photo merge. I enjoy this photograph because of the placement Gerardo is in. Gerardo’s facial expression shows gradually and you can see the emotion in the photo. The photograph shows thought throughout his face.I believe this is a successful picture because the photo merge is done successfully with no extra lines or nonvisible pieces of the person. To describe myself as an artist I would say that I am a successful photographer even when faced with frustrating circumstances. I strive to be the best that I can be. I have learned multiple things this year; however, the thing I learned the most is focusing on emotion and creating successful photographs throughout individual’s personalities. I’m looking forward to learning more about Lightroom and the effects it can create within a photo. I have called my piece of art Beyond What The Eye Can See, because the purpose is to look beyond what is in front of the face, the purpose is to look beyond the photo, to look deeper within the photo. The picture is of a dead flower with water drops on the flower that was frozen. I made the picture into a Tessellation, a repeated 4” pattern in Adobe Photoshop. I then made a color adjustment, making the yellow pop out more than the other colors. I like it because it is so clear and pure, as well as being able to look further into the picture. The photo came out successfully because the four individual pieces fit together well and it becomes another shape. I am more of a exploring artist, not going with the same old ideas, which can be great at times but not my style. I like to experiment with different photos, like to do crazy things in Photoshop to see what I can do. I want to learn more to increase my abilities and explore more of the photography world. The reason why I gave this photograph the title Eyes of Despair is because the girl (who is my sister) in the photo is praying and looking for hope to see her lost family. 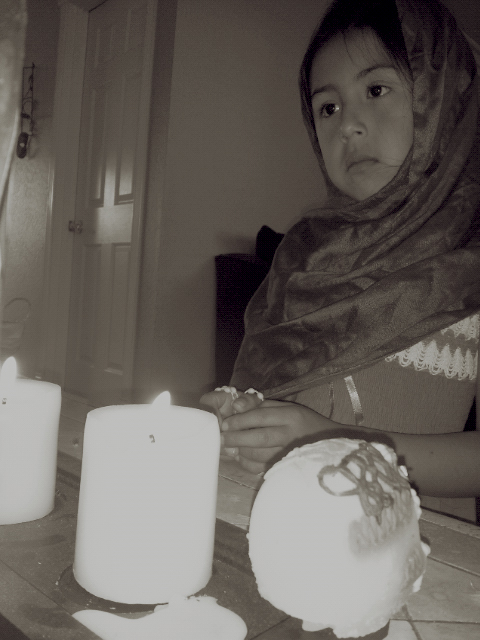 The photograph is about a Mexican tradition call Dia de los Muertos. This holiday is very common throughout Mexico.The people go see their past loved ones at the cemetery, have mass and pray for one day to reunite with them. The reason why I had done this photo was because I was trying to imitate Manuel Alvarez Bravo's style. He had a very rustic feel to all his photographs and he tried to capture all Mexican traditions. I created this photograph by having my sister stand in front of our altar we had at home. Soon afterwards I dragged the photo into Adobe Photoshop and kicked up the brightness, darkness, and put a brownish filter on top. What I liked most of this photograph was that I really felt I got that rustic feel and the mood it sets. I feel like this photograph is successful because I really put in effort to capture Manuel Alvarez Bravo’s style. If I had to describe myself as an artist it would be that I have a very natural feel, I really enjoy the rustic old fashioned feel of photographs. So far I have learned that lighting is one of the key parts in taking an amazing photo. Sometimes you can’t force a picture to happen, it has to come naturally to you. I’m looking forward to discovering new styles of photography and seeing what I am capable of doing. 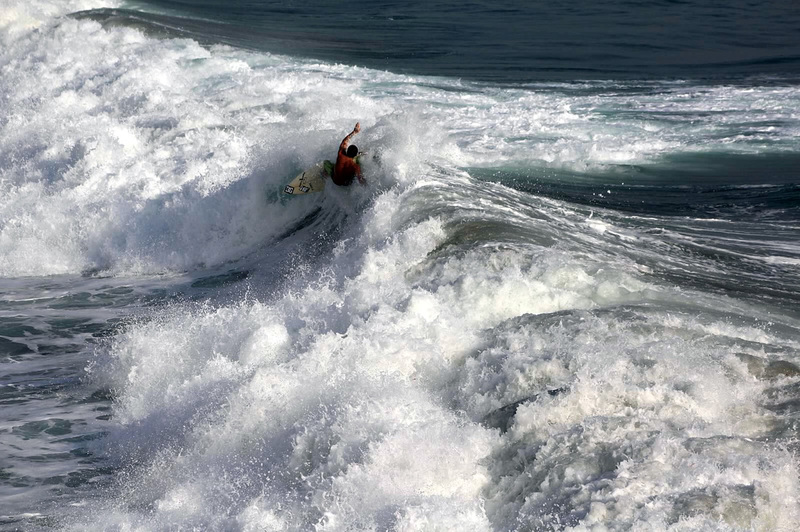 My photograph is of a surfer in Oceanside. I titled it Heart of the Ocean because surfers love the ocean and some have grown up surfing. To capture this action shot of the surfer I went onto the pier and was watching him. On the camera I switched the camera mode to a fast shutter speed in order to get the perfect shot of him. I love this photograph because it's clear quality and a great action shot. I describe myself as an artist by thinking outside of the box. I go all out when I take photographs. This year I have learned more things about Lightroom and how to do more creative work. I look forward to learning more about Photoshop. 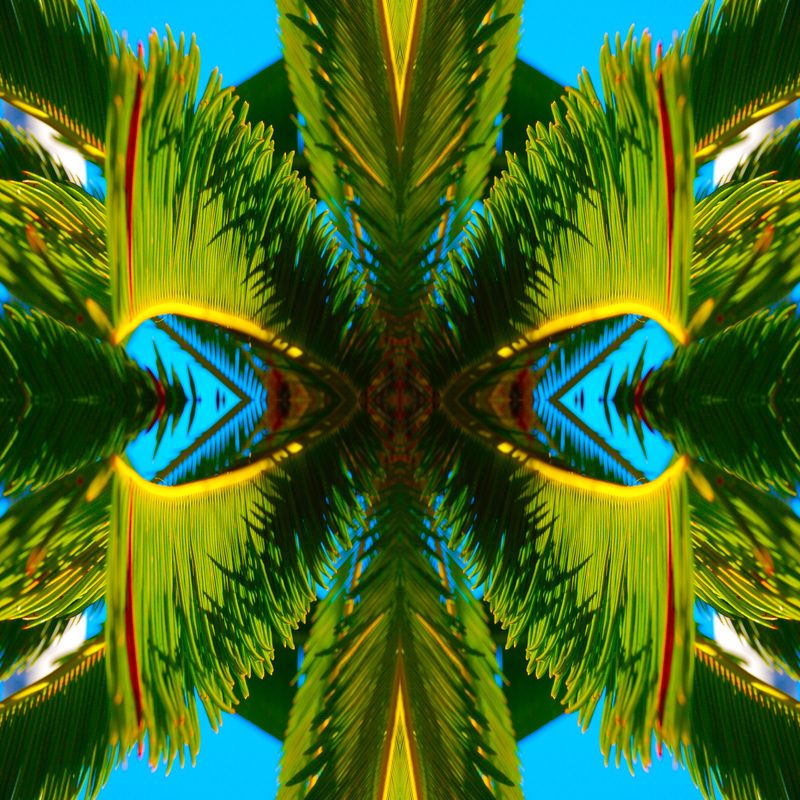 My picture is a circular mandala of a close up of a palm tree. I liked this picture because it came out really nice. I called this picture Tribal Mosaic because this picture reminds me of a tribal print mosaic because of the texture of this picture and all the geometric shapes that it has all the shapes. All the designs really build on each other and make the picture look 3D. I feel like this picture is really one of my best pictures this year. My picture is of natural framing at the duck pond. I titled it Greenery because of all the different hues of green you seen in the photograph. I also named it this because this photo reminded me of a greenhouse because of the shadows and highlights. To make this picture I edited it in Photoshop. I adjusted the brightness and contrast, added more saturation to the picture, and adjusted the color balance levels. I really like this picture because I love nature and landscape photography. I really love the different highlights and shadows throughout the photo. I think this photograph is successful because it expresses value, harmony, and unity. I would describe myself random and creative artist. I don’t really like to plan what I am what I am going to photograph, I like to go with the flow of things. 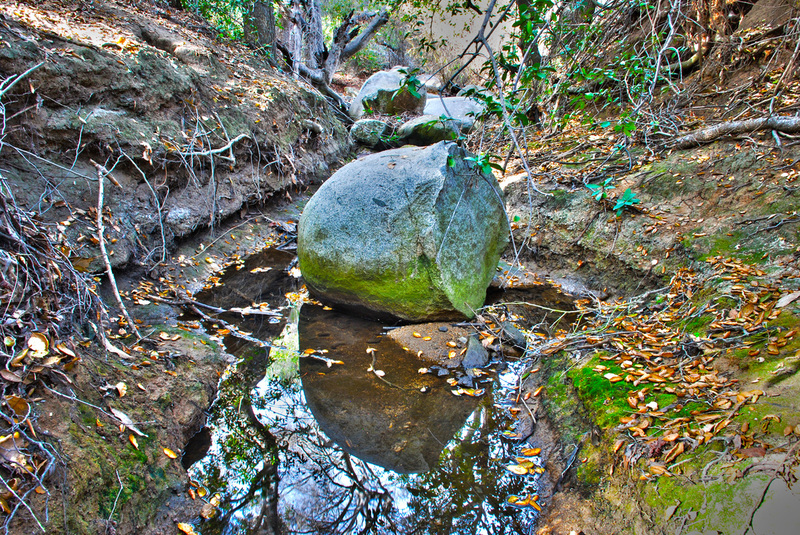 This HDR photograph portrays a large rock, which has a reflection in a small creek; however that is not the only thing being reflected. 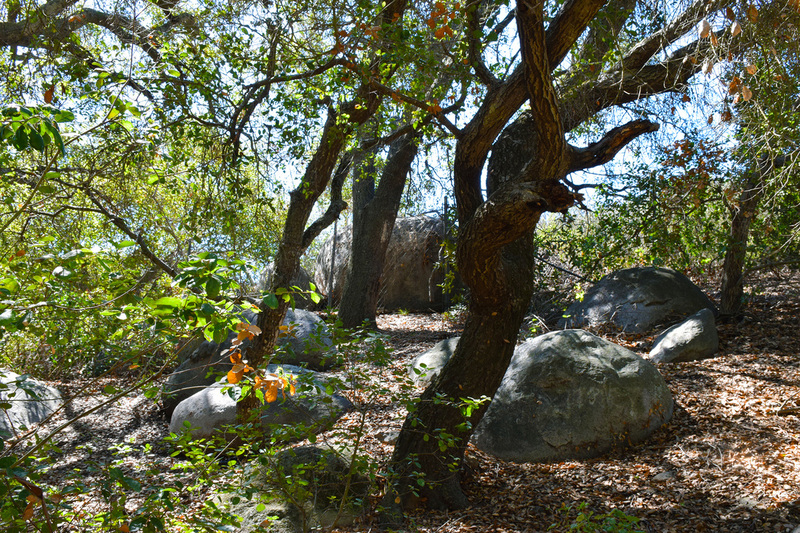 I named my photo Growth to signify that although the rock is not physically growing, the trees surrounding it are. The reflection of the rock is only a smaller portion of the true potential around it. Creating this photo was simple, with the camera on a tripod; I took five copy photos each with different exposures such as -1.0 through +1.0 in sections of .5 measurements. Then taking those photos I opened them in photo shop as an HDR file and edited the now one combined photo to my liking by enhancing brightness and contrast. I personally enjoy this photo because of the great amount of detail as well as the colorfulness of it, which also makes this photograph successful. I describe myself as an artist in learning; I have much to even experience, which excites me for the following year. I look forward to learning more about what angles to take a photo at and the opportunities of Photoshop. This photograph represents the end of winter or the coming of spring. It shows grass growing from the snow and the land itself is a lushest green and you don’t really see very much snow. 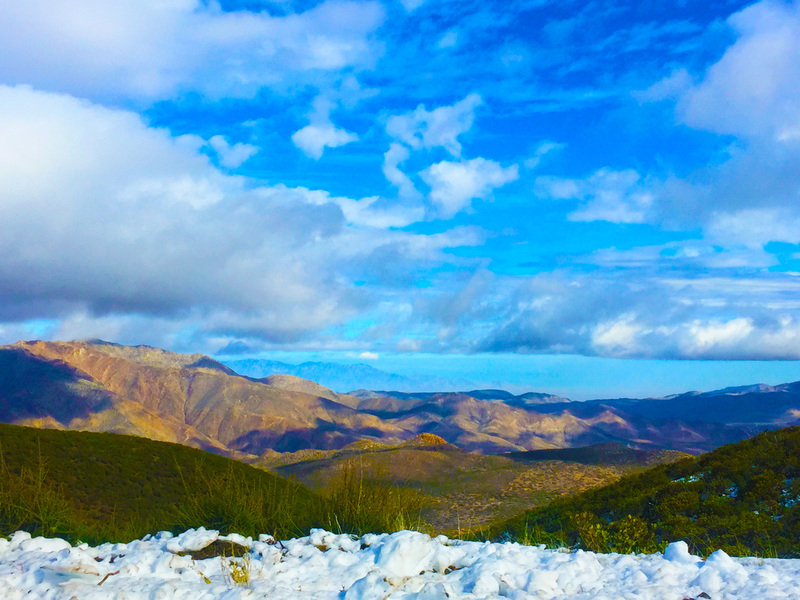 This is a landscape picture and was taken at Mount Julian by the side of the road where the snow was pushed aside and it had a great view of the land that was left untouched. I had to saturate it a little and brighten up the shadows so you could see the beautiful colors that nature has to offer. I like this photograph because I love the view of the land and the clouds. The fact that there are so many clouds with different shapes and sizes and the snow at the bottom of the photograph really brings that winter feeling and makes it all come together. I would describe myself as a landscape photographer because I like the view of the land with different colors and different layouts from straight plains to rocky mountains to deep caverns and flowing rivers. My picture is of a hole in a tree.I was in Photoshop and I use polar coordinates.I like my photo for the many faces in it and the photo is successful because of the weird and uniqueness.I am an artist that likes pictures of moments or I just like a weird photo, I have learned to do a 360 view of a photo and I looking forward to learning how to make people float and be invisible. My picture is a landscape photograph of a path at the duck pond. 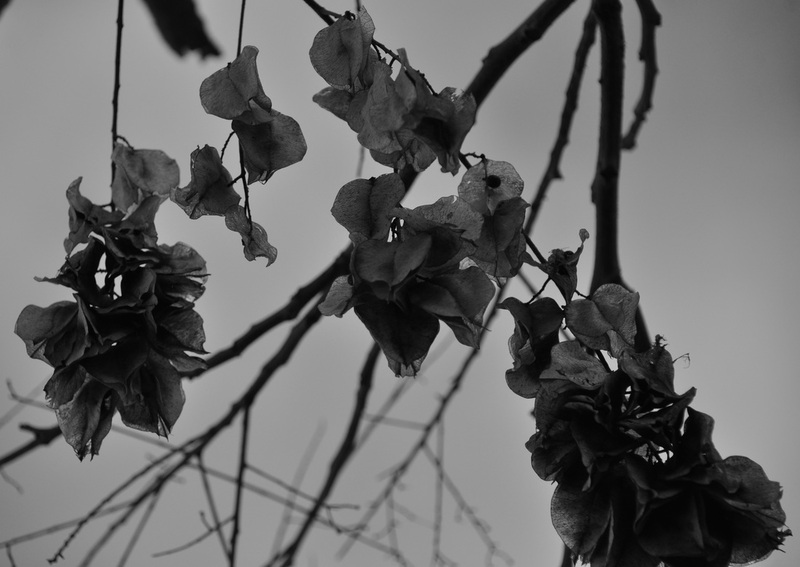 I title it A Dark Sky because it was cloudy and I thought it would be cool if I took a dark picture with those leaves. I have never done this before. I usually see these types of pictures on Tumblr and I like them so I decided to take one. I took several pictures until I finally took the one I wanted to take. The ISO is 200, the aperture is f/5.6. I used Adobe Photoshop to play around with the contrast of the picture and I did the same thing with the colors of it. I also used the Snapseed app to make it kind of vintage. My artistry is getting better each day and I enjoy taking pictures of random things and make it look awesome. I’ve learned a lot throughout the whole year and hopefully I learn more because I really enjoy taking pictures and I like to mess around with pictures on the computer. 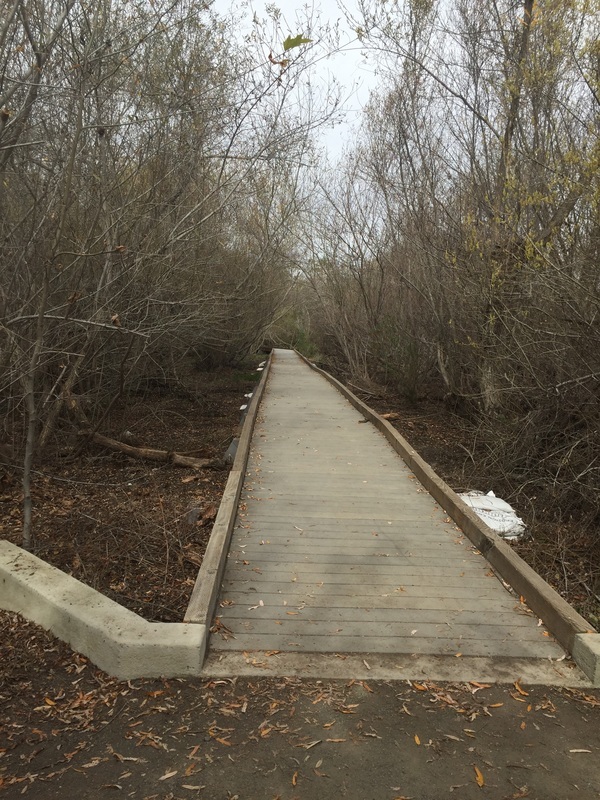 I named this photograph Path to Success because it shows how far the end of the path is. 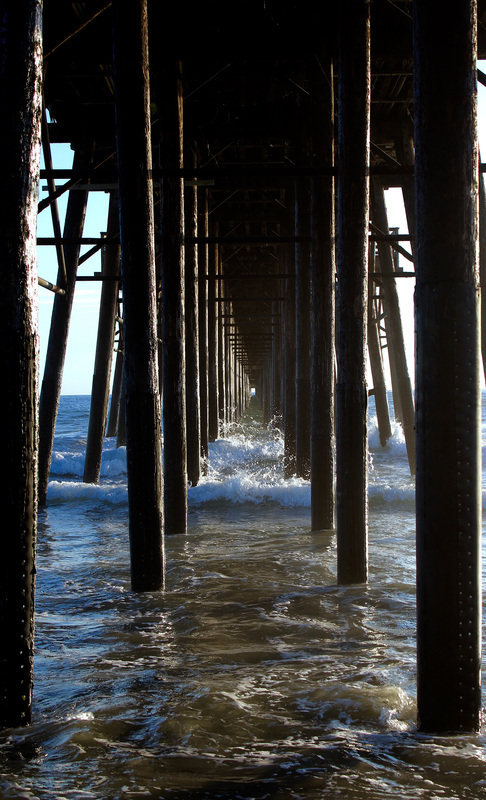 This picture was taken under the Oceanside Pier. I used iPhoto and I exposed the picture for it to be a bit dark. I really enjoy this photograph because I took this at the one place I truly love. I take advantage that I live 15 minutes away from it and cherish every moment that I’m there. This photograph came out successful because of how symmetrical it can be. Even though that wasn’t my intention that’s how it came out. I never really thought of myself as an artist and I still kind of don’t. I would just have to say it’s something different and fun to do. I’ve learned how to actually use a camera the right way and use the effects it has on it. I’m looking forward on learning on how to get the hang of the camera and how to succeed in taking better pictures. I titled the picture Blue Curl because of how this wave was curling, about to crash down. 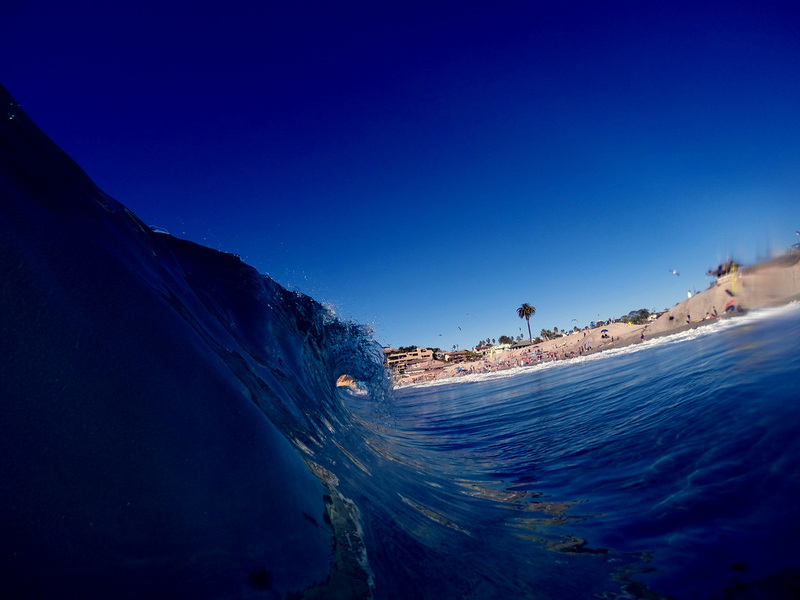 This picture of the wave I took with my Gopro was so blue and clear because it was located at Encinitas. 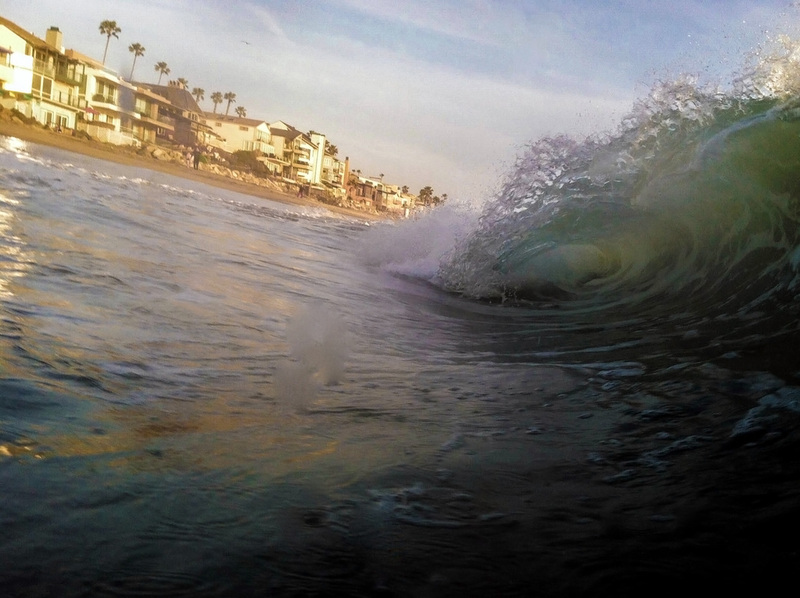 The setting I had on my Gopro was to put it on shutter speed and set it to 10 pictures per second, so it captured the wave falling. To brighten the blue, I used Photoshop that has brightness and contrasting and saturation. I love this photo because I really enjoyed the process of trying to capture it. I love going to the beach and to be out in the ocean. It’s always so exciting capturing shore breaks. My biggest inspiration into taking these photos would be Clark Little. Compared to his pictures, this picture is nothing. He literally risks his life by capturing some deadly waves. 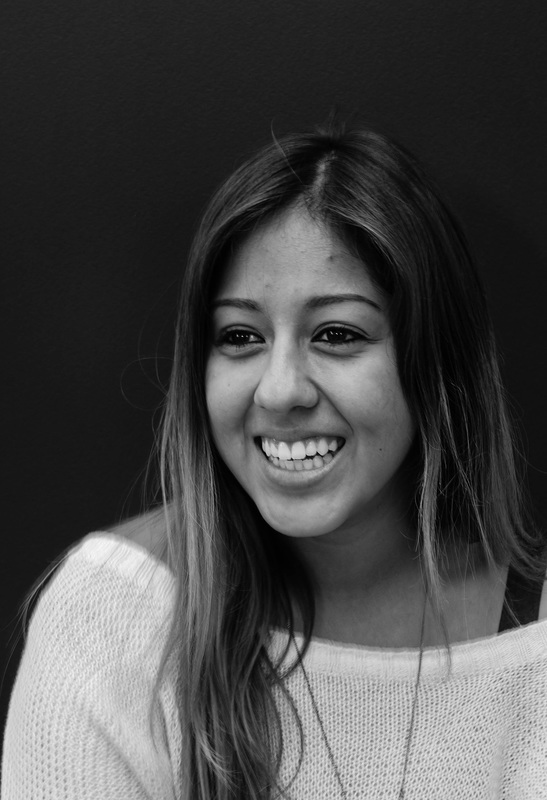 I would describe myself as a Californian type of artist; I like to take pictures of the beach or portraits for others. This year I’ve really learned how to use Photoshop and I can’t wait to download it myself and play with my photos. 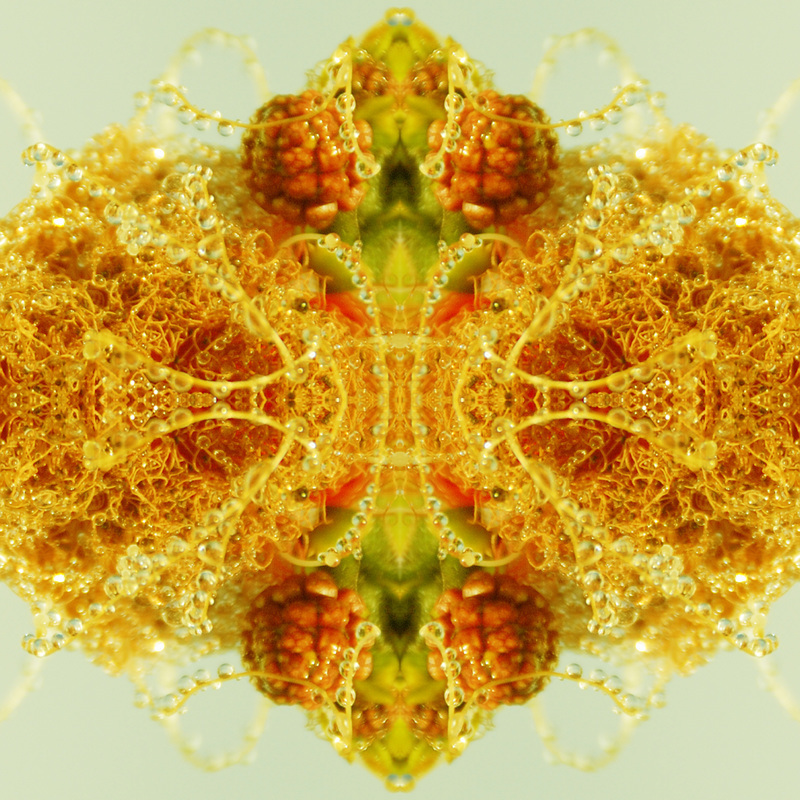 I’ve enjoyed learning cool ways to edit my photos like the mandalas and layer masks. 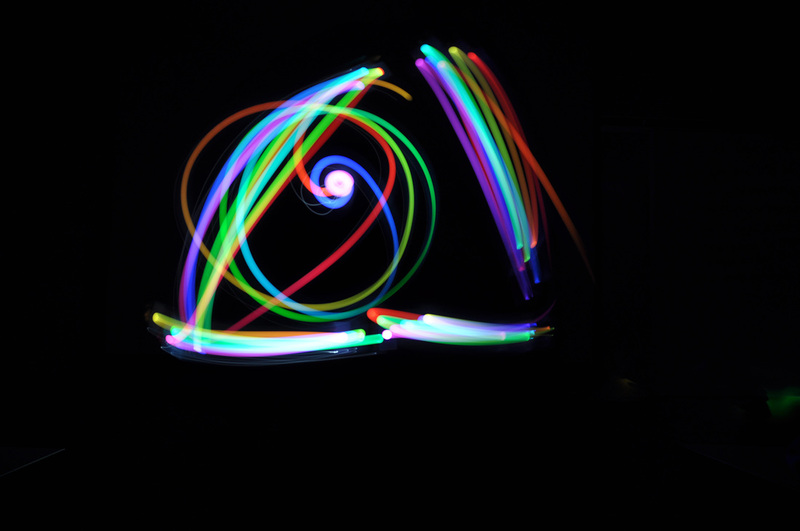 My picture is a mandela of Zach Wimsatt in a light painting photo. I titled this photo, Light Shows because it is a light painting of Zachary spitting fire out of his mouth. I made this photo through Photoshop using one picture and combining them through the Mandela circle template. Why I like this photo so much is because it shows abnormality without an edit of the original picture, except for making it into a Mandela. I think this is a very successful photograph because it captures how you can change a normal picture by just using light and slow shutter speed. The way I would describe myself as a artist is that I like capturing the perfect background with the person holding the same pose. I’ve learned how to double-check my photos to make sure I like it. I look forward to learning how to master photography. 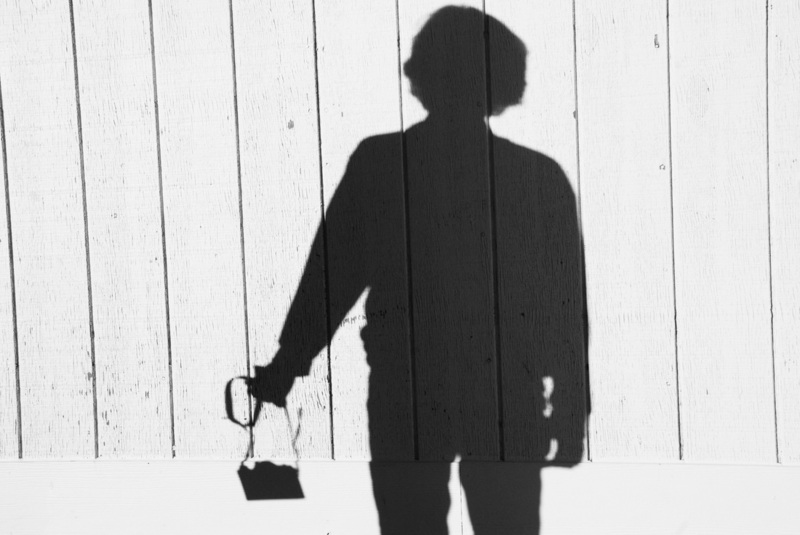 I choose this tittle for my photo because we can all see what the shadow is showing us, we can see what made this shadow, and also we can see other little details which tells us something about the main thing that made the shadow, like this little camera in the hand of a person. For this picture, I choose Jake Blackstone to be a model with his own camera in one hand, and found the perfect classroom wall for his shadow. I edited my photo in Photoshop, turned it into black and white, and changed the contrast. I like this photo because I never thought shadows can be this good for photography, and I finally got a chance to make one. It’s very successful photograph for me because I took it in the morning, where sun wasn’t that bright. I would describe myself a beginner as an artist. This is still all new for me, and I’m glad to have this chance in class to learn so many new and different things about photography which I can use later in my life, and I’m sure I will. I have titled this photograph Slippery Road to Success for the emotional feeling of the picture. 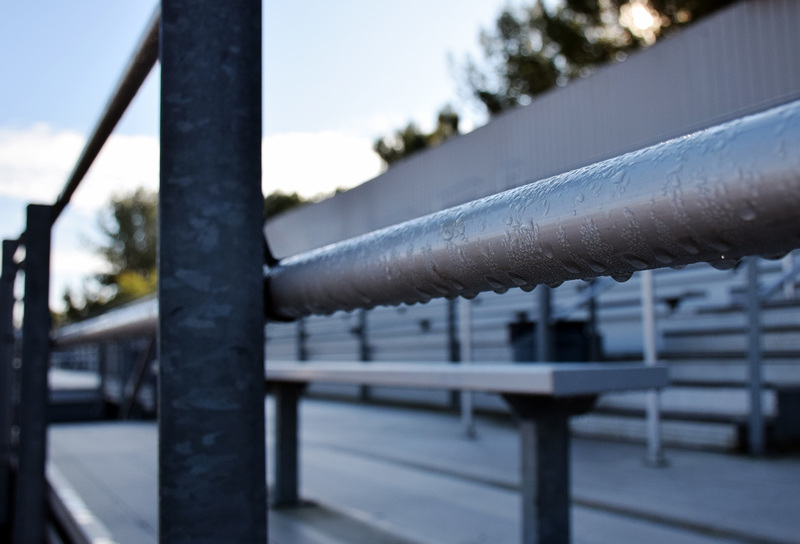 This is a picture of one of the railings at the football stadium on the away side. To make this photo as well as I possibly could I edited it with Photoshop to brighten up the photo. I like it because it shows the clarity of rain drops in the photo. I think this was a successful photo for the reason of how I blurred out the background just enough and the clarity was up close. I would describe myself as an outdoor artist. I love being outdoors and actively being involved with my photos. I have learned various things about cameras that I have not known about. I am looking forward to taking action photos and entering into a contest with my photos. My picture is a photograph of framing I took in the duck pond. I named it Beautiful Sunny Day because the man in the picture was relaxing and taking a break in the bench on a sunny day. To take this picture I just nicely asked the man if I could take a picture of him and he said “Yeah, sure, why not.” I had the camera on f/8 because f/8 is great. I also had the ISO on 100 because it was outdoors and sunny. For the final touches I just made the photograph black and white on Adobe Photoshop. 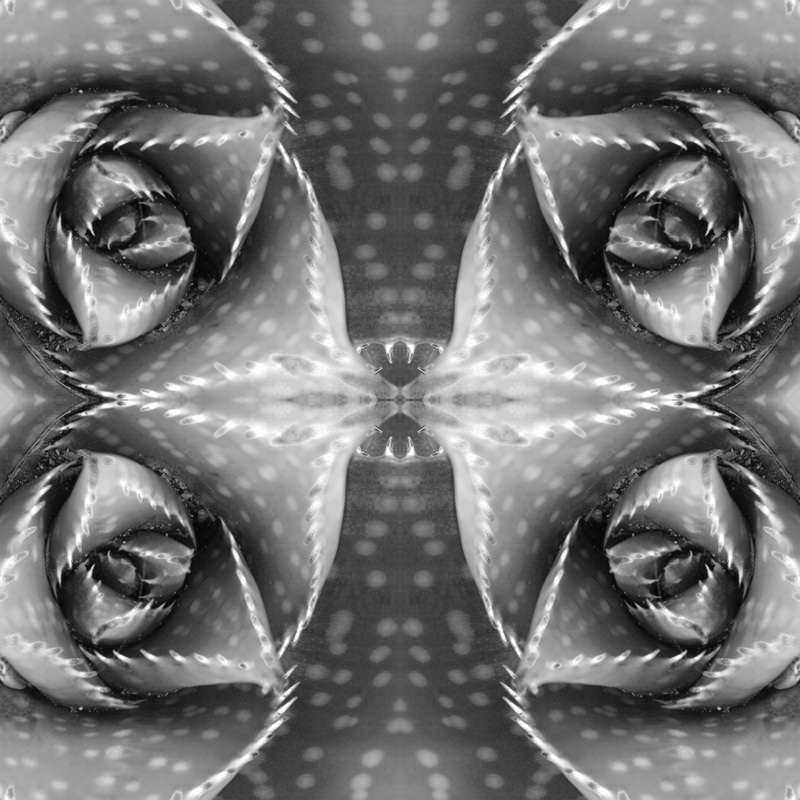 My picture is a tessellation that I made out of a photo I took of leaves shaped like a flower. I titled it Clover Field because of the strong green and blue colors that you see, and the fine detail that you are able to see in the pedals remind me of the details you are able to see in clovers. It is my own version of a clover. In order to make this photograph, I had to make an 8inch template on Photoshop, by clicking “view” then clicking “rulers.” From there I slid down to 4 inches, then slid from the left over to 4 inches. After I selected the photo I wanted to use and I cropped the image down to 4 inches. I then used the move tool to drag the photo onto the template, then I duplicated the layer and moved it into the next square and flipped the image horizontally. Once I placed the second image in the second square, I went back to the first layer and duplicated it once again, and repeated the same steps as before. 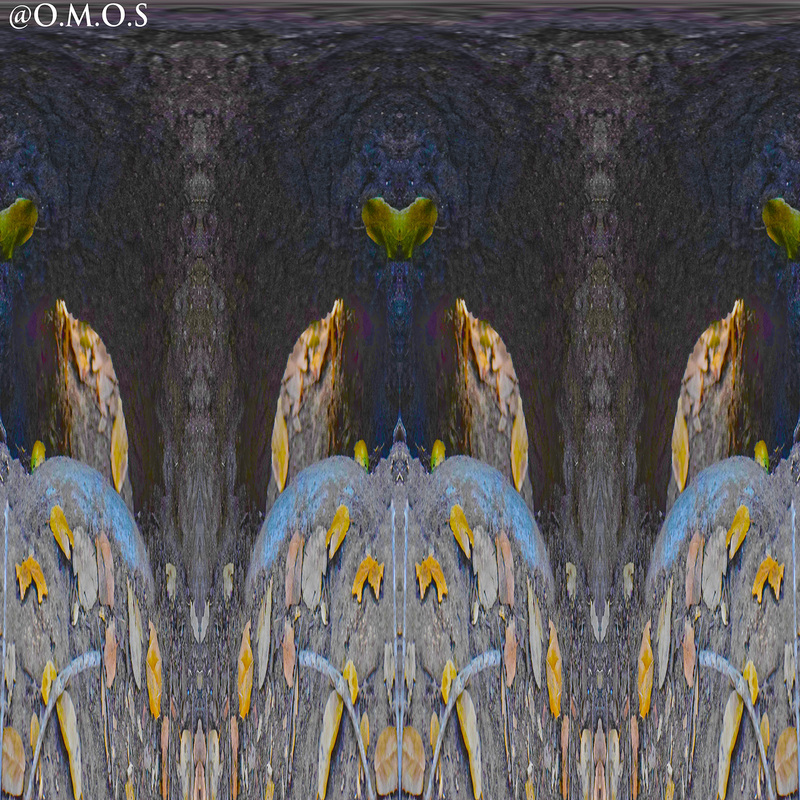 Once I placed all four images that way I liked them, I merged the layers together. After I merged the layers, I desaturated the image to my liking, and changed the levels of exposure in order to make the green and blue colors pop more. I really like this photo because of the way you are able to see the very fine detail like the water drops on the pedals. So far this year I have learned so much in photography. I learned all the different parts of a camera so I can take better pictures and change the necessary things in order to make the picture look better. I’m looking forward to learning more about Photoshop, and the different projects we are going to be doing the rest of this year. 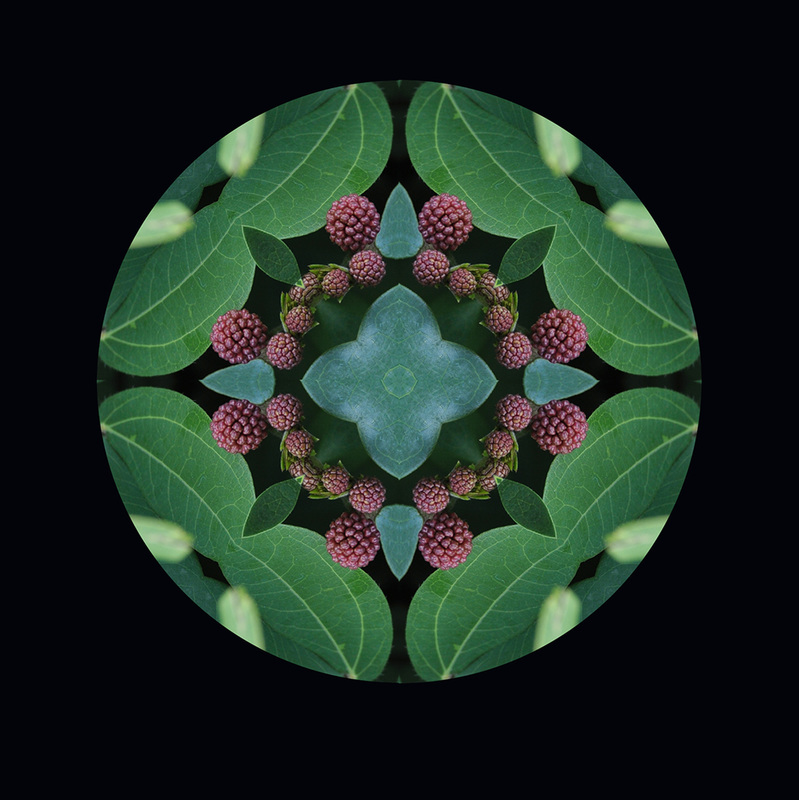 My picture is a circular mandala photograph of a bush with raspberries near the track. I titled it Into The Forest because the picture seems as if you are in a forest and found this bush with raspberries in it. 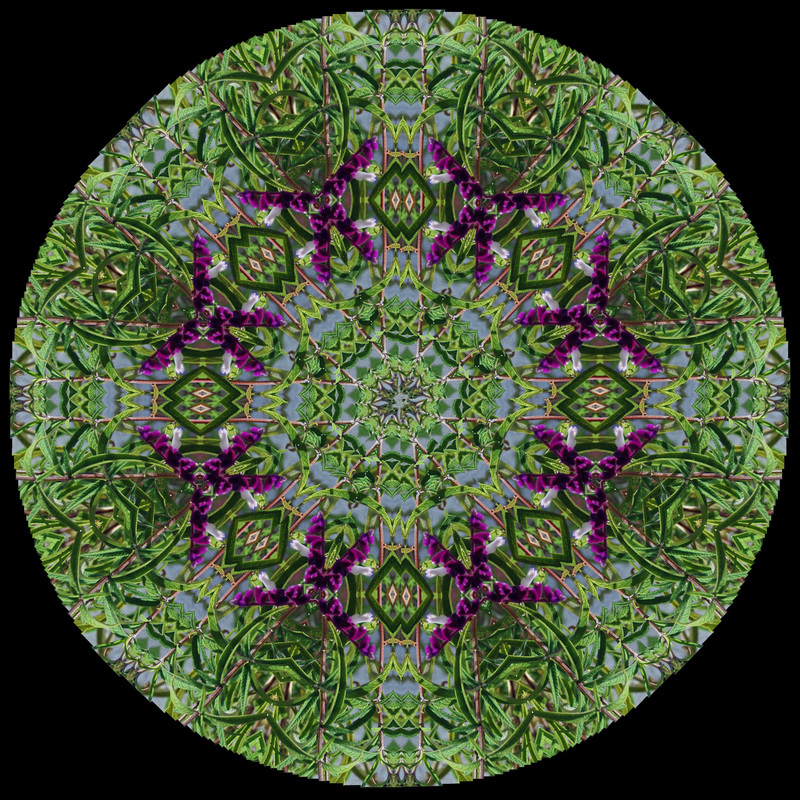 I created this mandala by zooming in exactly in the proportioned area of leaves were and a raspberries next to it. I then proceeded to Photoshop and opened up my picture to crop it to the exact position that I wanted my mandala to concentrate in. I opened up the specific piece that I wanted in mandala and passed it on the template. Once I placed the layer I duplicated the layer until I created my circular mandala. I think I have improved as an artist by a lot this year because I was able to create this beautiful picture. I named this picture A Light in a River because I learned that rivers in literature represent a journey and for the light to be shining in focus on the idea of an adventures journey. This is a small river close to the bridge in the Duck Pond. To make this picture I played with it in Photoshop when doing the project of HDR. I took five photos using different exposures ranging from +1 to -1 and merged the layers together, in which then I adjusted the saturation, which brought out the small details of this landscape. I really like this picture because I’m a person who loves nature and try to find places that I can relax from the stress. 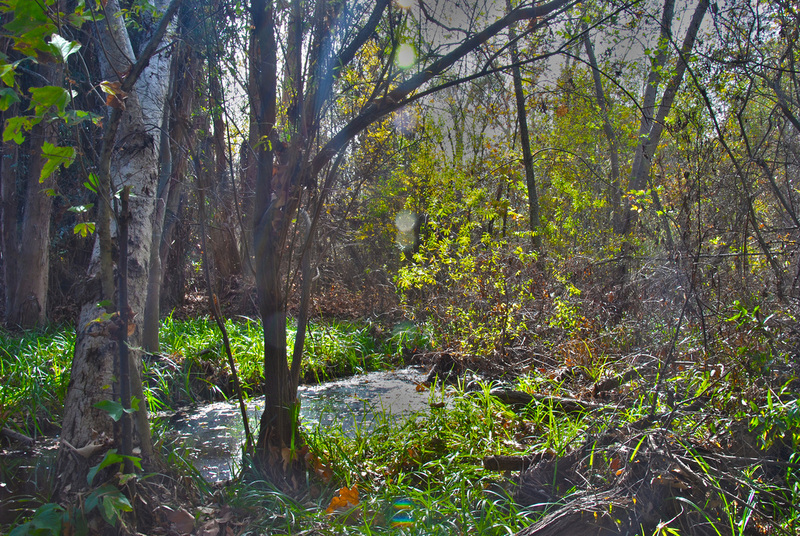 I love this picture because I had previously took this picture for just landscape and I really loved this place and taking it with HDR brought the detail that surrounds the small river and with the sun shining we are able to see more of the plants. As an artist I really love finding places or writing things that I’m able to express myself. I love the idea that a picture can express one million word. This year, I’m still learning to use a camera and the settings to bring certain aspects of an image. Learning about how to certain details or adjusting an image is really fun to learn. I’m really excited to learn how to use more of Photoshop as I’m learning how to edit pictures that I‘ve taken myself. I chose to title this photo Through The Eyes Of A Dog because in this picture you can see that the dog is staring off into the distance. 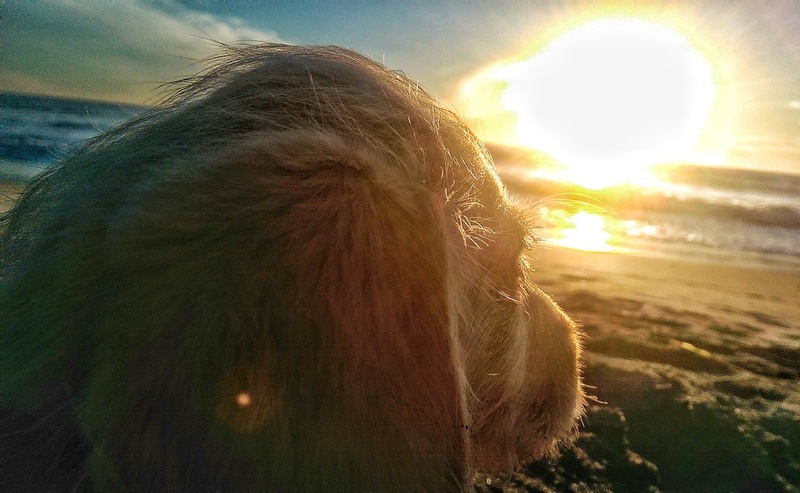 This is a picture of my dog at the beach looking at the ocean. I took this picture with my phone and then edited it in an app called Snapseed. I enjoy this photo because it has a shallow depth of field in that my dog is focused and the area that my dog is looking at is blurred. As an artist I would say that I like to seek to find a perfect picture and this year I have learned how to apply new aspects of photography to my pictures. I titled my photograph Blooming Tree because the tree has many branches that all branch out to the side like how when a flower blooms all of its pedals are bloomed out. 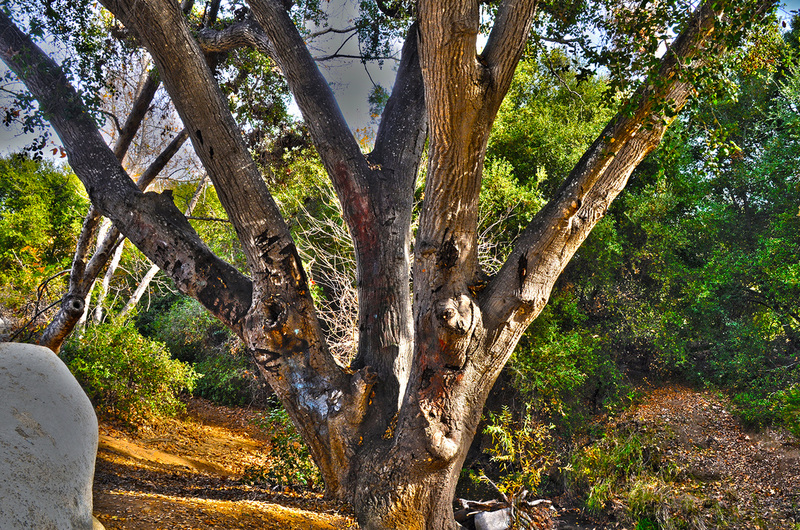 My photograph is an HDR photograph of a tree I found while at the duck pond. What I did to this photograph was taking this same picture and position five times repeatedly with different exposures ranging from -1.0 to +1.0 in sections of .5. After that, I opened the pictures up in Photoshop and merged all five pictures into one single picture. I turned it into an HDR photograph, and then changed the exposure and contrast until it looked the way I liked it. I like this photograph because the color and exposure is much different than other photographs I have taken and I love the colors shown in it, since I like bright colors. So far this year I have learned and grown as an artist. I have learned how to use Photoshop and the different things that can be done in Photoshop, such as HDR and tessellations and mandalas. 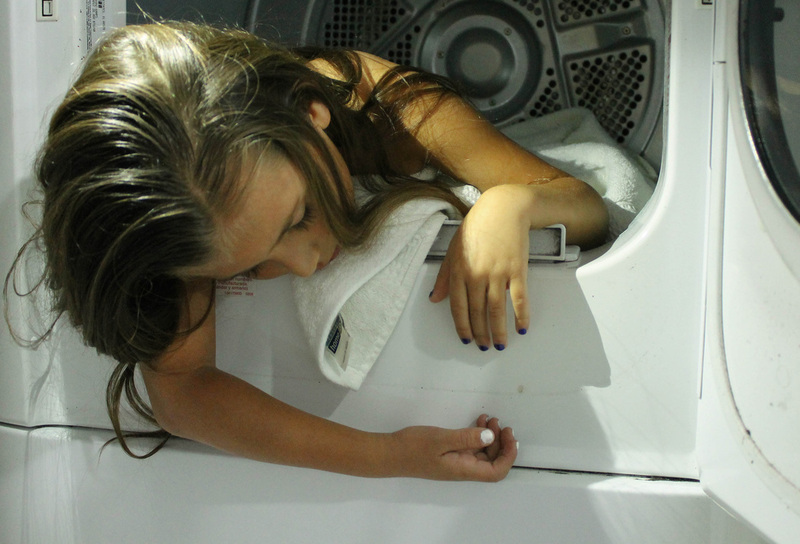 My picture is of my little cousin in a dryer with white towels surrounding her. I titled it Hidden Mystery because the hidden mystery comes from everyone asking why I decided to put her in the dyer with those towels. To make this picture I opened it up in Lightroom and added a little bit of a yellow and green tint to make the picture look more mysterious. I believe this image is successful because I was able to capture the sense of mystery and wondering. I have learned how to capture more emotion and meaning in my pictures so far this year and I would say that my photography has a little mystery behind every picture. My picture is a macro photograph of a flower by the dirt path at the football stadium. 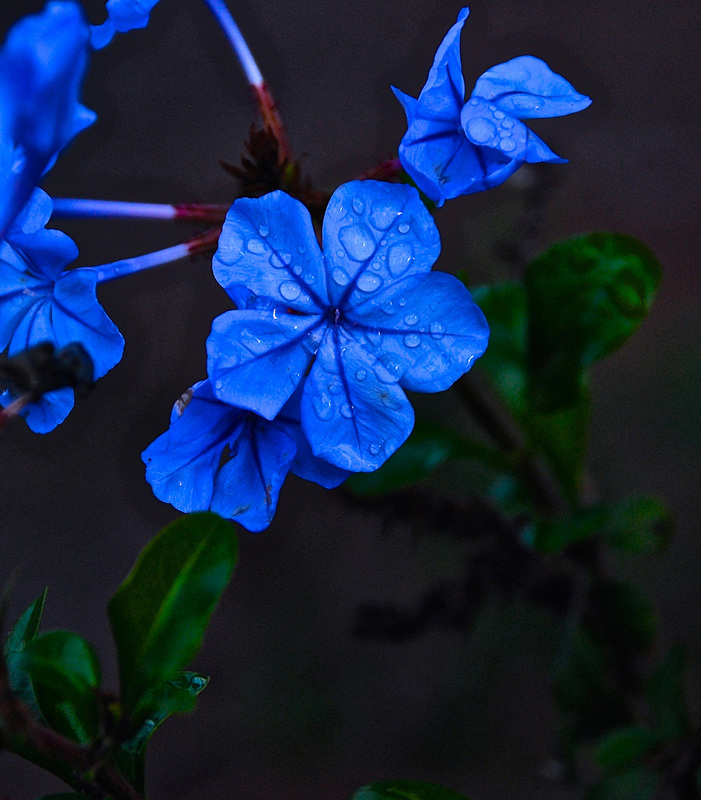 I titled it “After the Rain” because El Niño had just past with a big rain storm and the water droplets that stay on the flowers and plants look really cool. I took this photo during my first week being introduced into the class using a macro lens to get up close and very descriptive pictures of smaller things. After doing so I opened up Photoshop and just played around with the edit a saturation tools to give it a more of a darker and cooler feel as well as making it the first thing that catches your eye. I like it because it gives off a painted look with the water placed onto flower, as well as it being focused and clear. As of right now I’m still learning the ropes of what a good picture will look like even though there’s no such thing as a bad picture, but I’m working on what I can do to make a good picture and what would look nice. I titled this photograph Shark Bait because it is a picture of a shark hunting its prey. 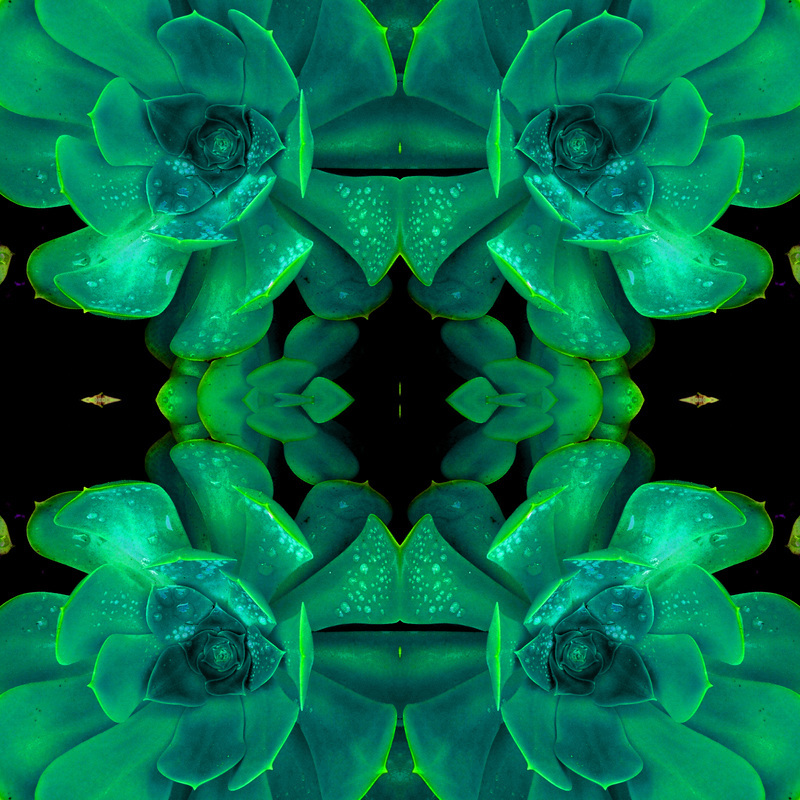 I made this photo in Photoshop by making a two inch tessellation and duplicating the photo, flipping it vertically, and flipping it horizontally. I like this photo because I had to dive deep into the ocean and the shark came up out of nowhere and scared me. I like the tessellation of it because of the colors that blended together. I think it is a successful photo because not a lot of people would actually take this photo so it is unique. 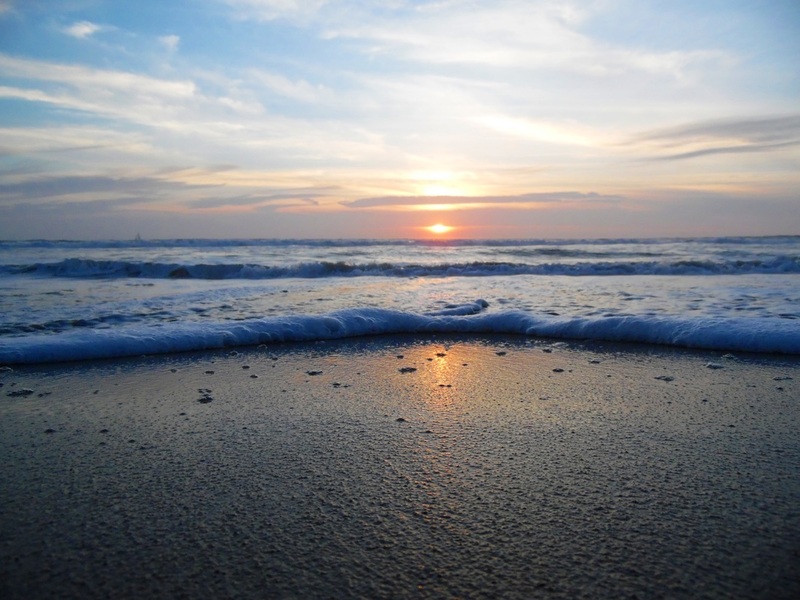 I would describe myself as an ocean photographer and that my photos take your breath away so there will be no words needed to describe my photos. I have learned how to use Photoshop this year and looking forward to learning more about the program this year. 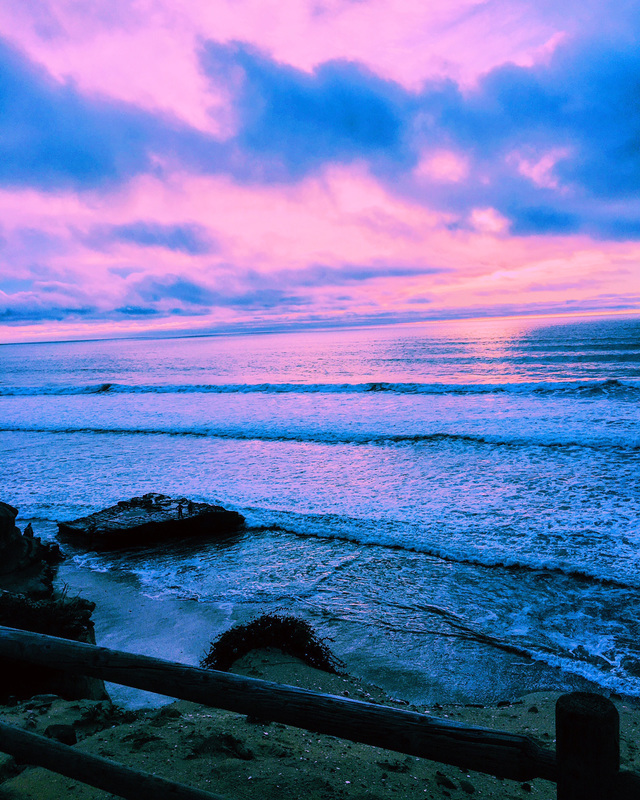 My photograph was taken at Torrey Pines State Beach. I titled it The Deep Blue because it’s displaying the blue features of the ocean. I took this picture on my phone a few weeks ago when I went hiking in Torrey Pines, and I edited this photo on my phone. I like this photo because I think it’s a pretty photograph of the ocean and the sunset. So far, this year I have learned how to take better pictures and how to use a camera. 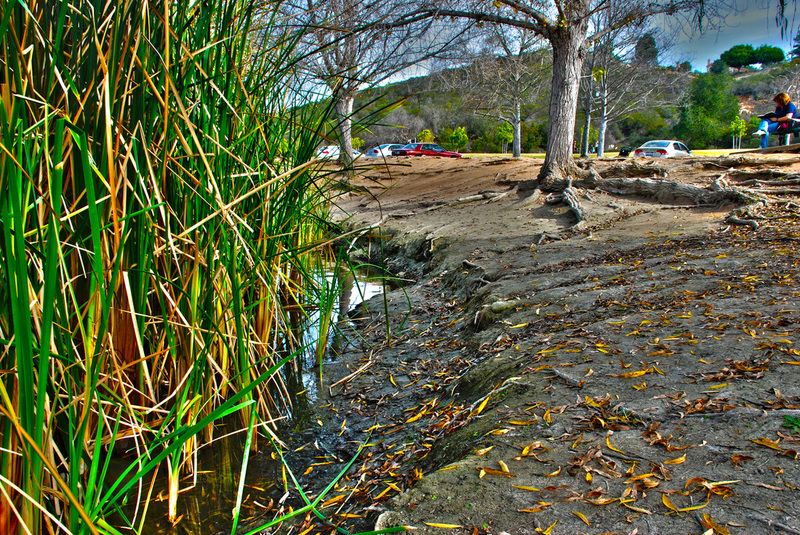 I took this photo at San Elijo Lagoon. I like the bridge and the bare trees around it. 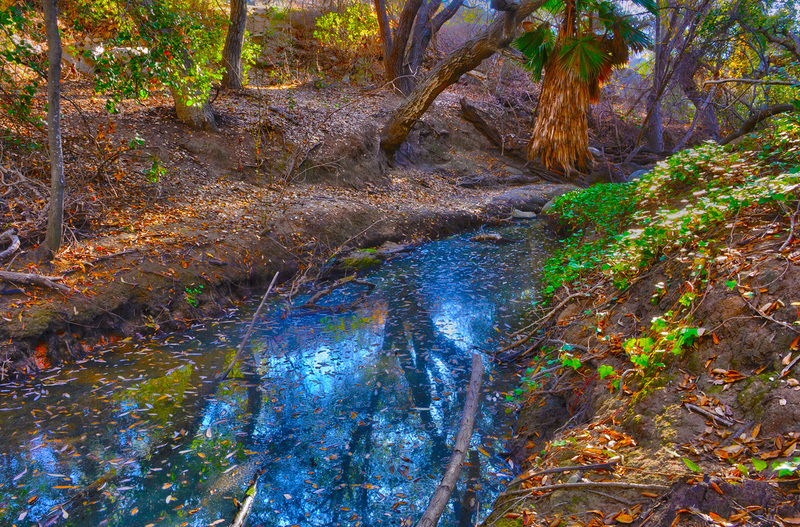 My picture is an HDR photograph of a small river at the duck pond. I titled it “The Leaves Have Fallen”, because the setting of the picture shows the hundreds of leaves that have fallen from the trees. To make this picture, I took 5 identical pictures with different exposures ranging from -1.0 to +1.0 with intervals of .5. After taking 5 pictures, I opened them in Photoshop and used “Merged to HDR Pro”, to get one final picture. After this, I edited the contrast, brightness, shadows, etc. to my liking to create the final picture. The reason why I like this photo the most is because I was inspired by HDR photos and Trey Ratcliff, and I am very proud with how my photo came out. Being a fan of HDR makes me more proud of my skills in photography, since I was able to take a type of photograph that I never could before. As an artist, I would describe myself as curious and determined. My creativity when it comes to the photograph I am taking, leads to trying different angles and compositions to see which fits the photo best. I have grown tremendously as an artist, starting from no experience, to learning the basics and fundamentals of photography. I am looking forward to growing as an artist and using my newly acquired knowledge of photography for the future.